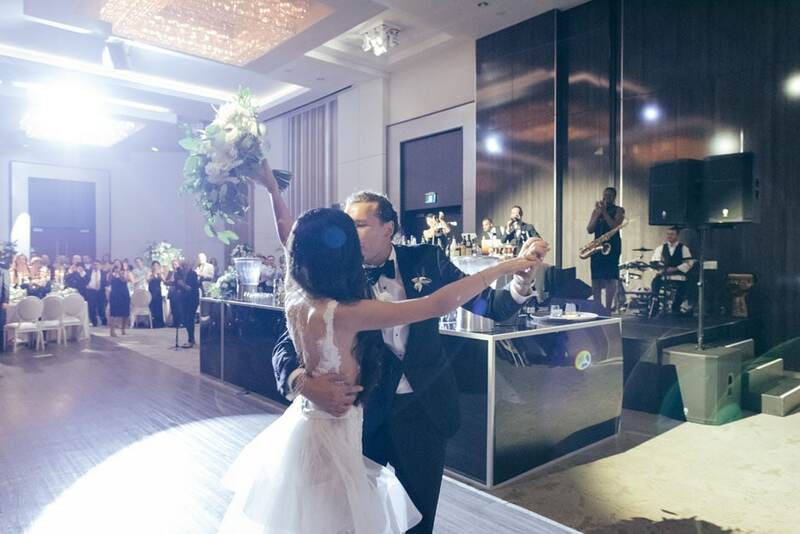 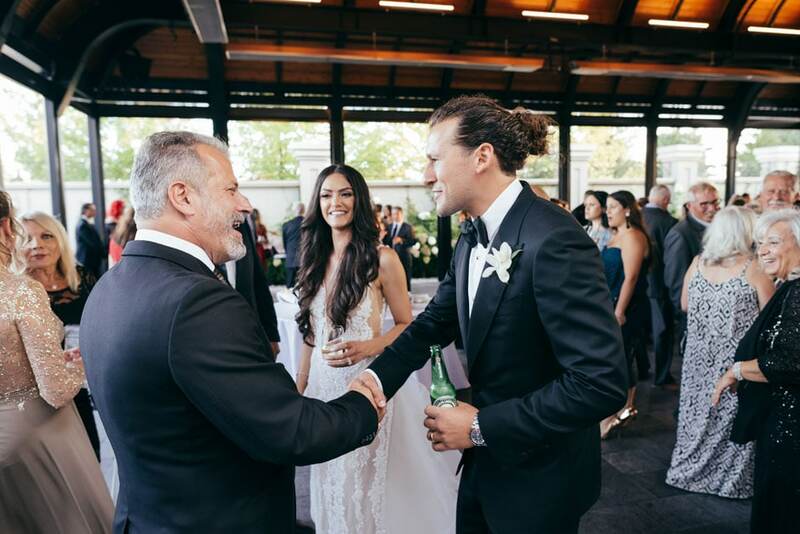 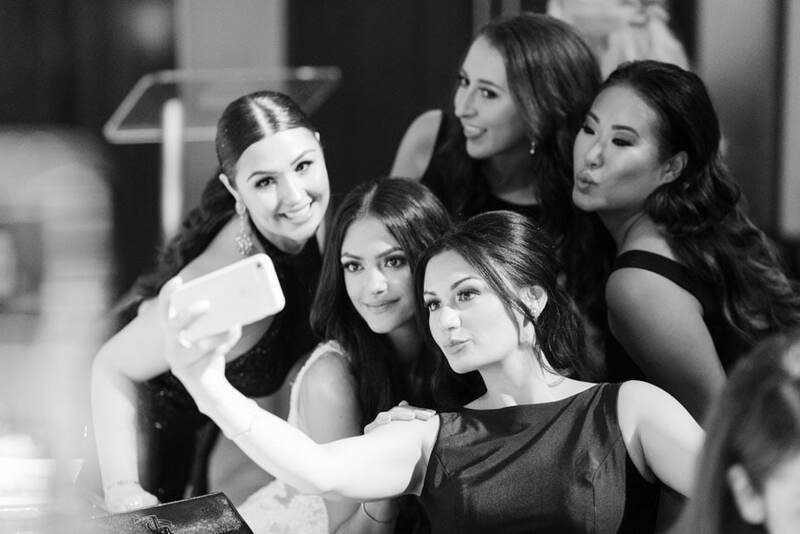 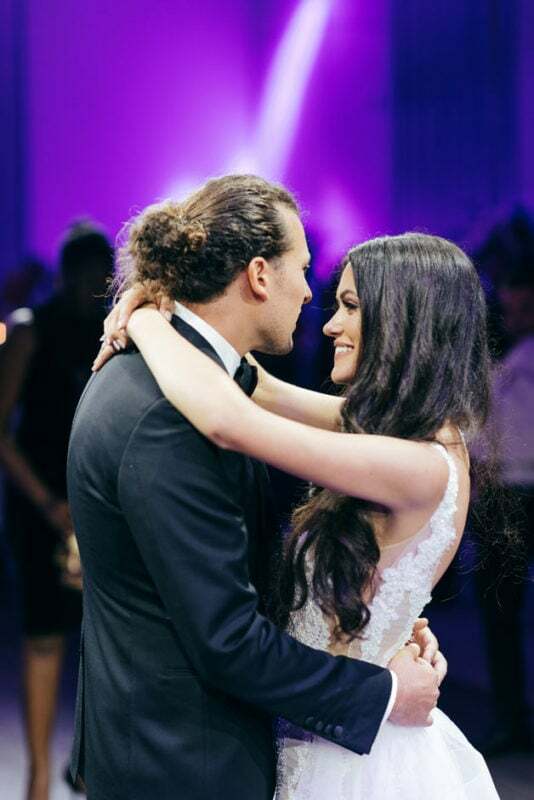 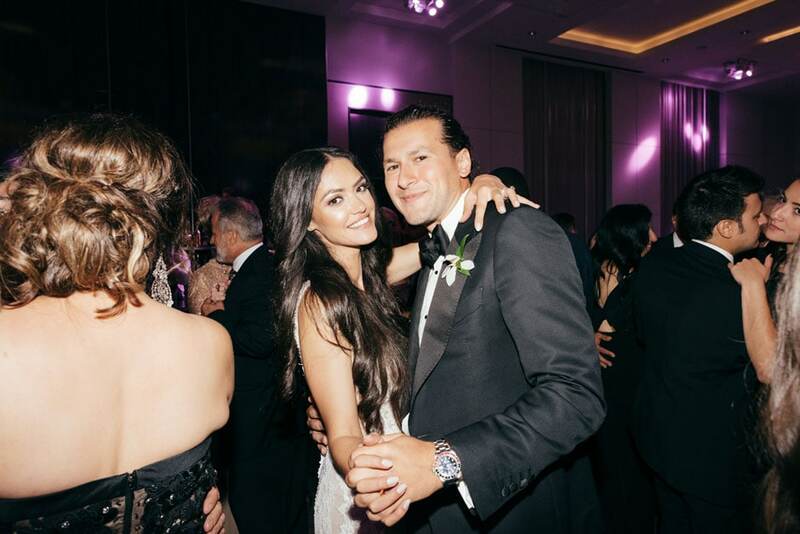 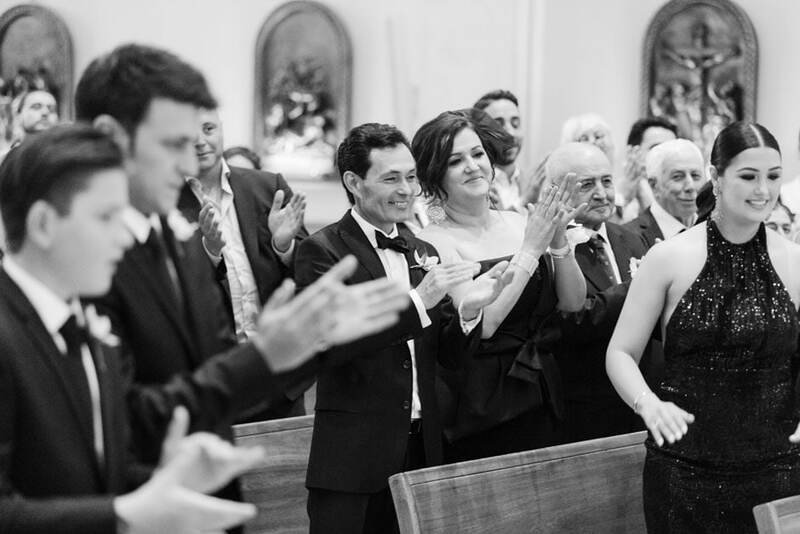 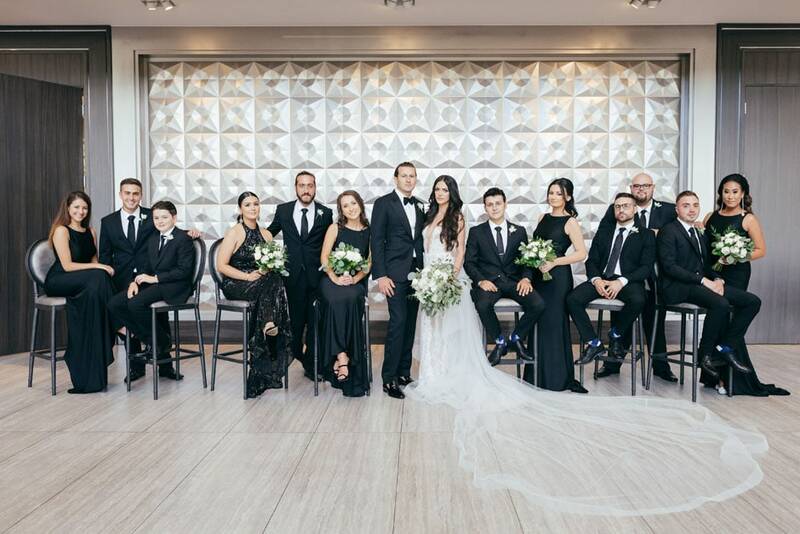 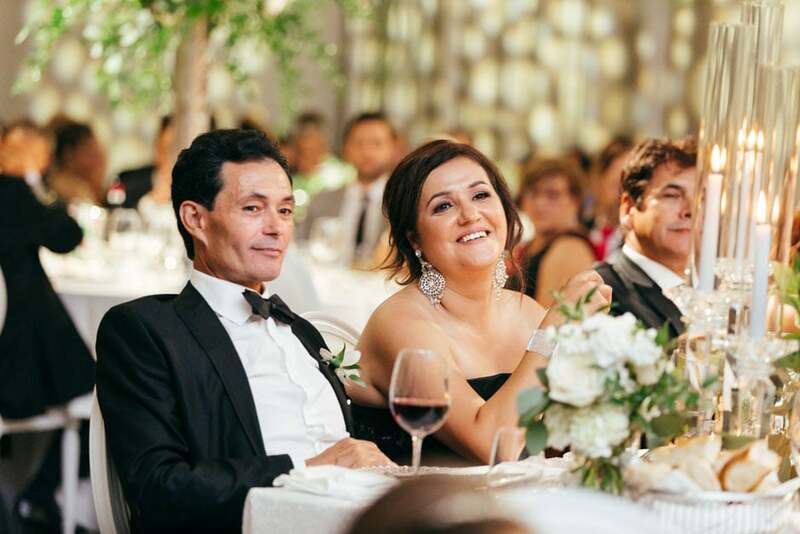 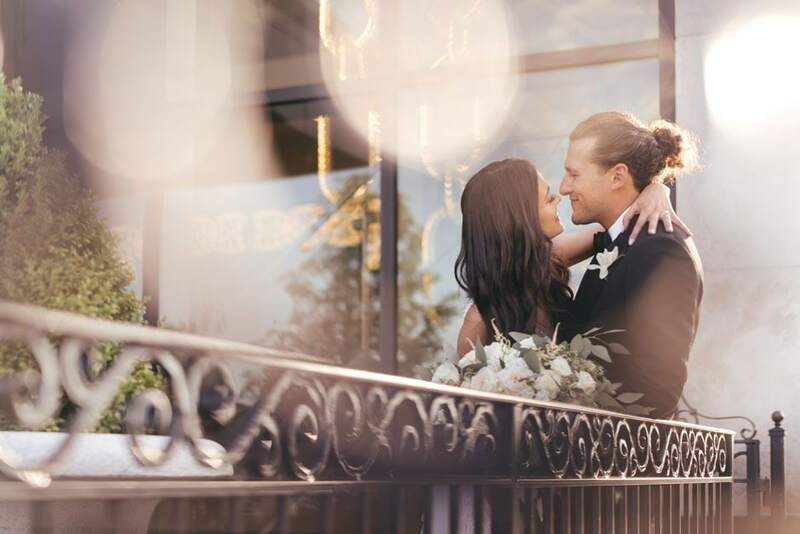 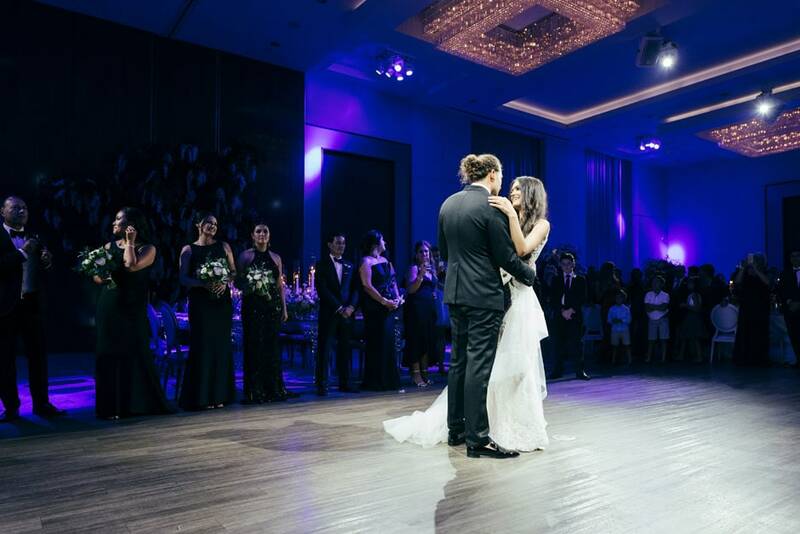 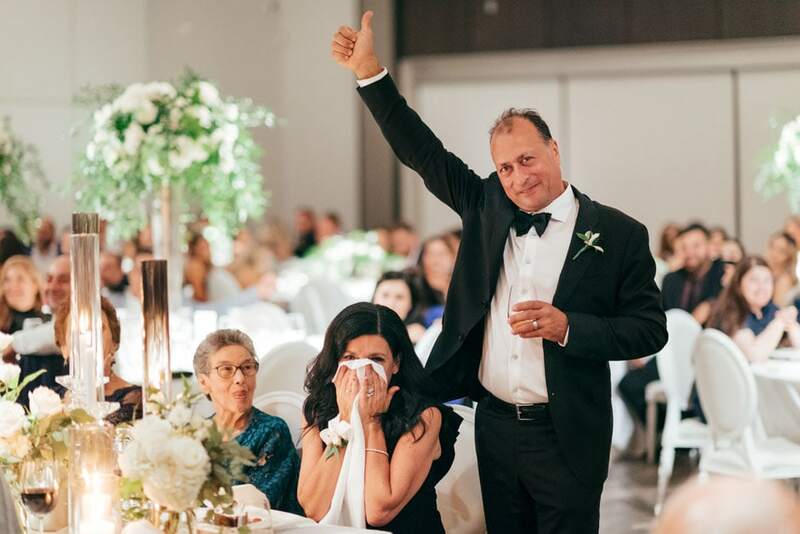 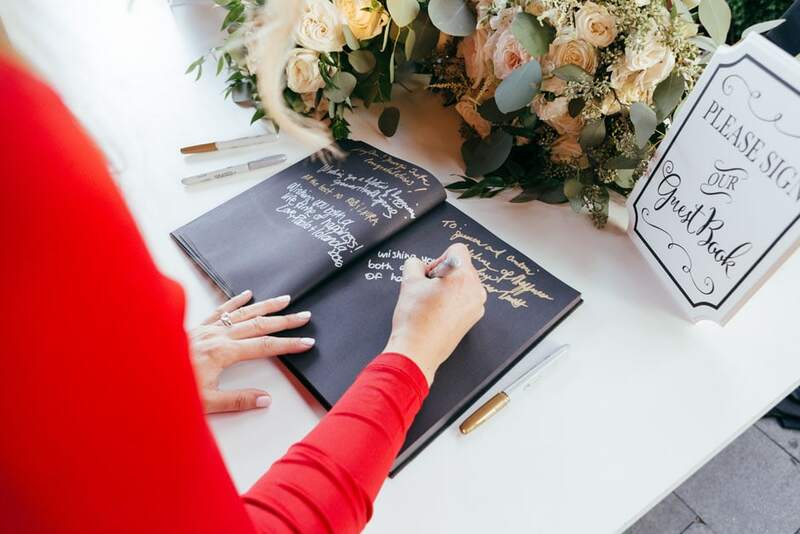 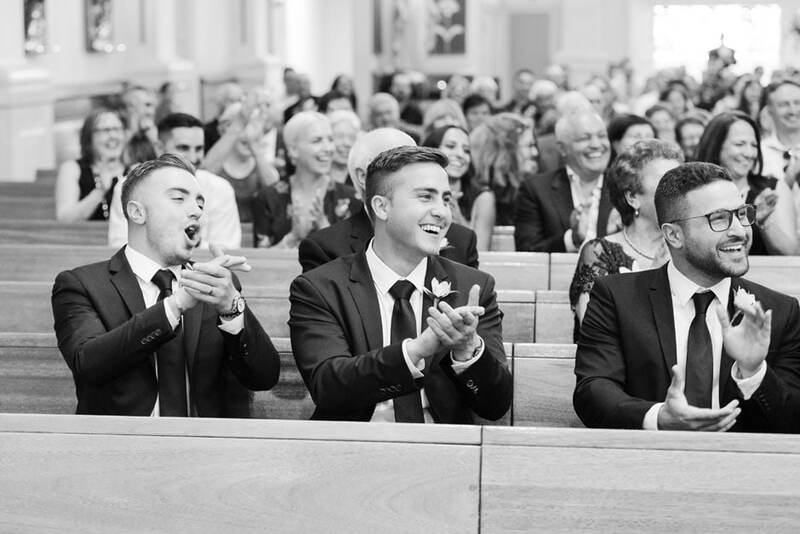 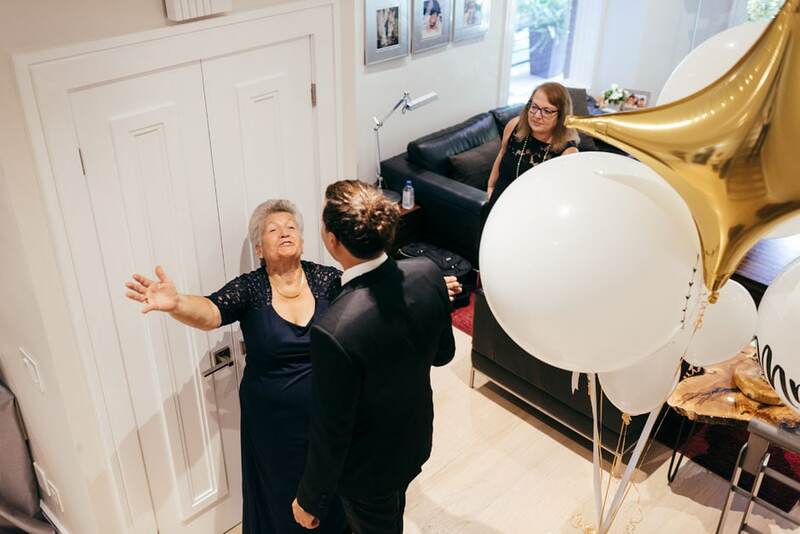 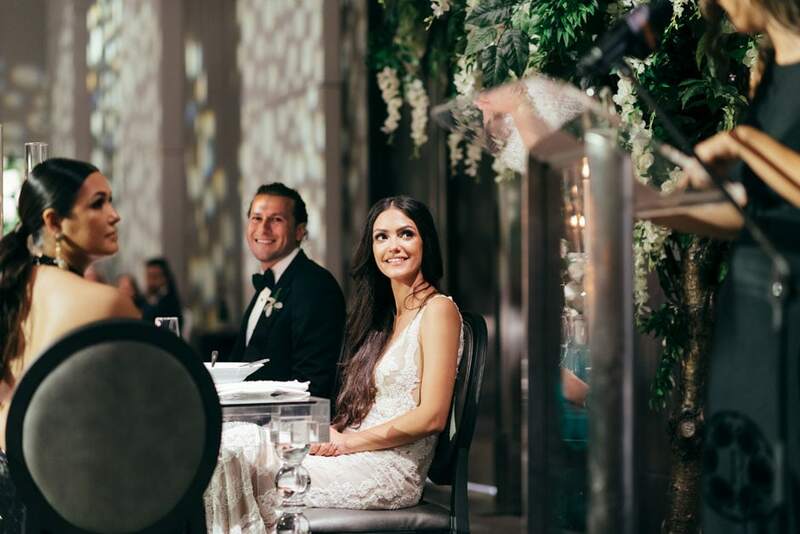 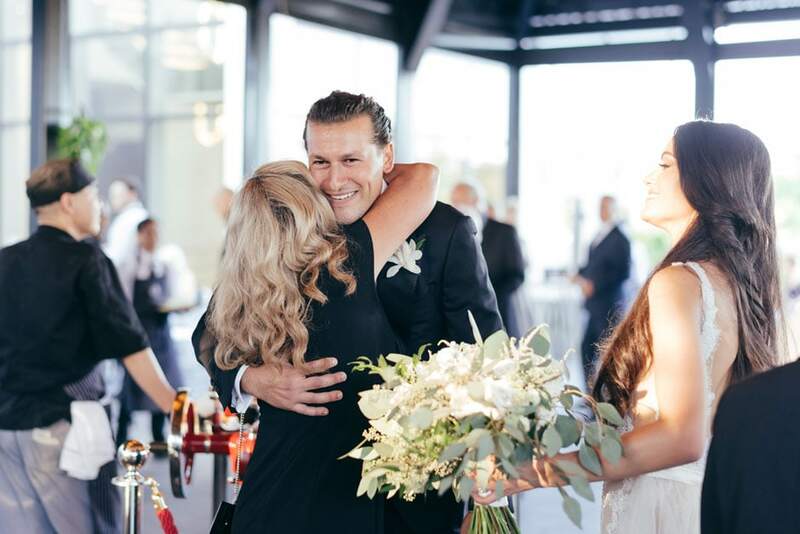 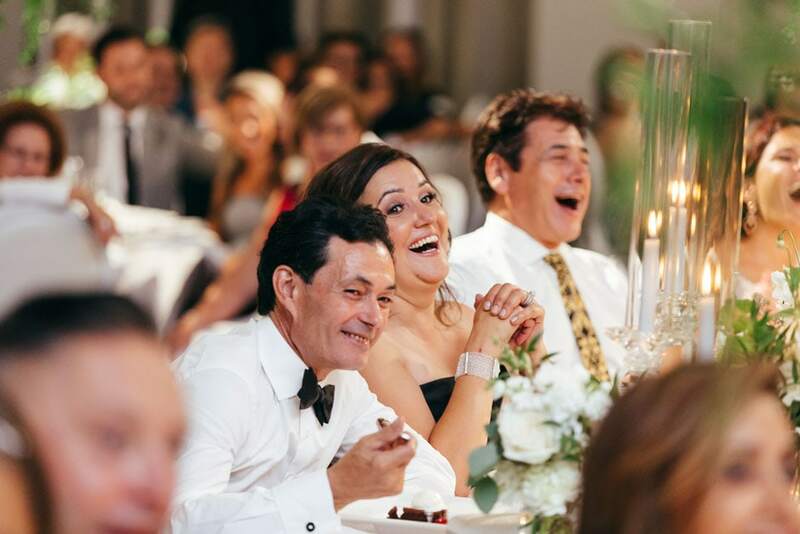 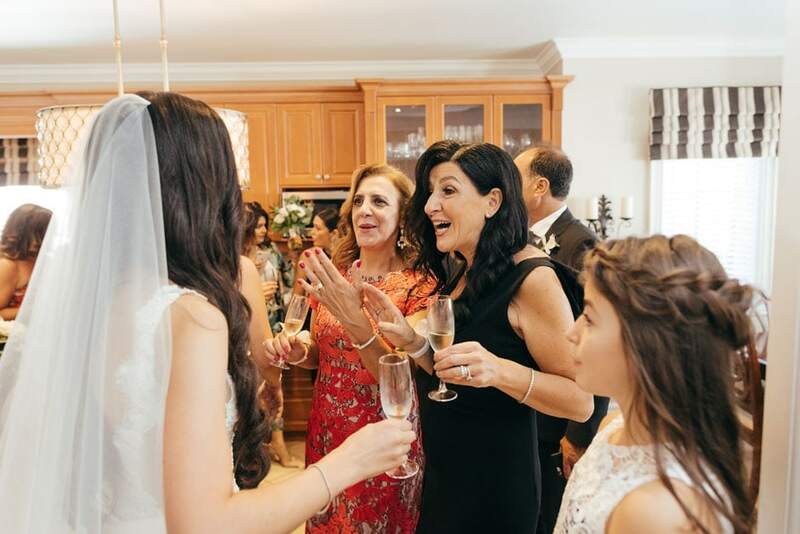 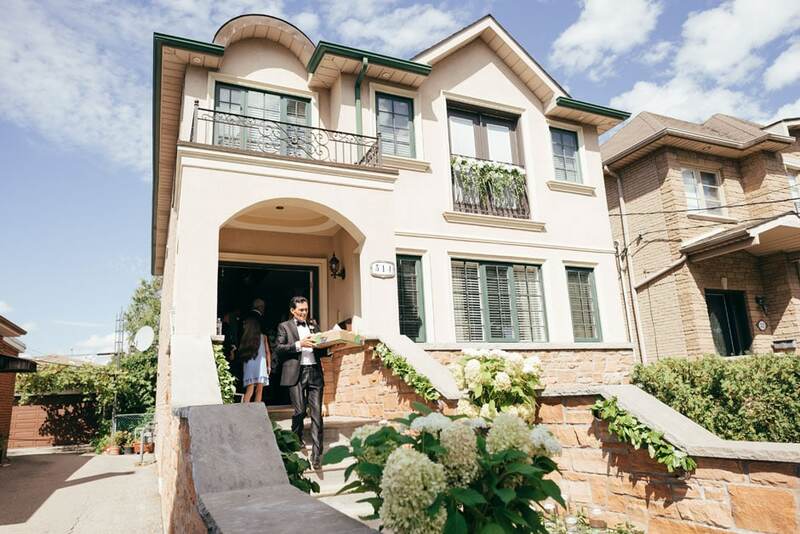 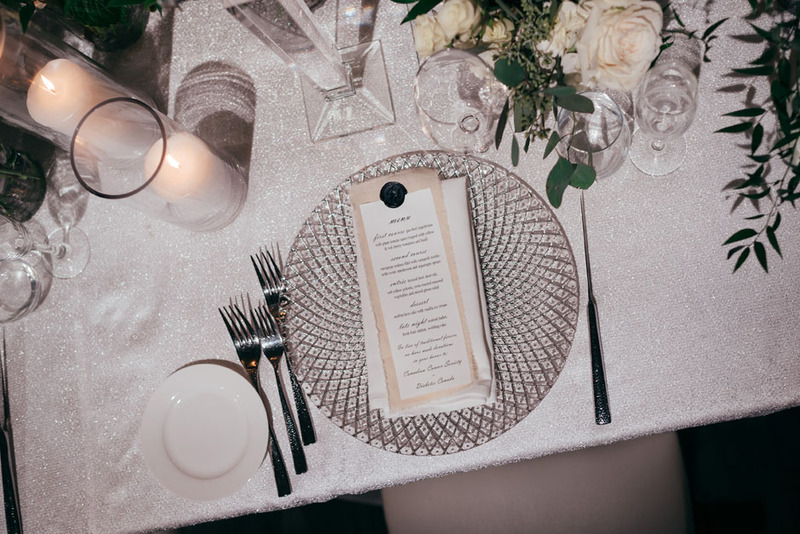 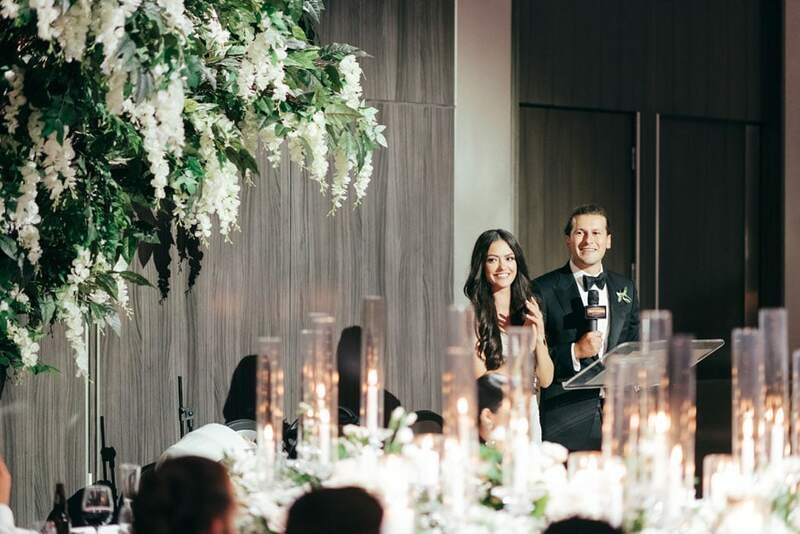 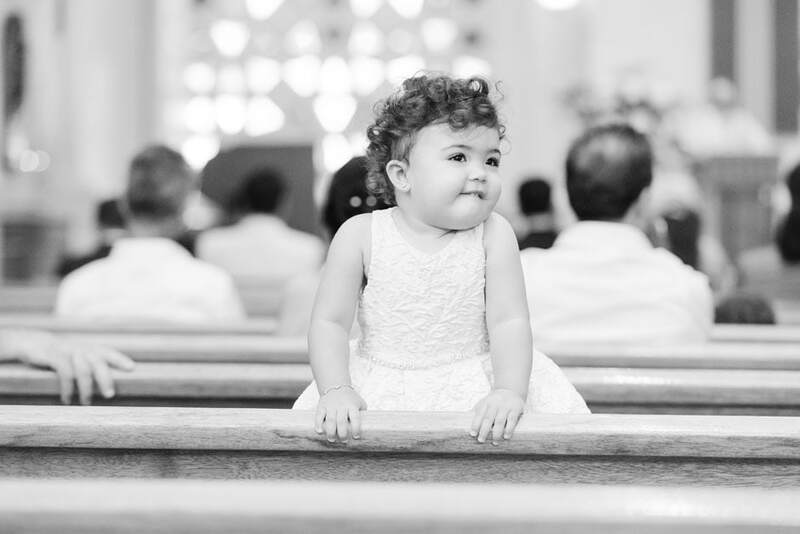 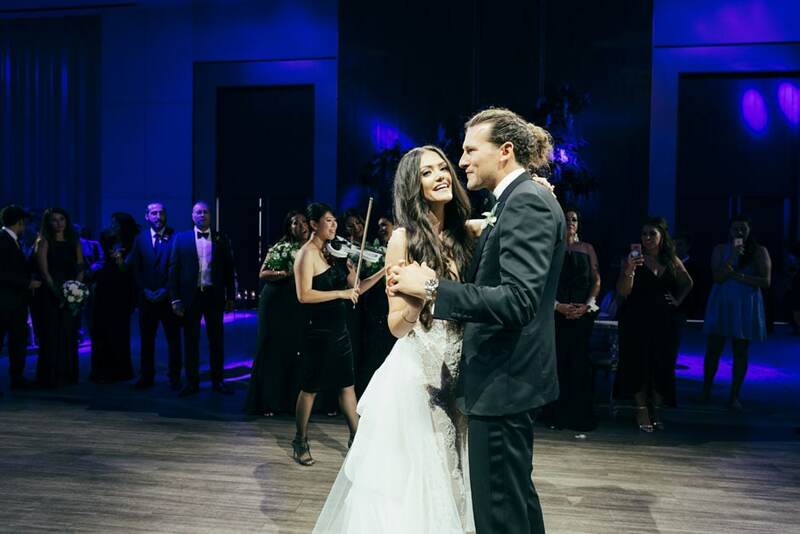 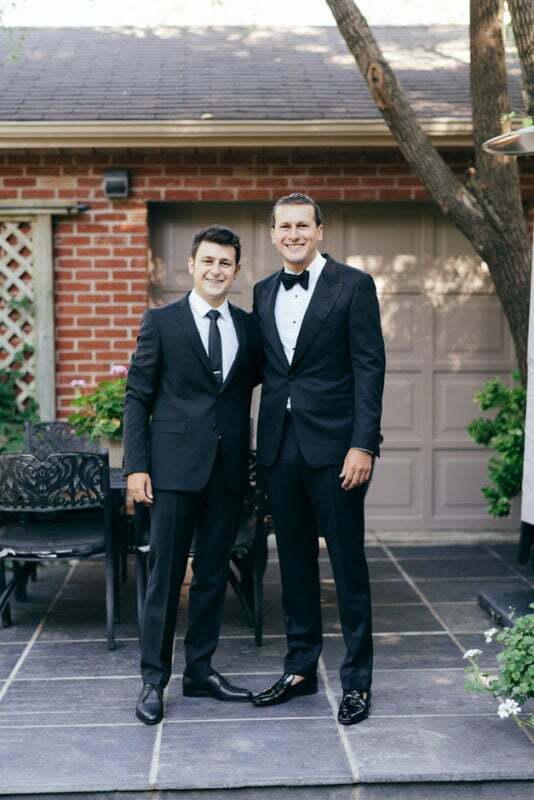 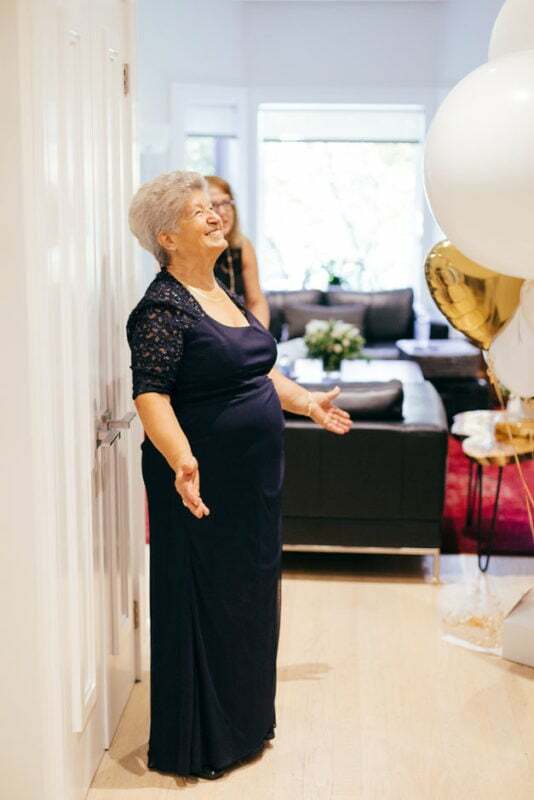 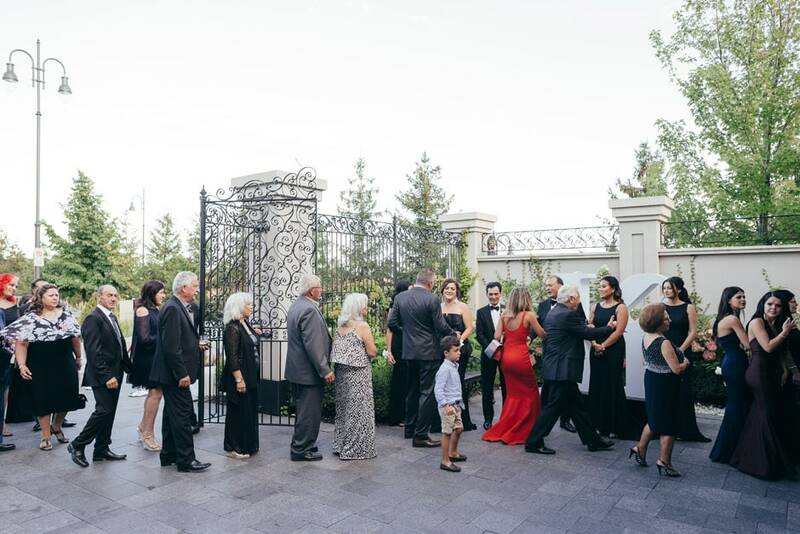 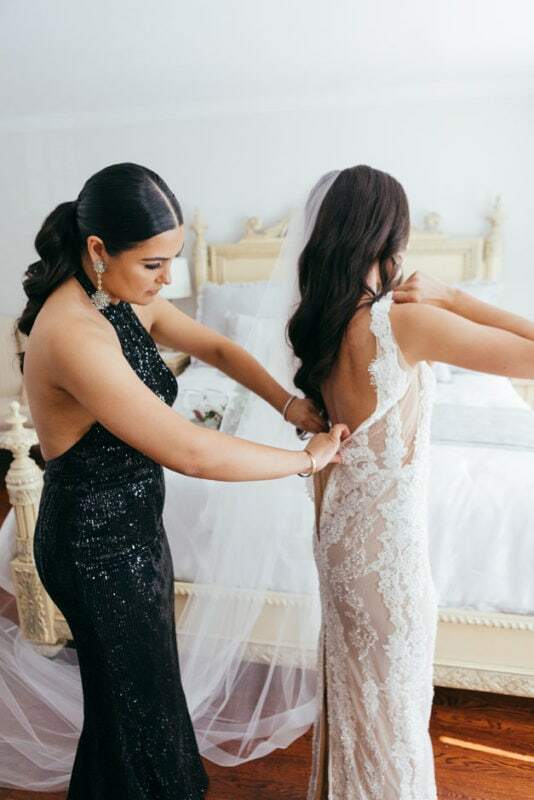 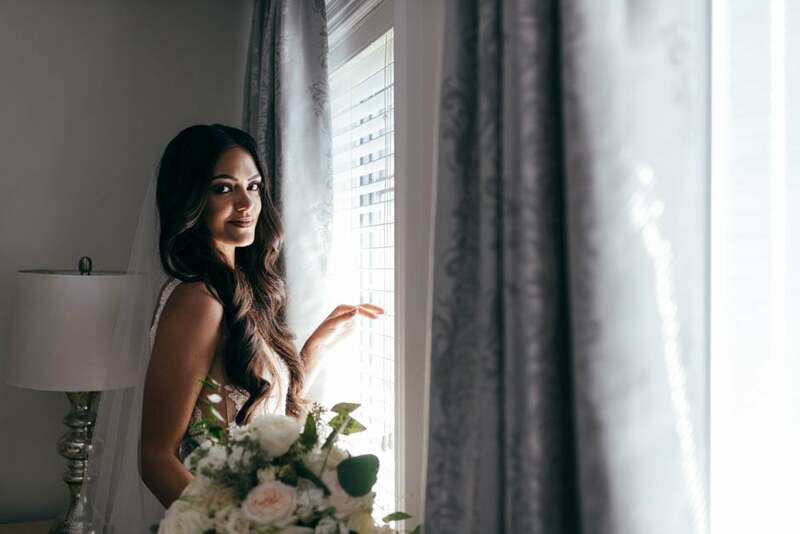 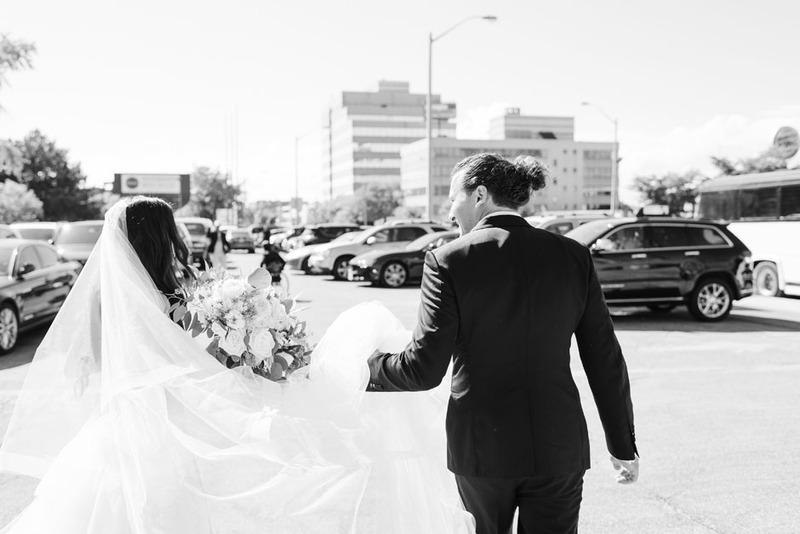 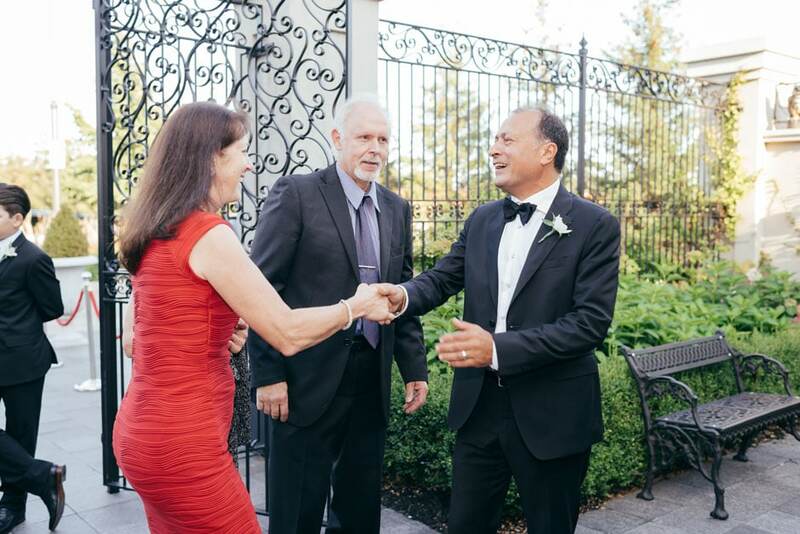 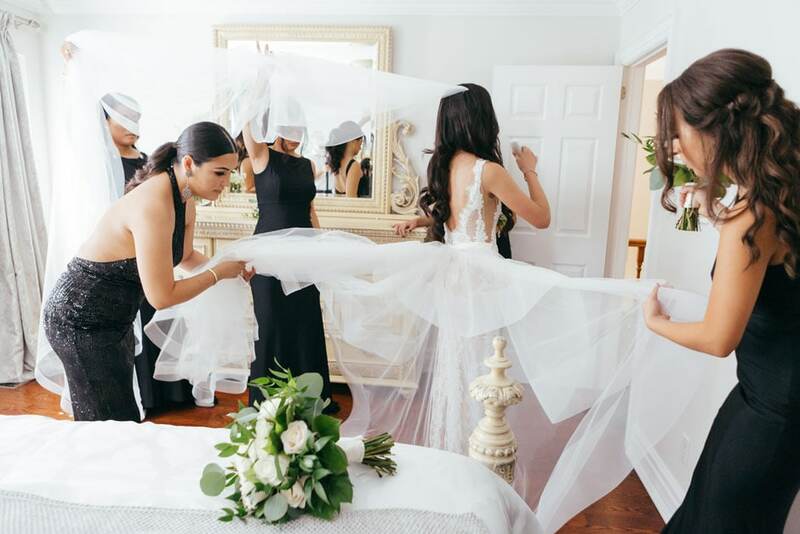 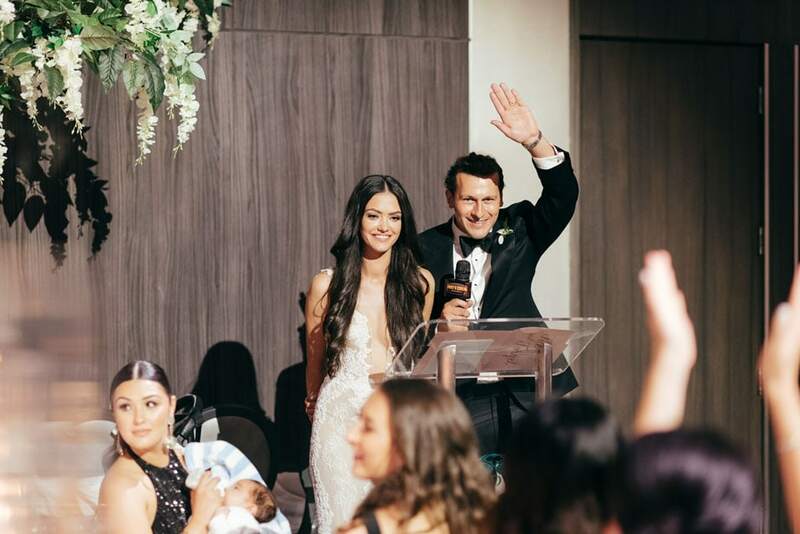 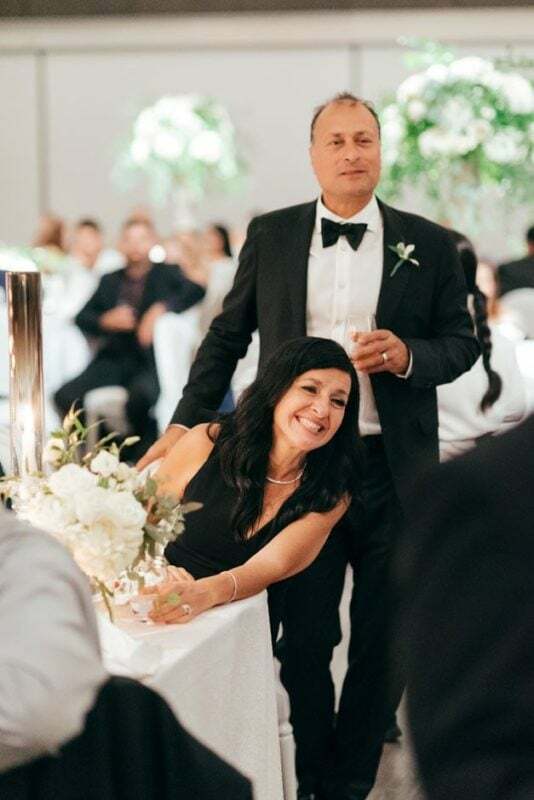 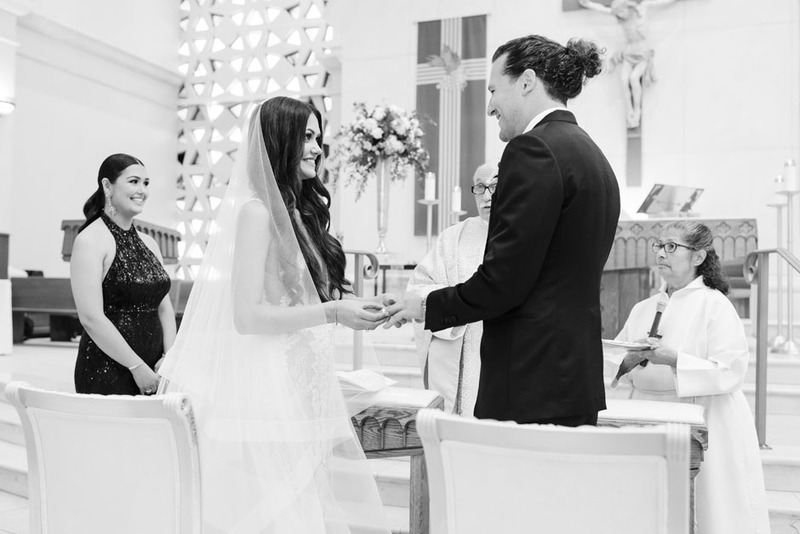 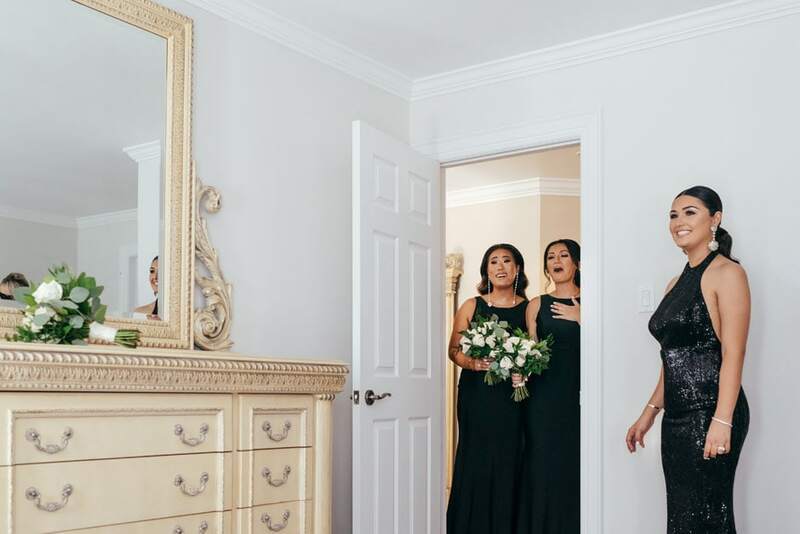 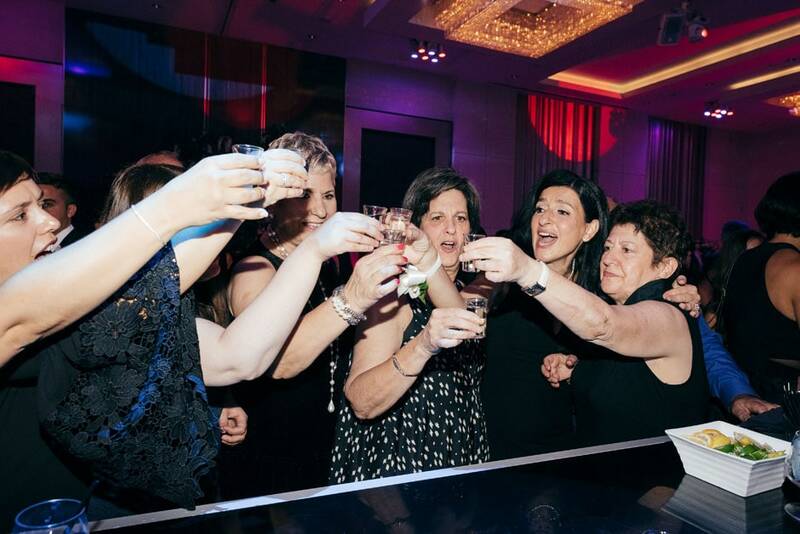 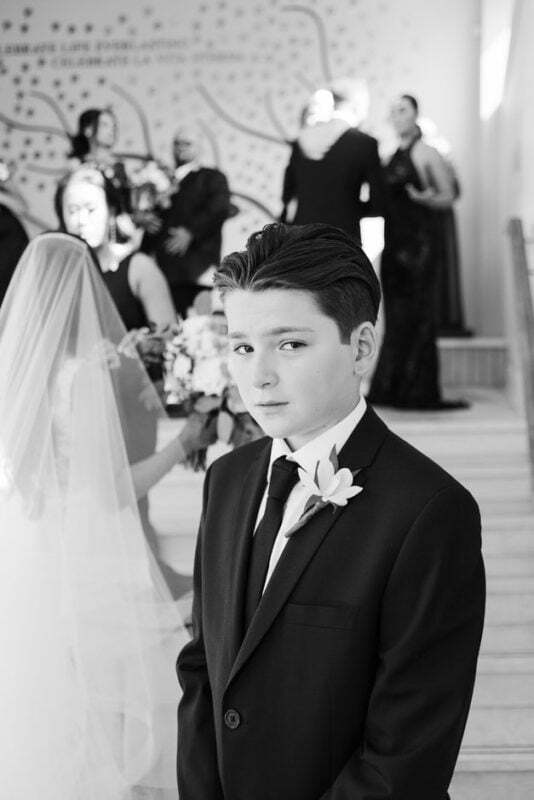 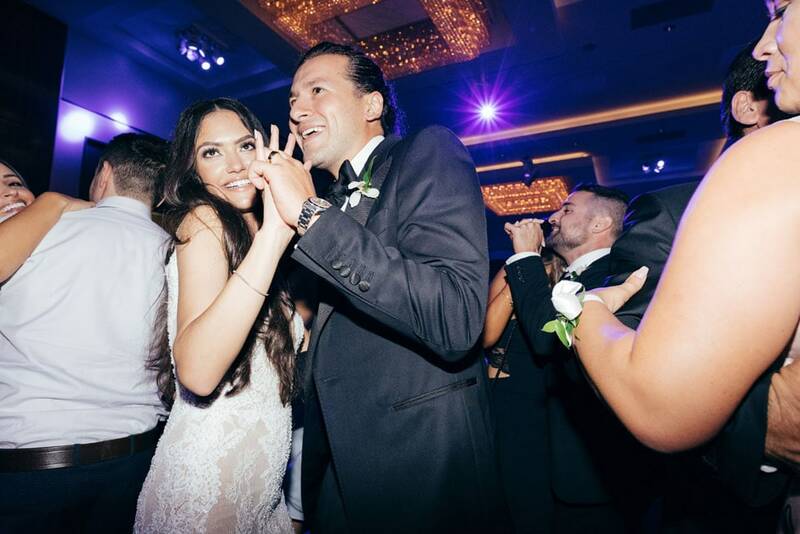 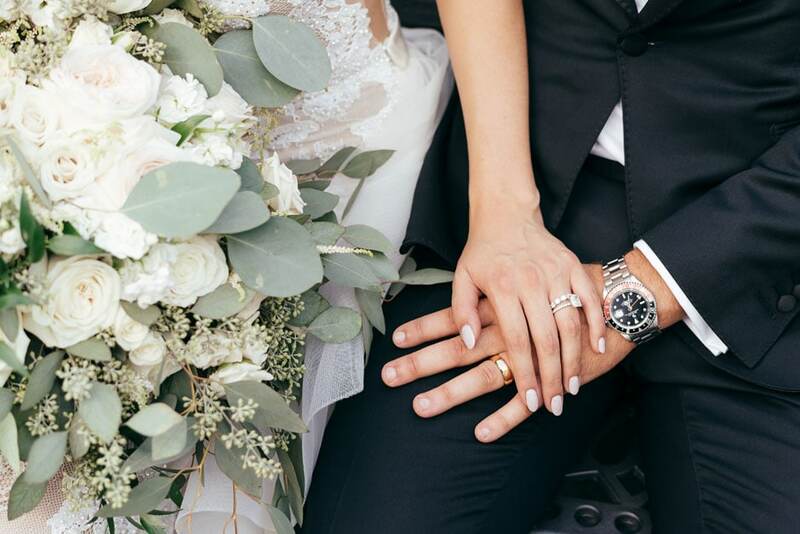 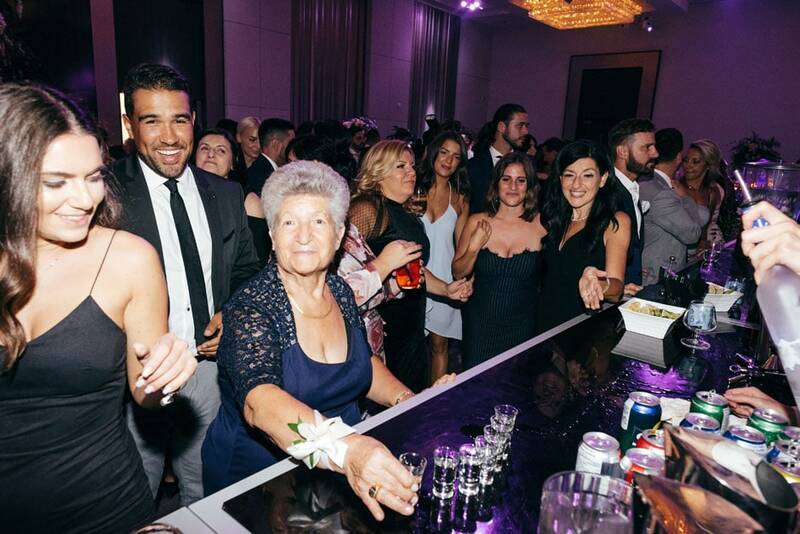 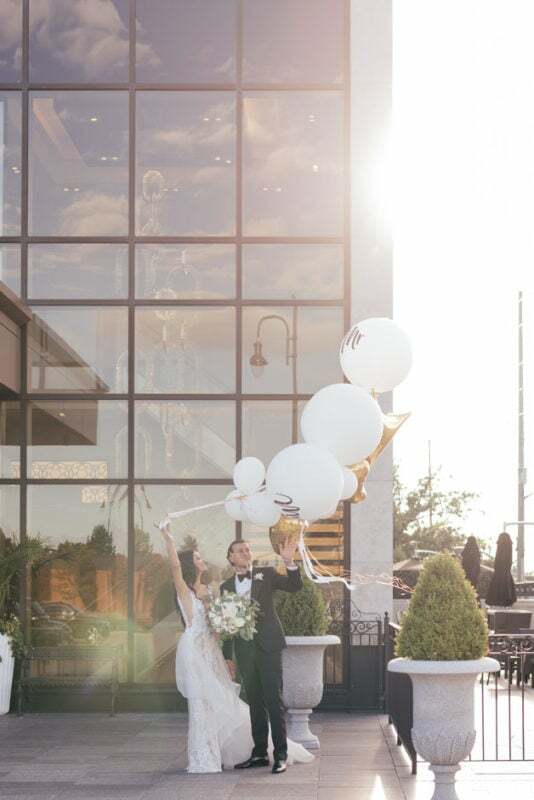 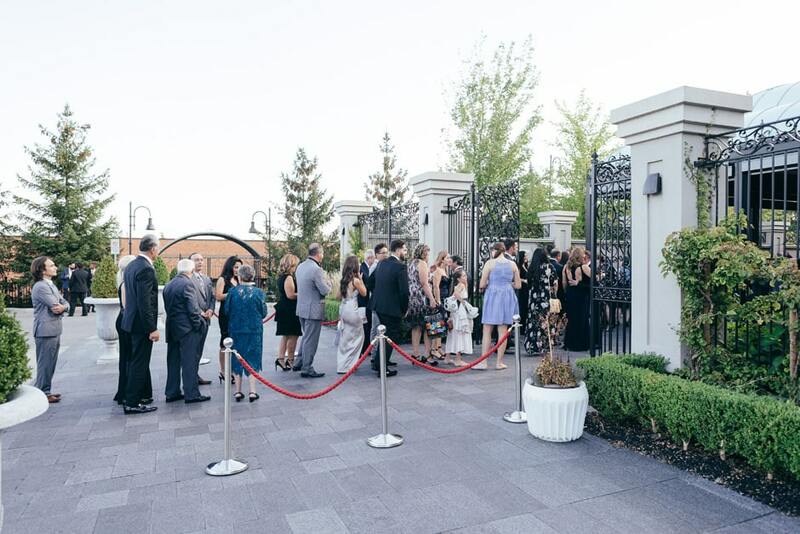 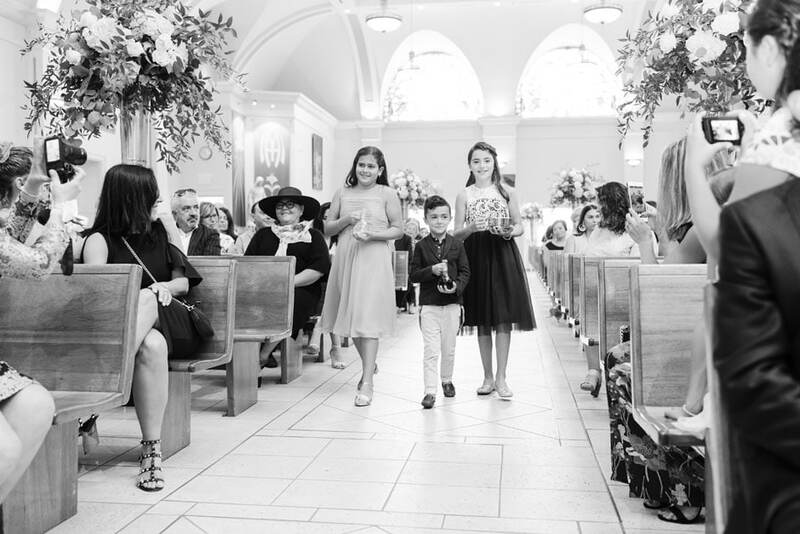 Not only was this Chateau Le Parc Vaughan wedding a perfect mix of beauty and luxury, family and friends, and superb entertainment, it truly was a celebration of the enduring love between Jessica and Antoni. 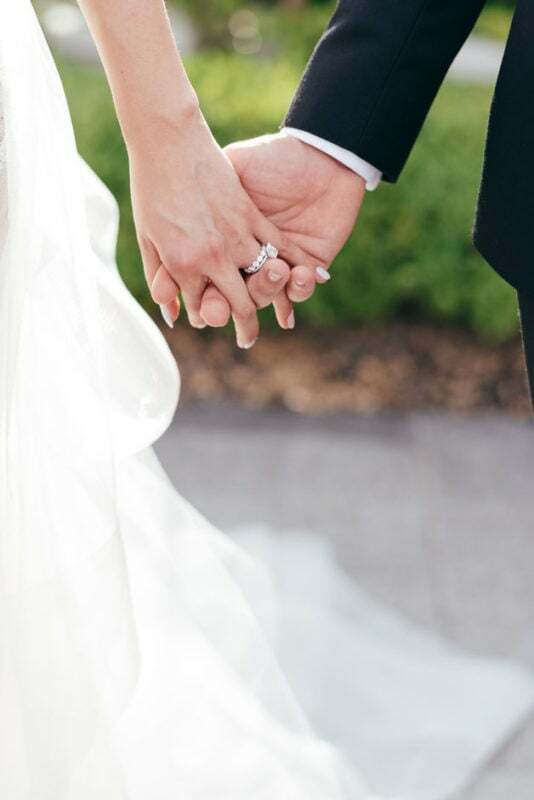 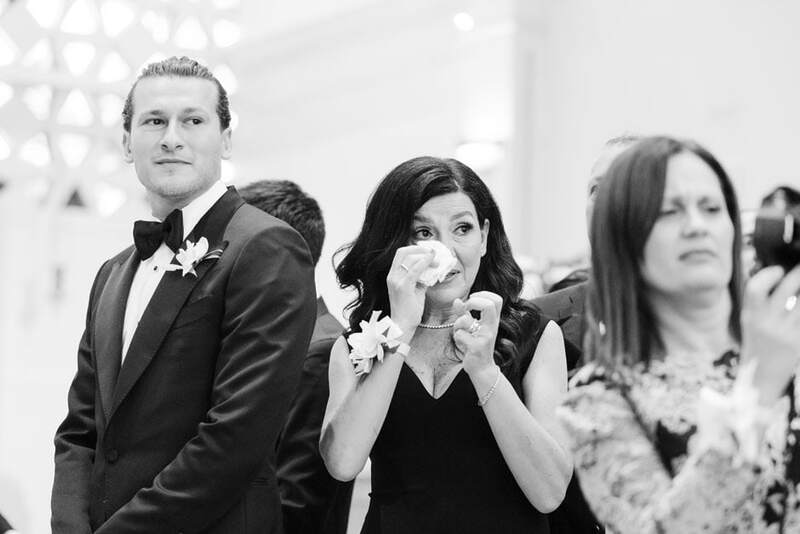 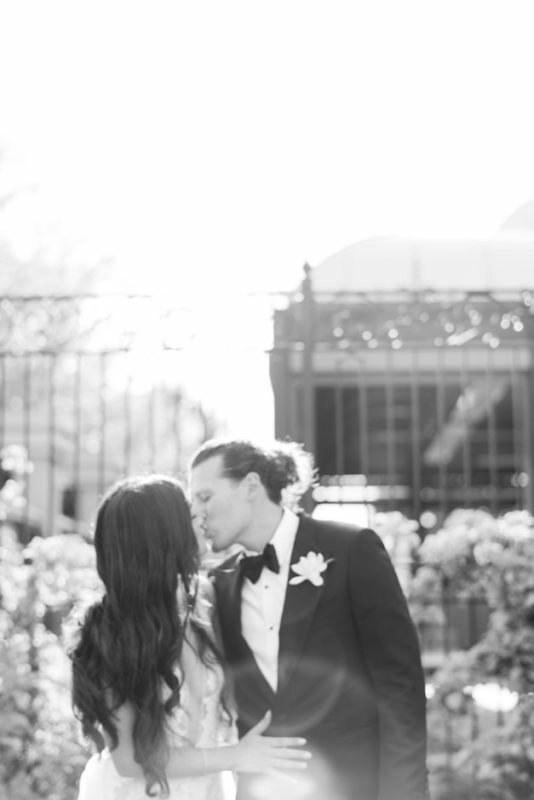 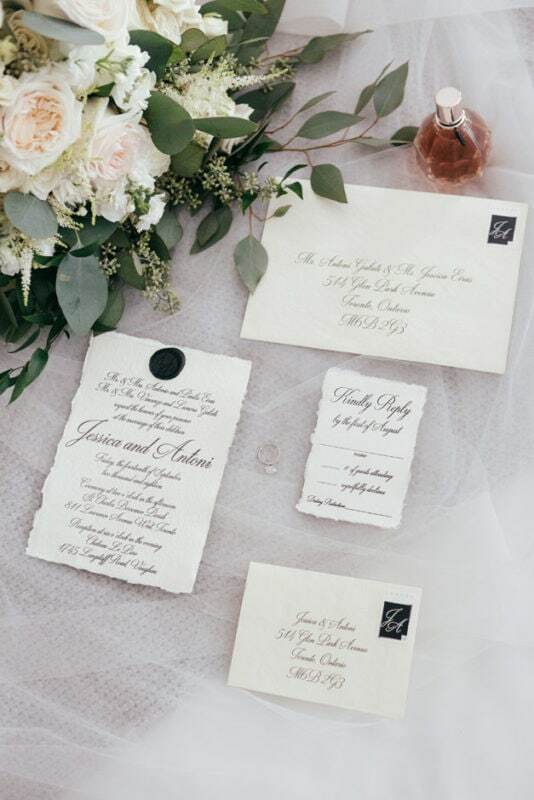 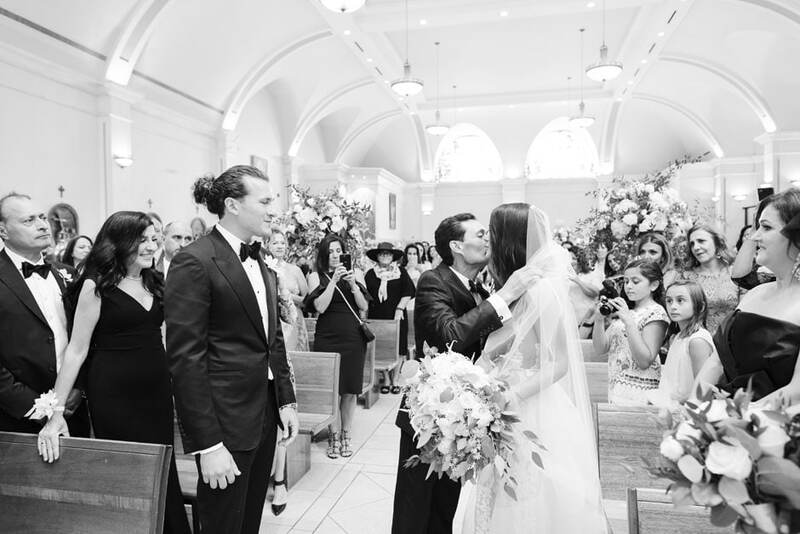 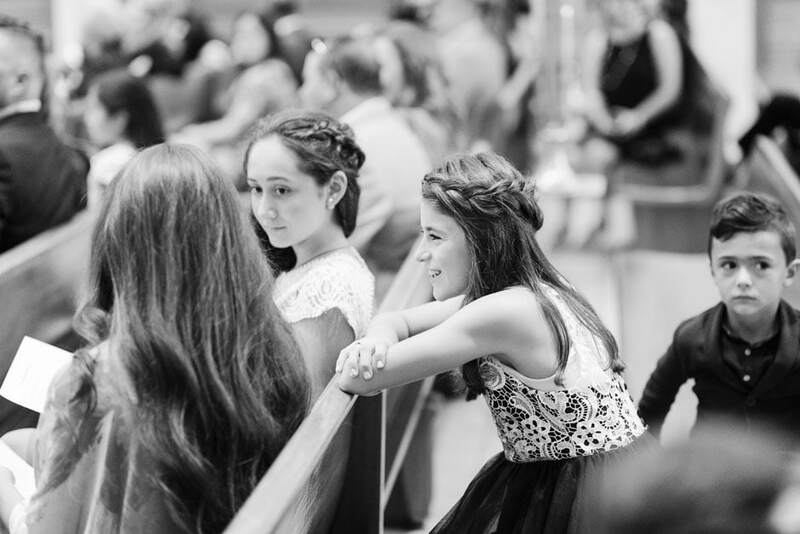 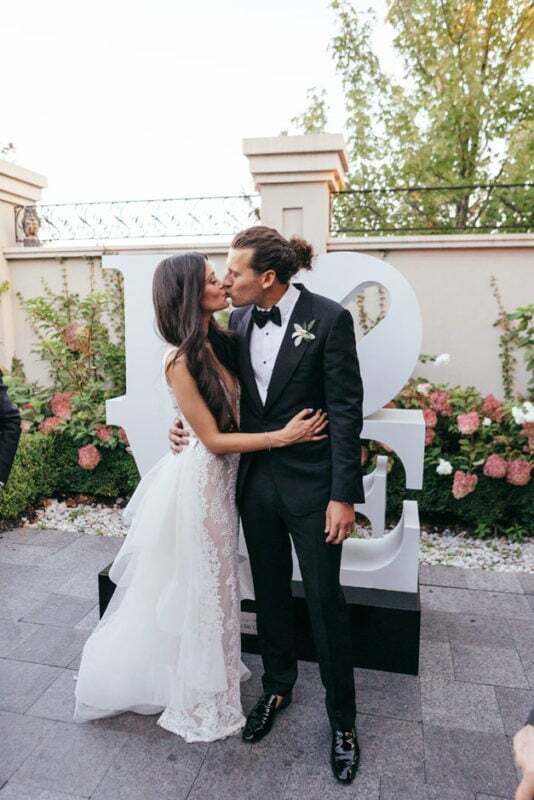 What could be more special than high school sweethearts getting married? 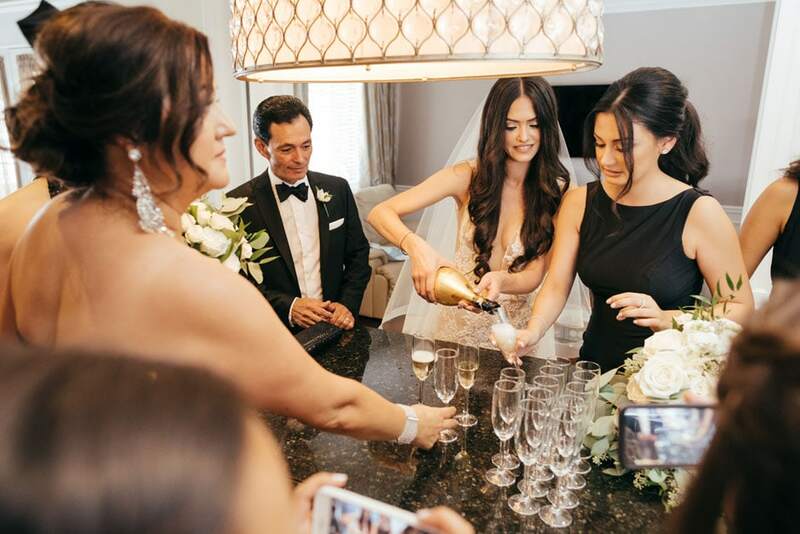 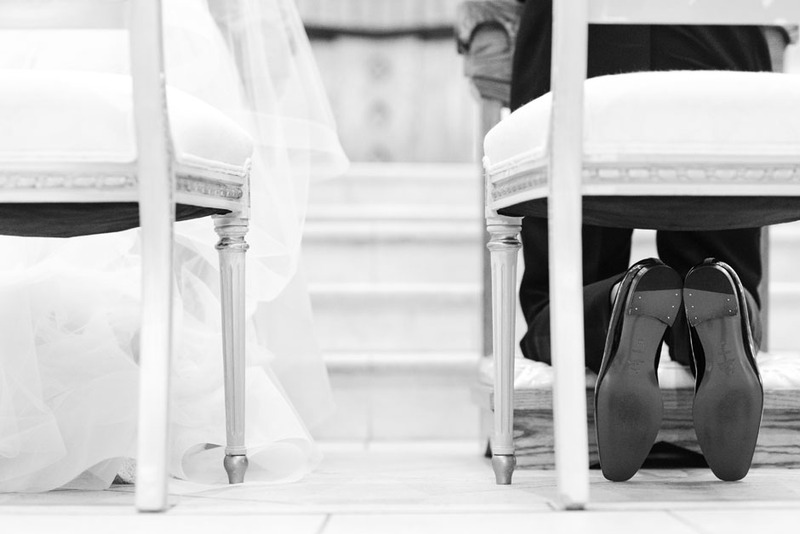 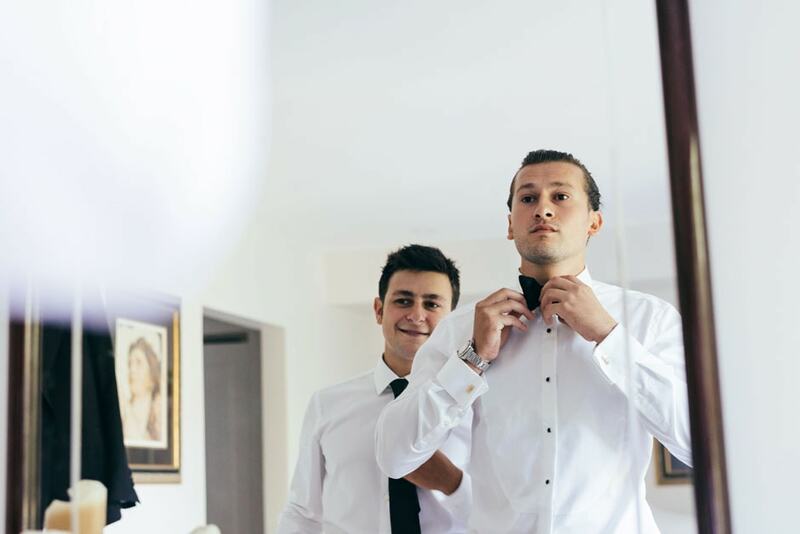 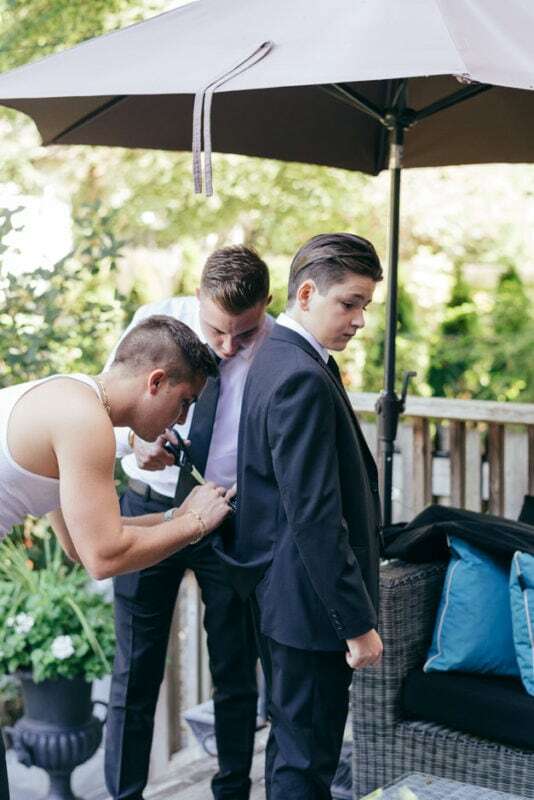 Try high school sweethearts getting married surrounded by loved ones amidst the luxurious ambience of a Chateau Le Parc Vaughan wedding reception. 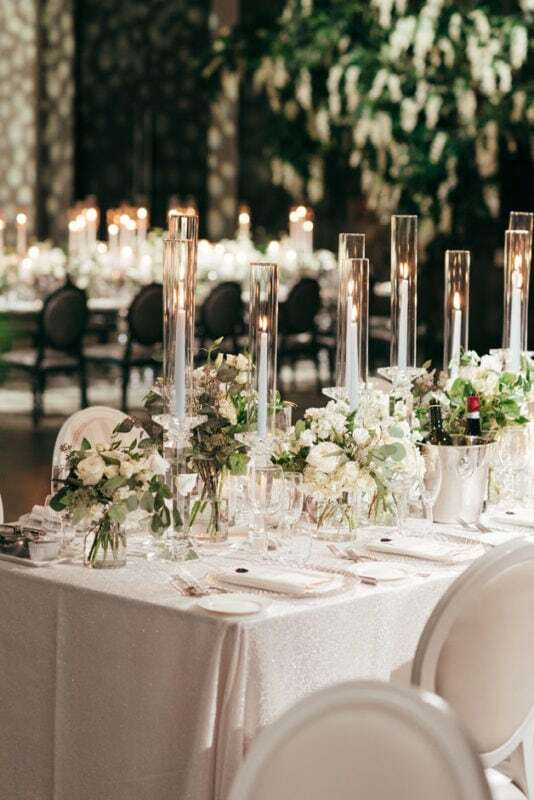 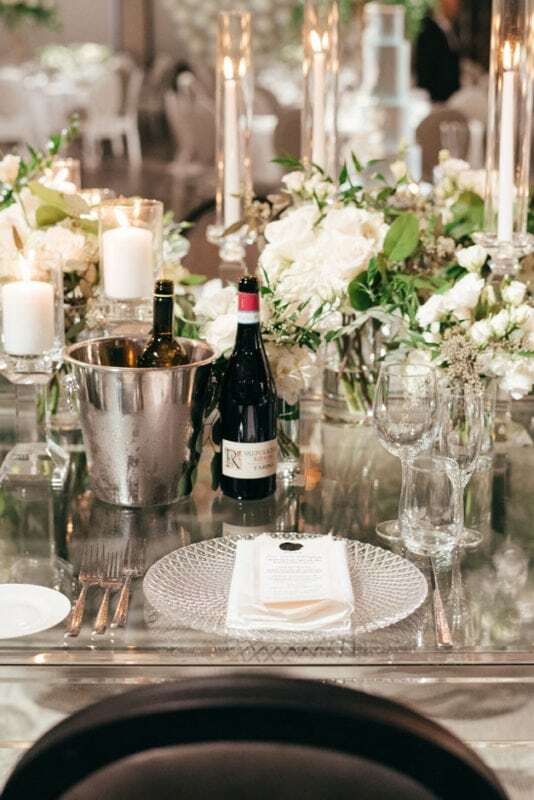 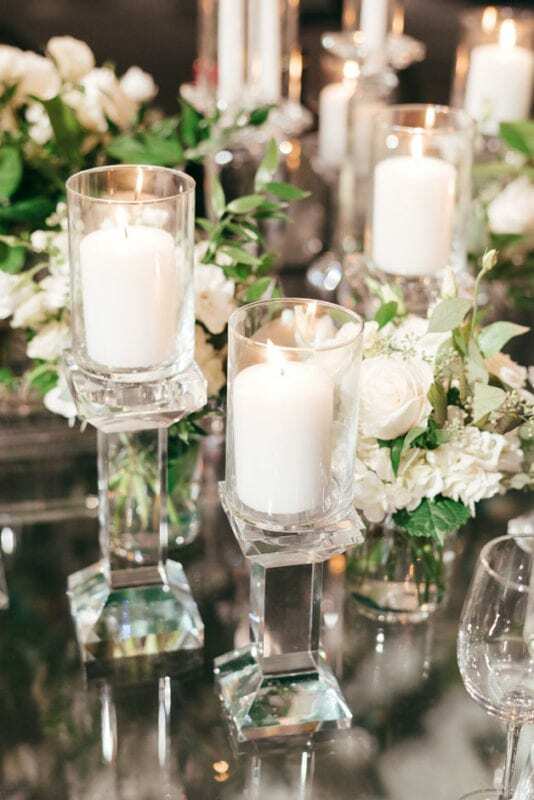 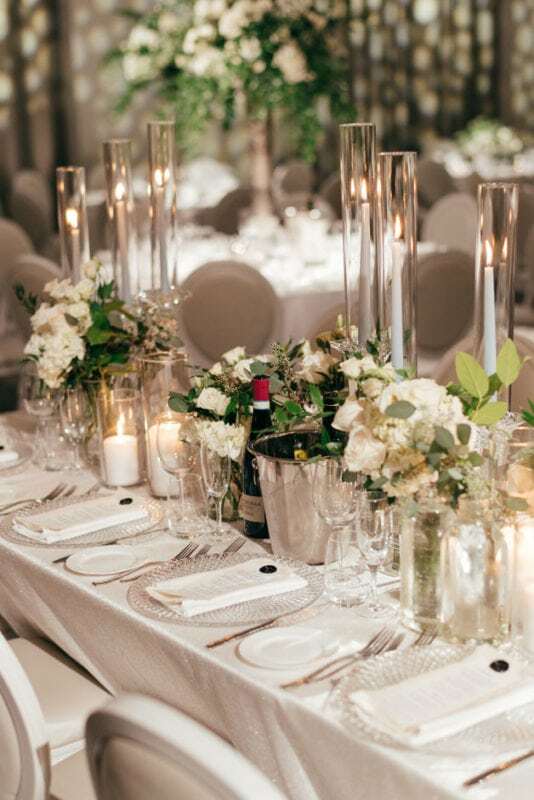 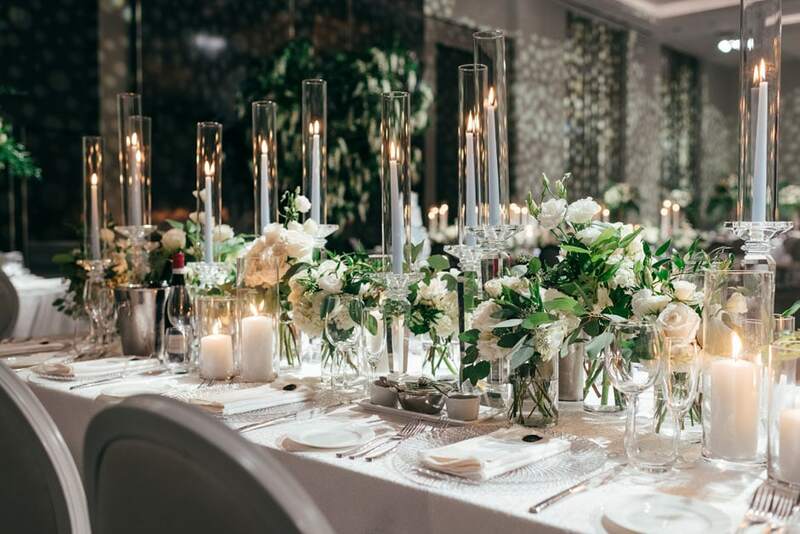 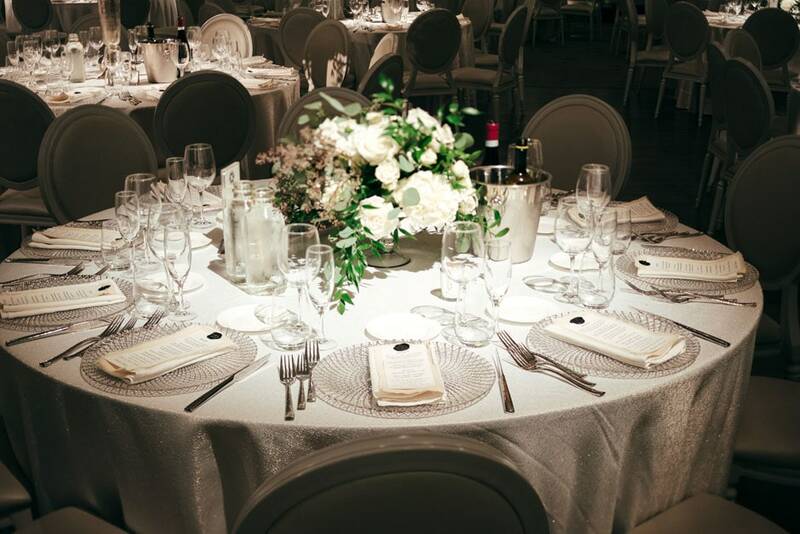 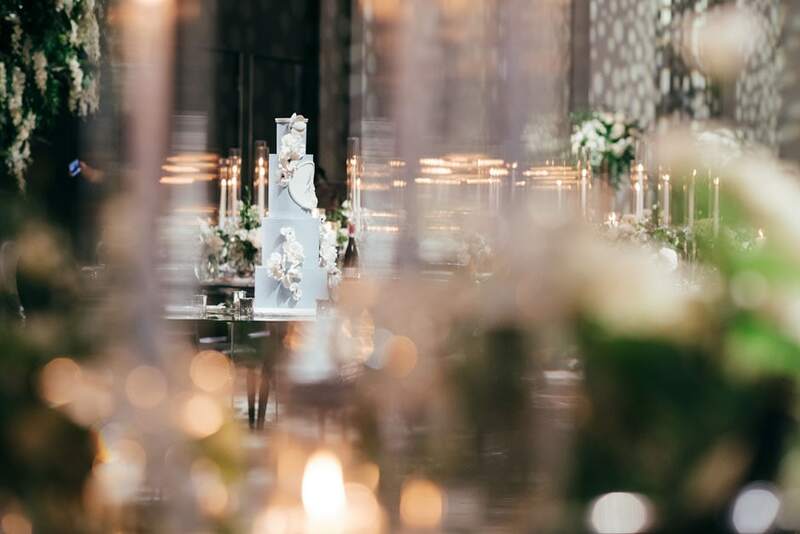 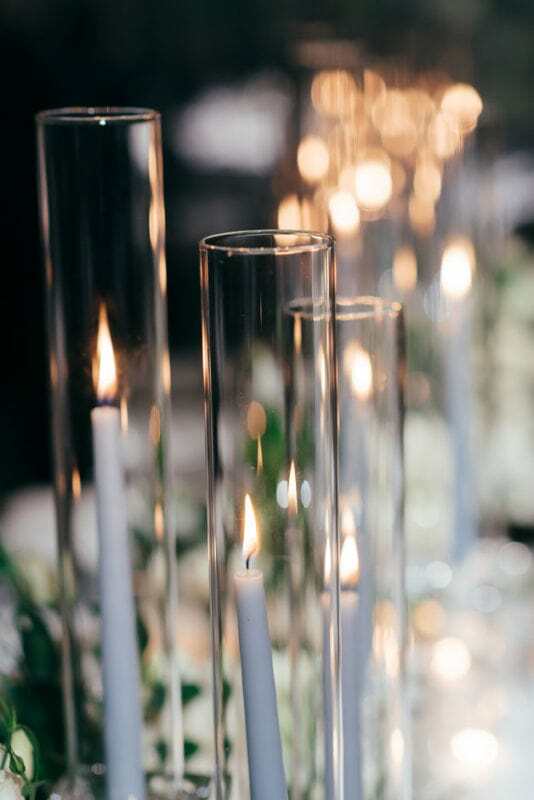 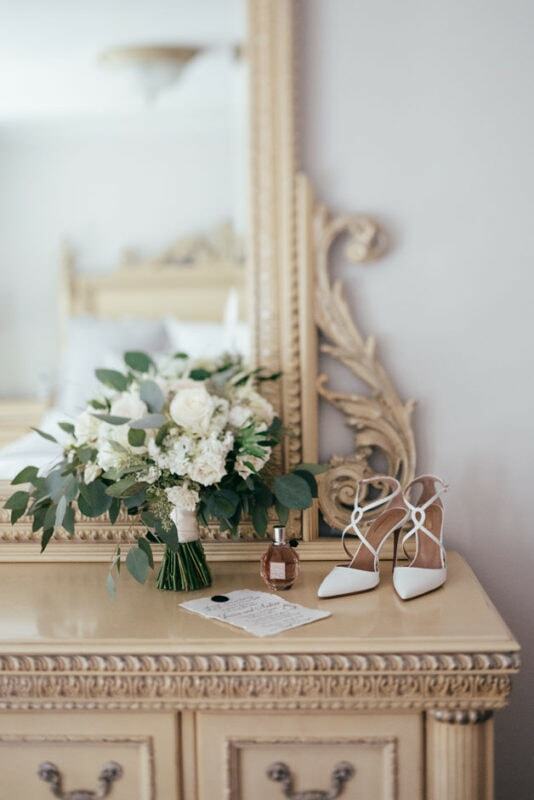 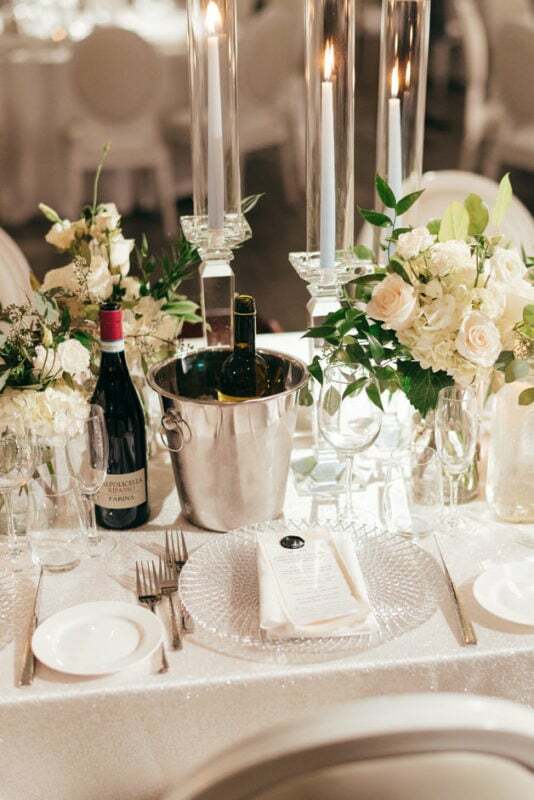 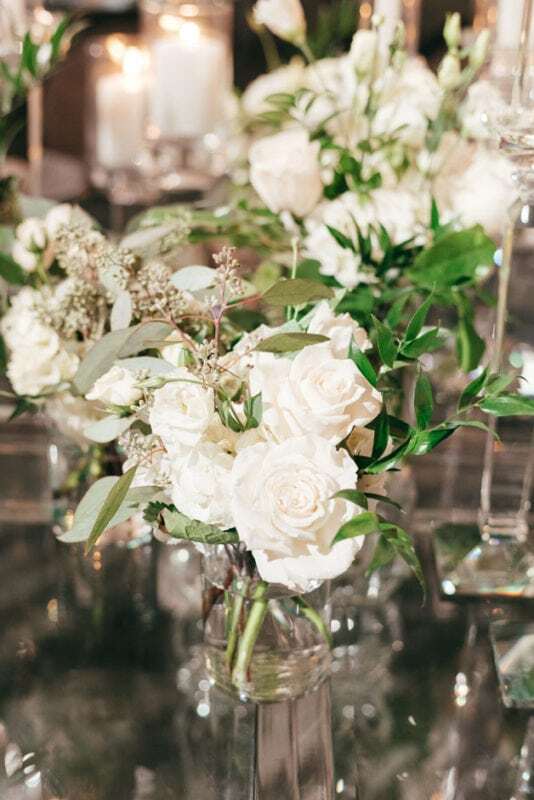 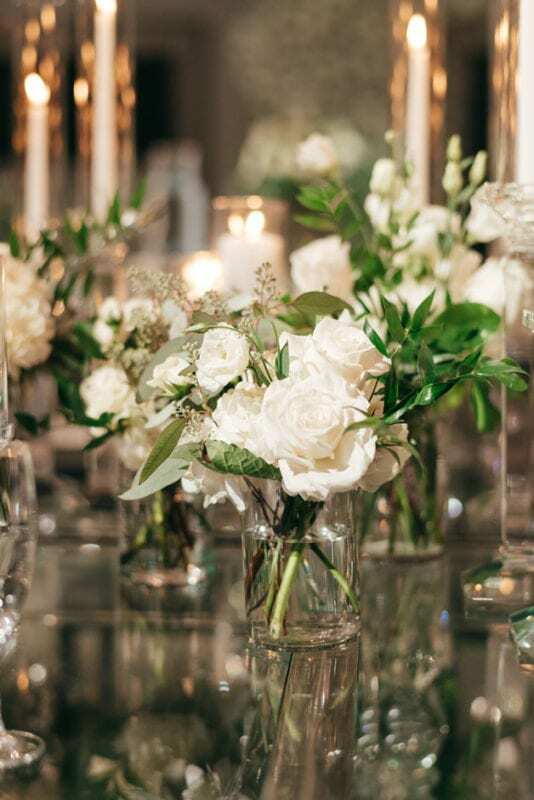 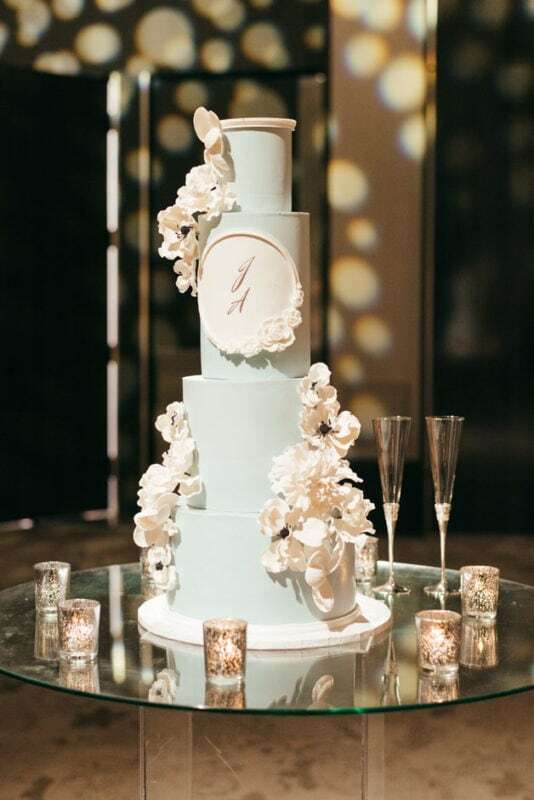 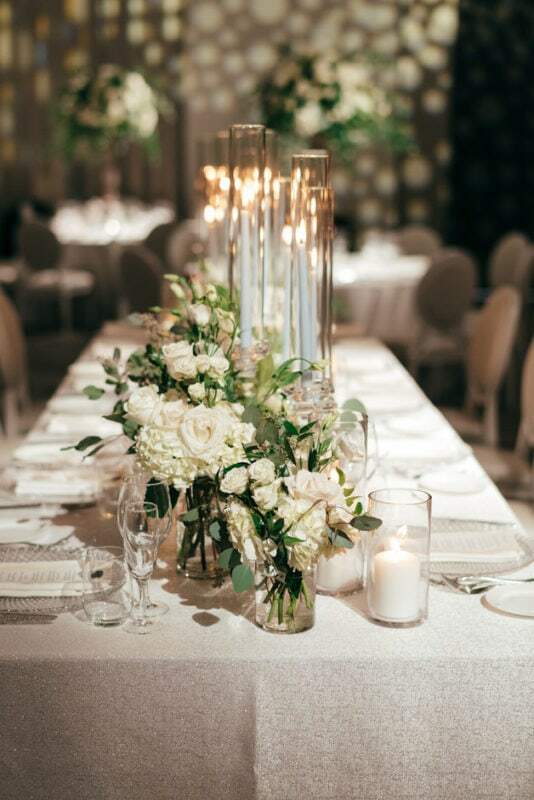 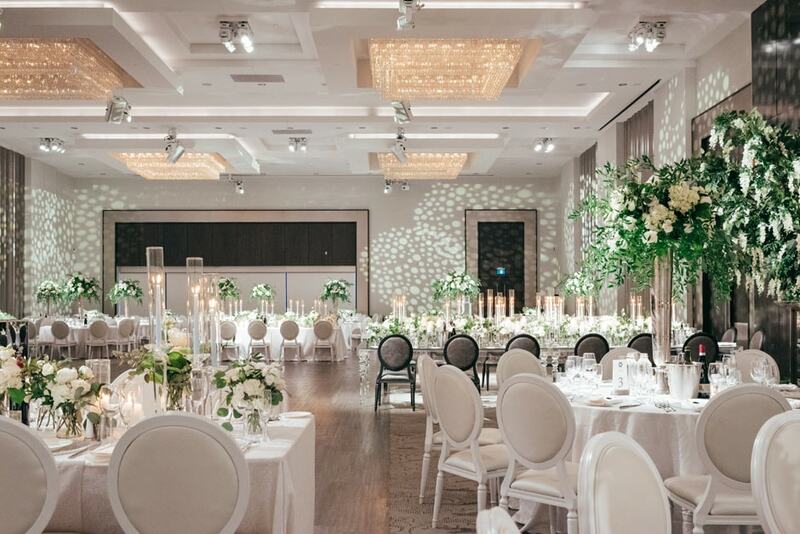 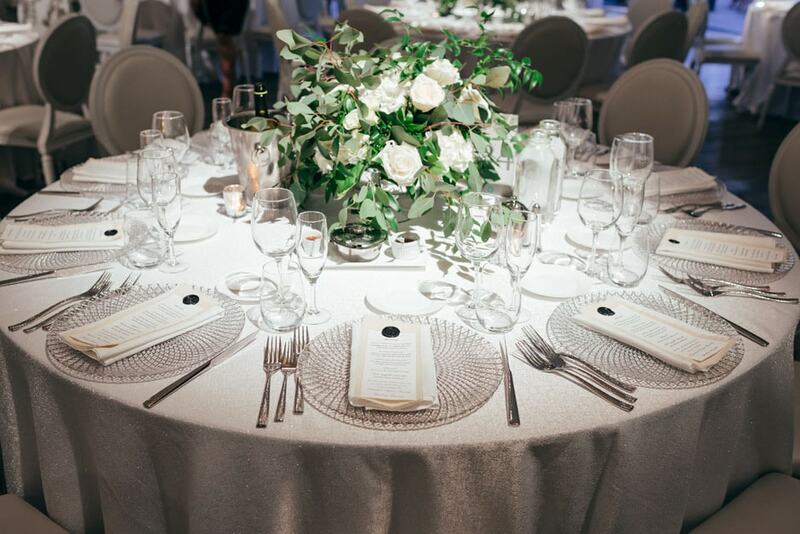 The luxe details included endless amounts of white rose bouquets in glass vases, interspersed with white taper and pillar candles ensconced in cut glass, providing the reception room with plenty of soft light and reflections. 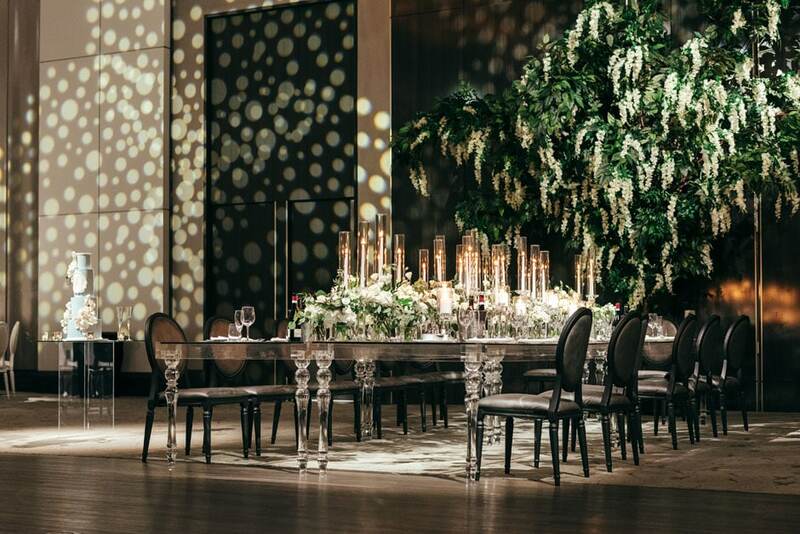 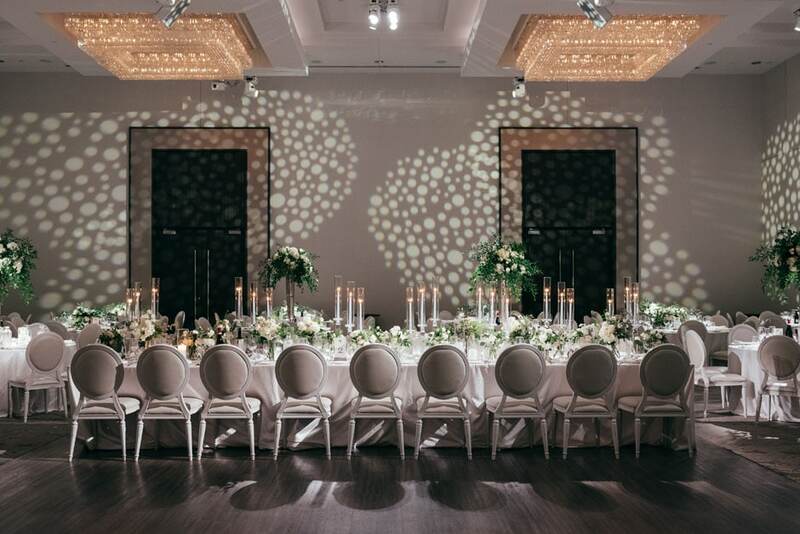 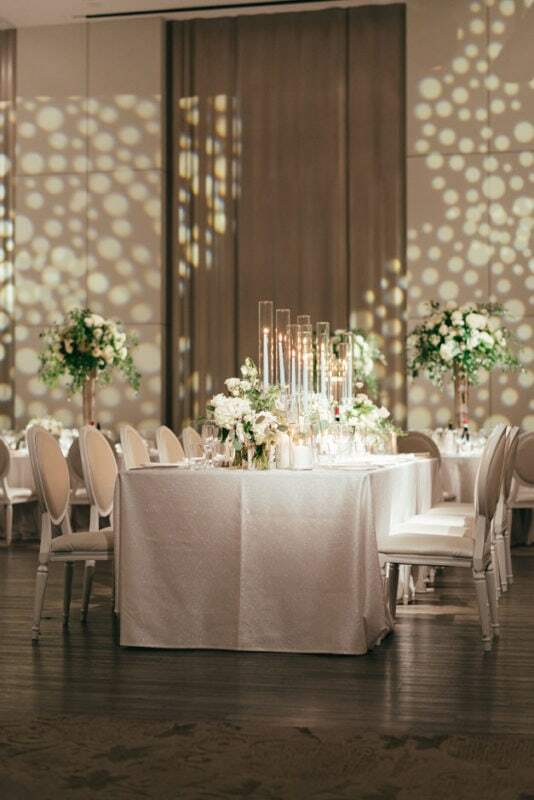 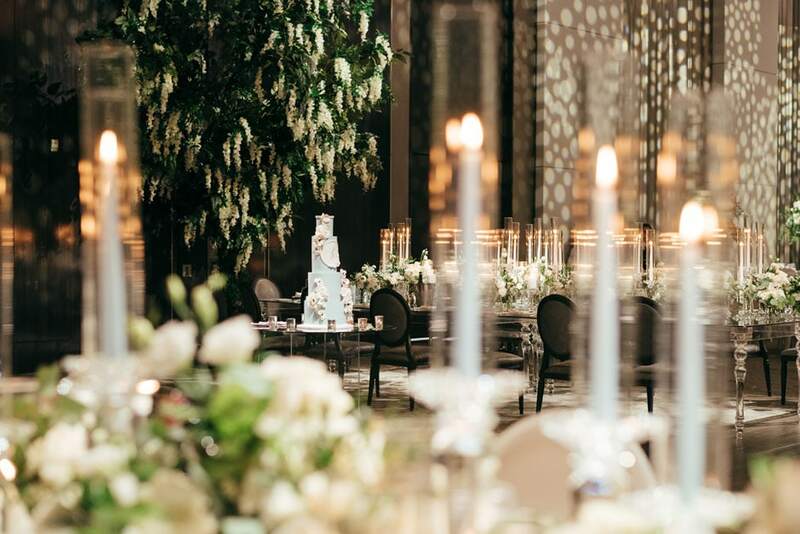 To add even more glow and warmth to the room, light poured onto the walls in delicate patterns via ceiling projectors, and a swooping white wisteria tree overlooked the cut glass head table. 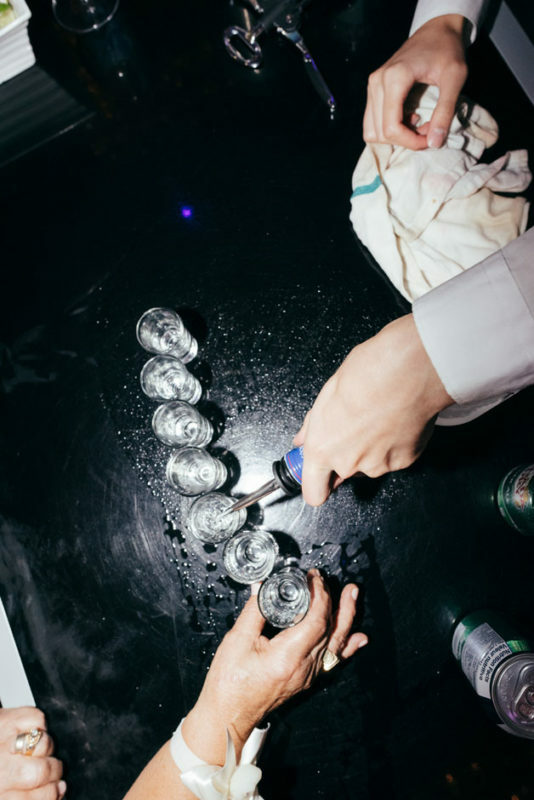 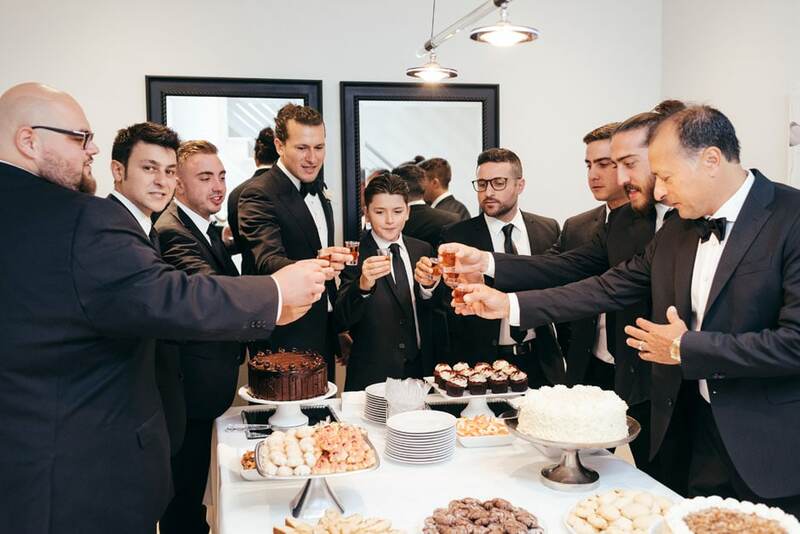 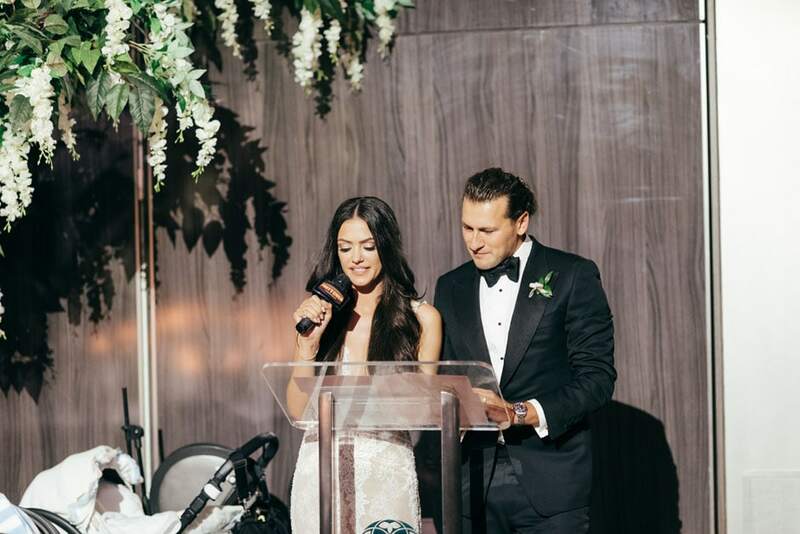 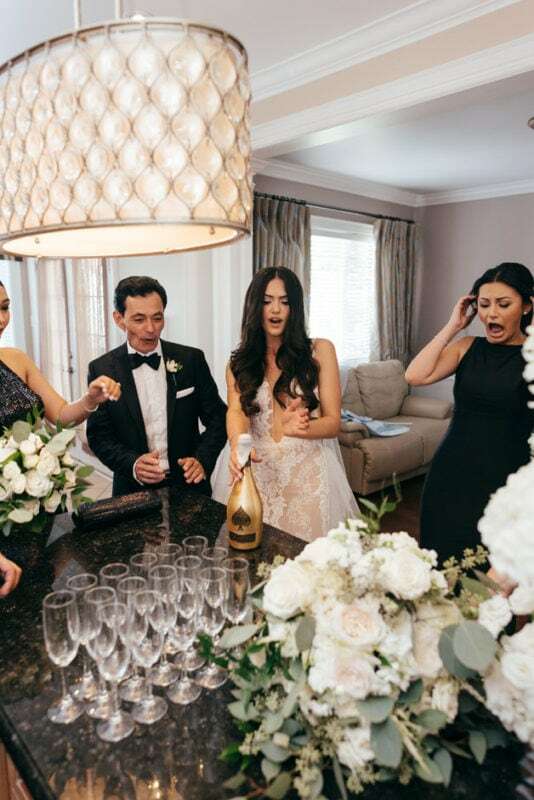 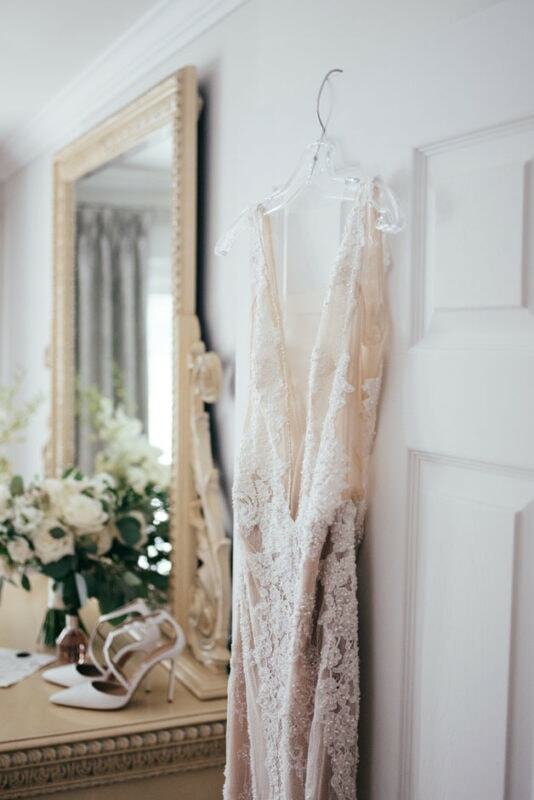 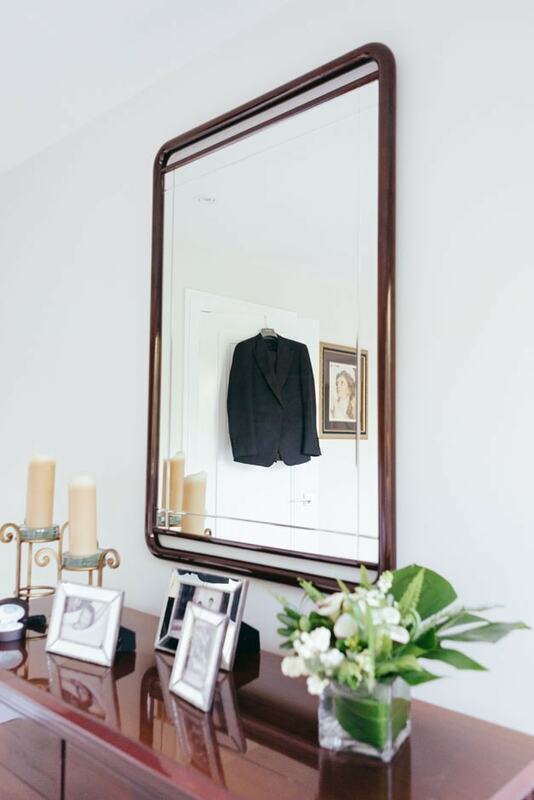 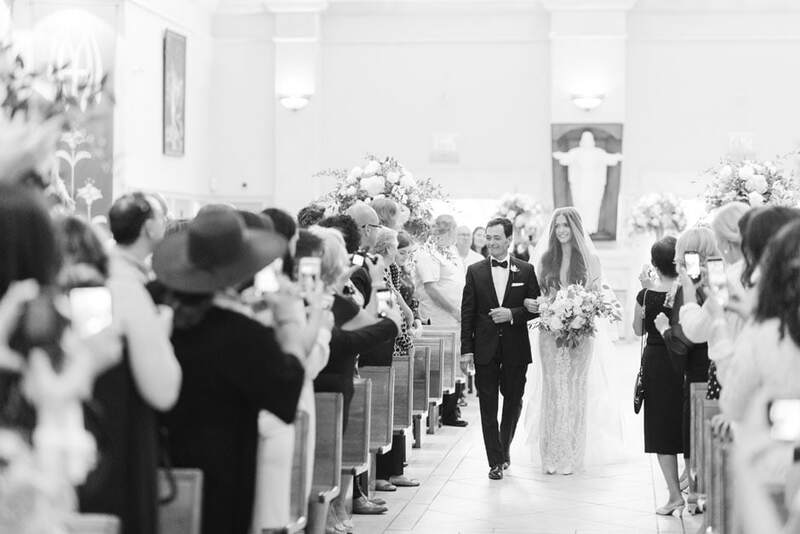 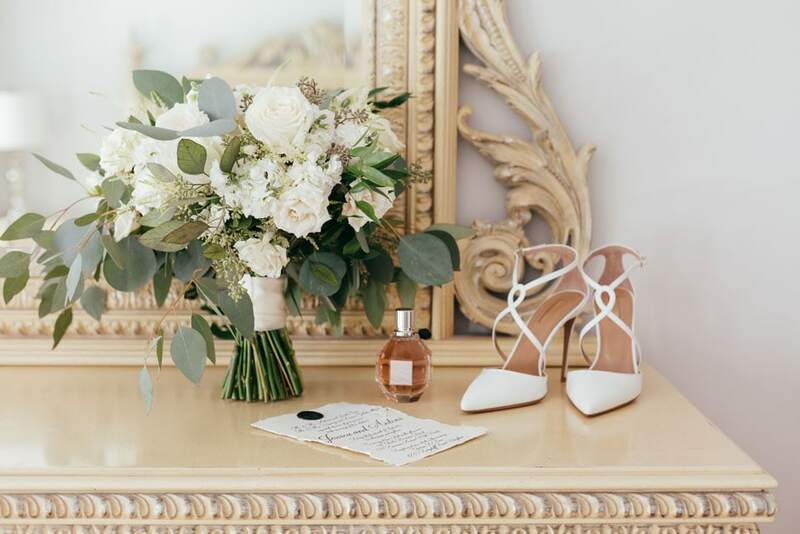 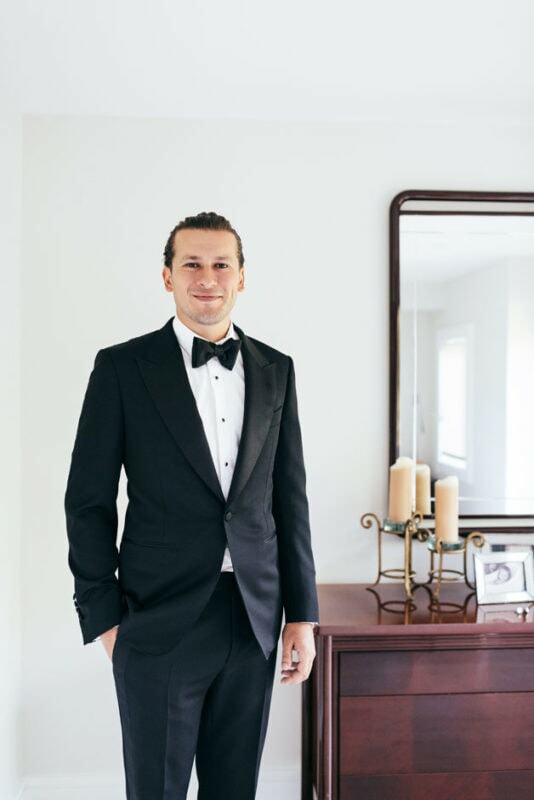 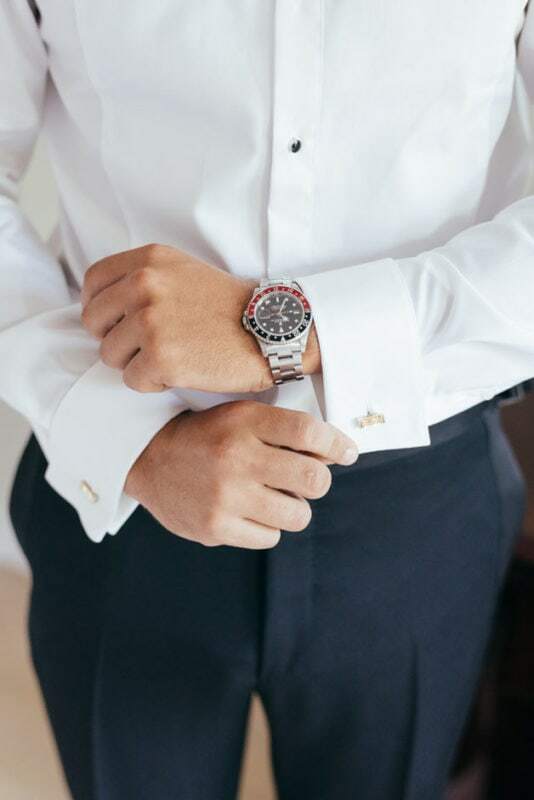 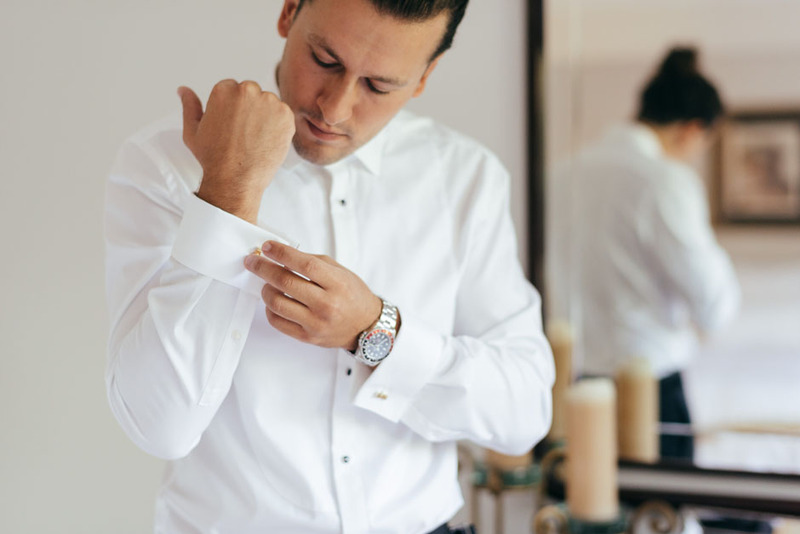 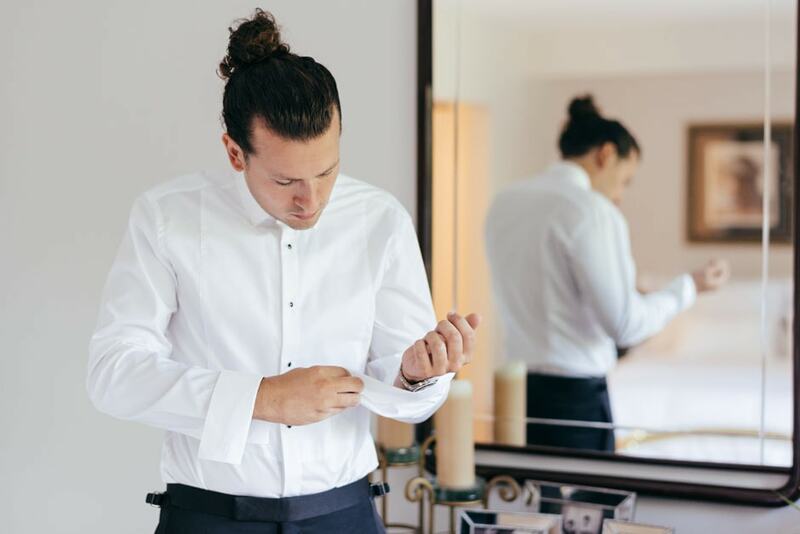 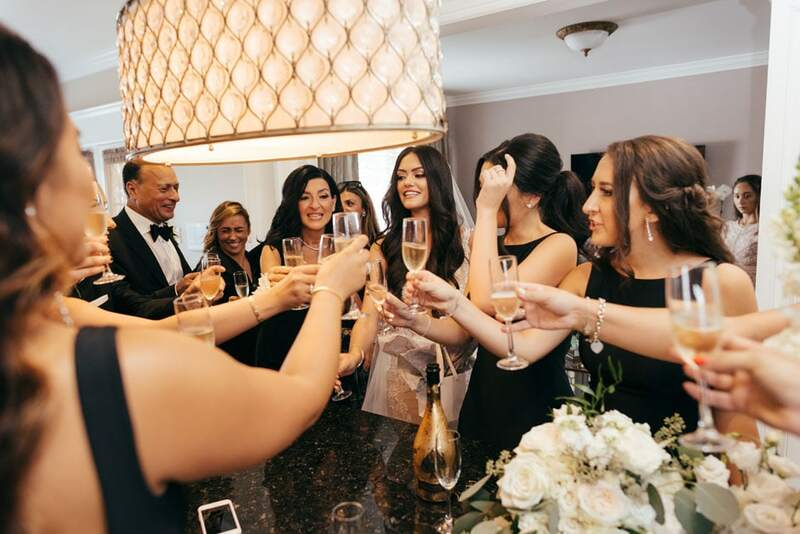 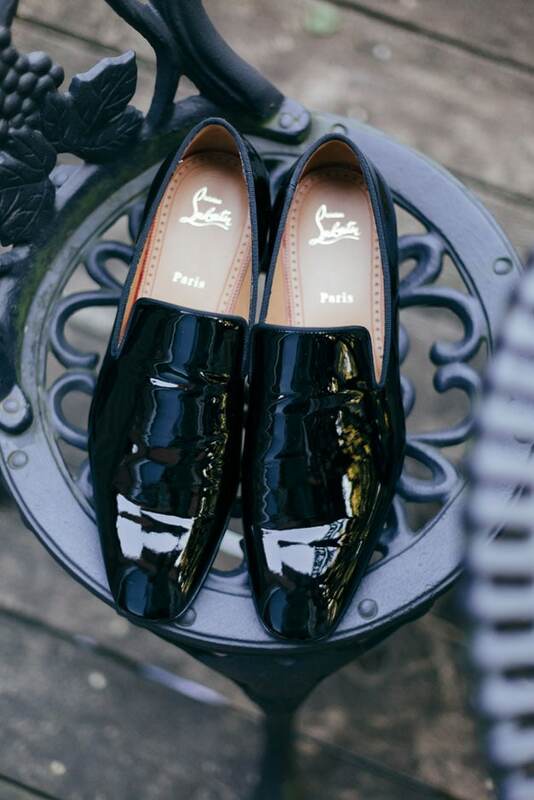 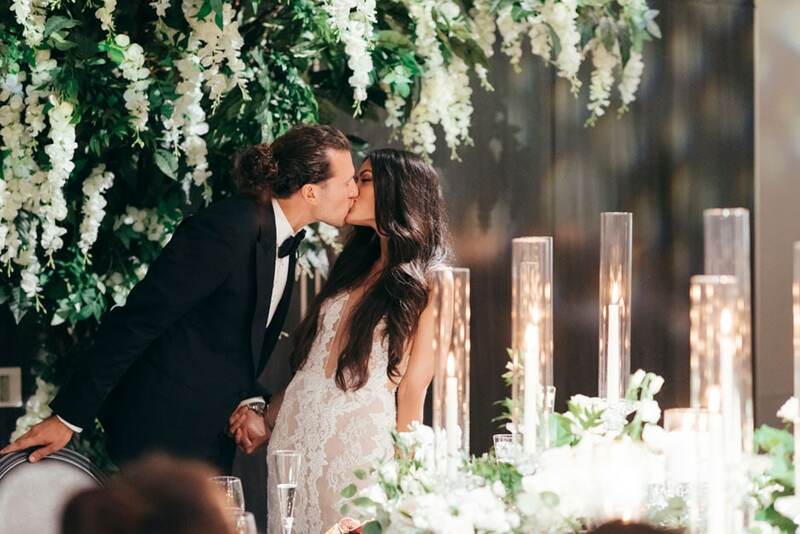 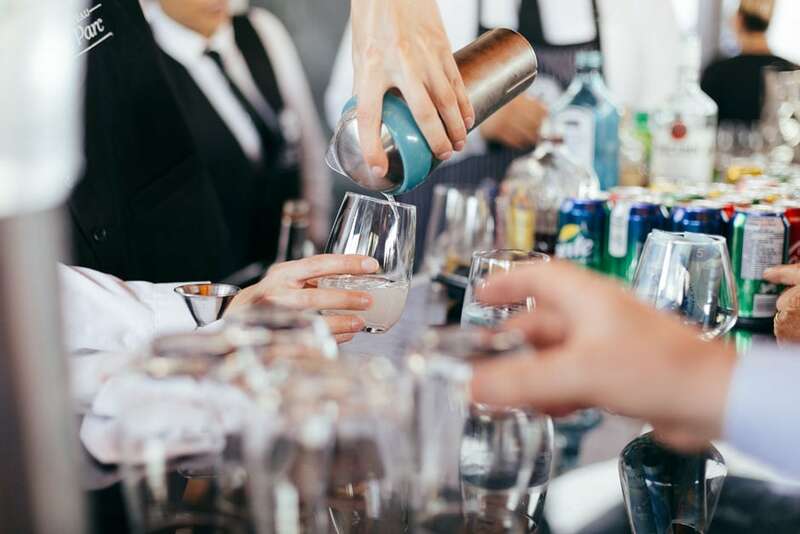 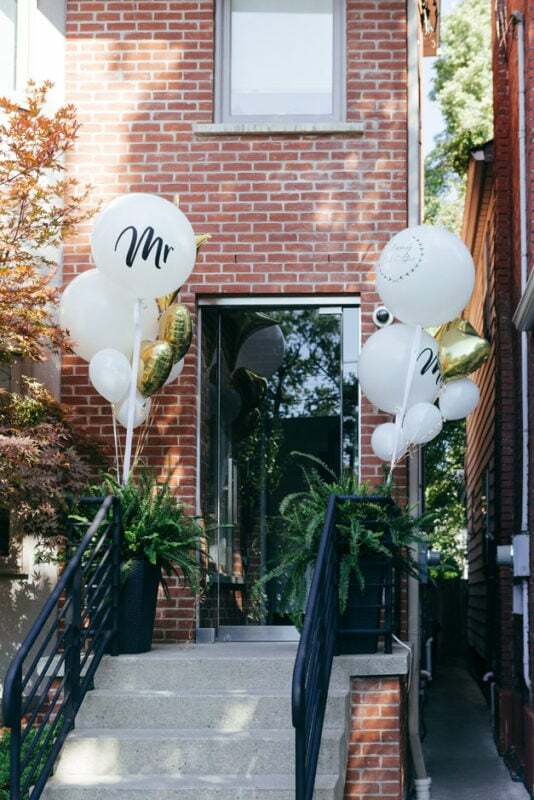 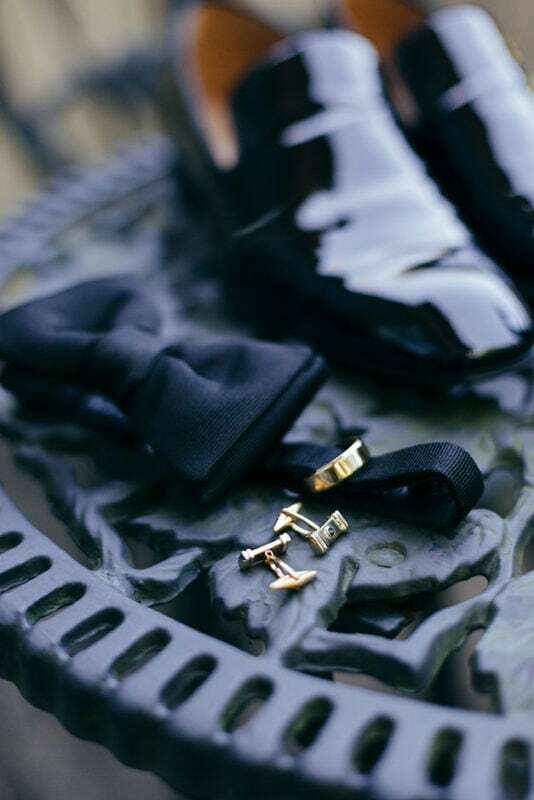 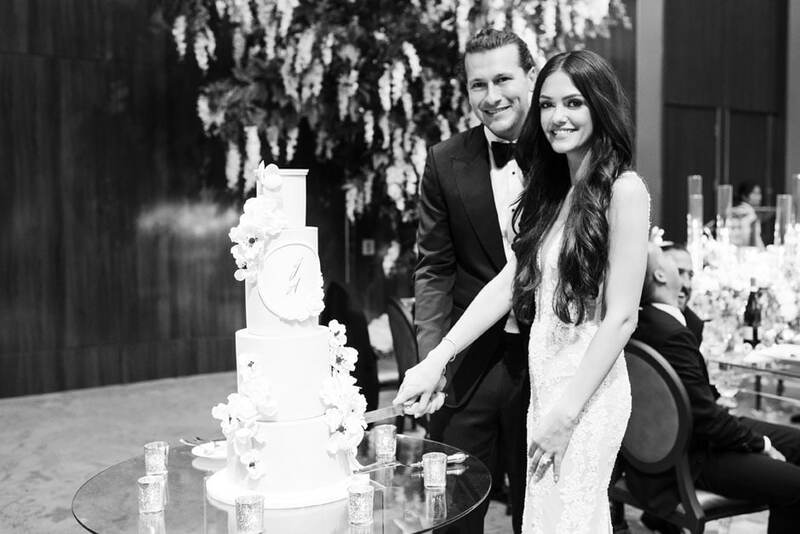 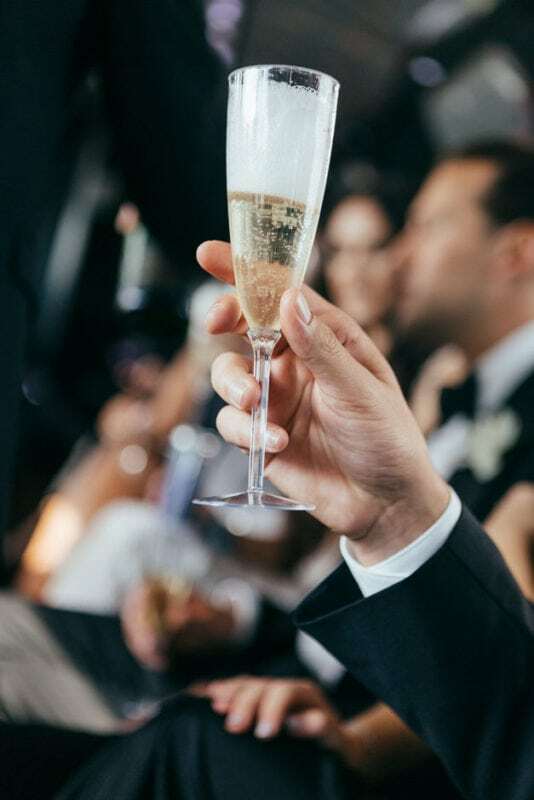 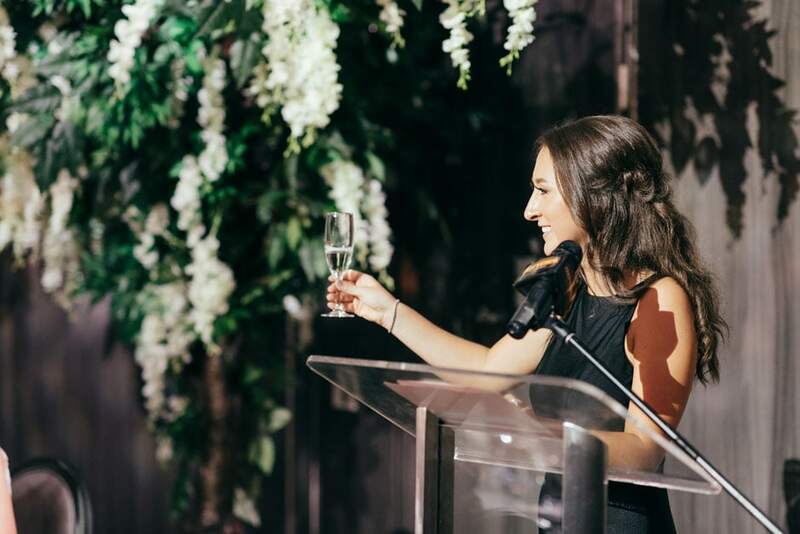 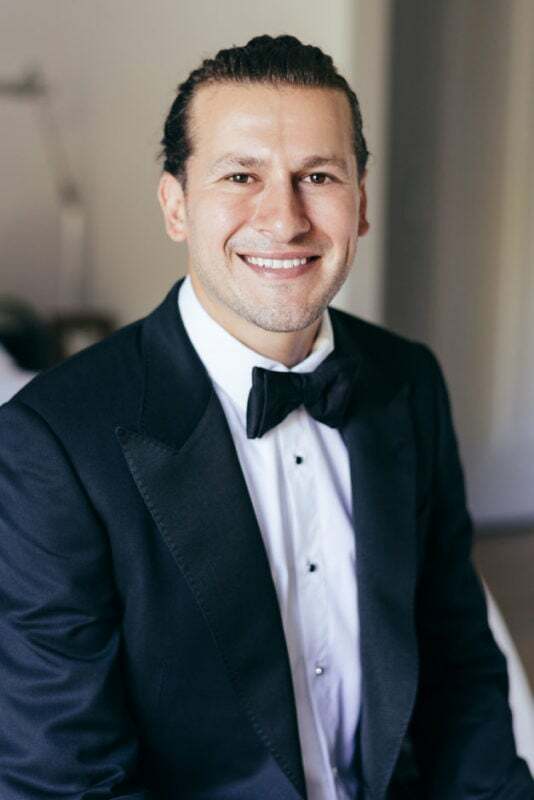 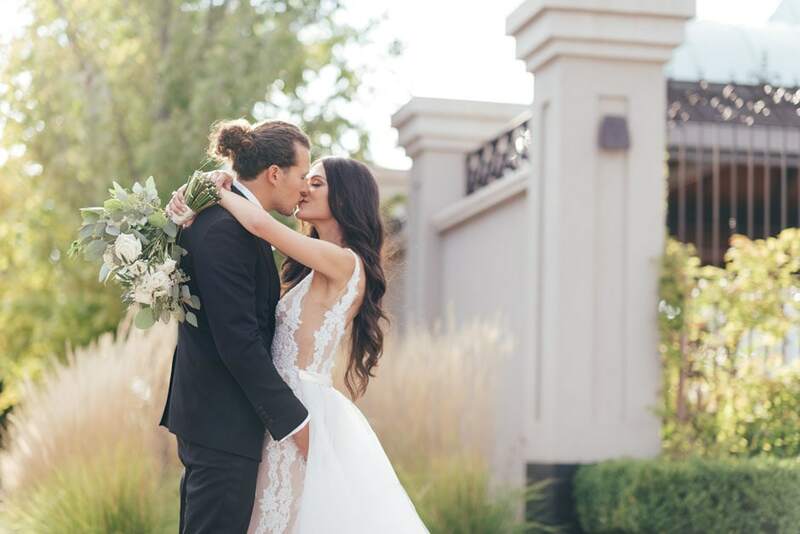 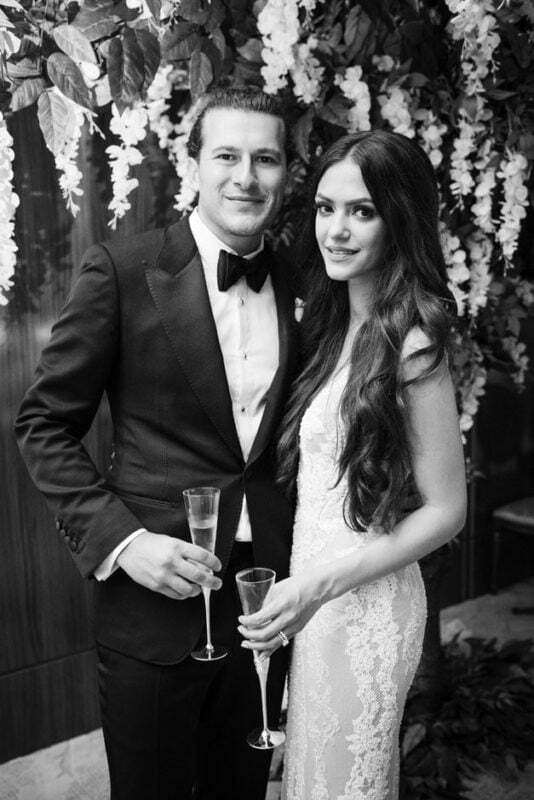 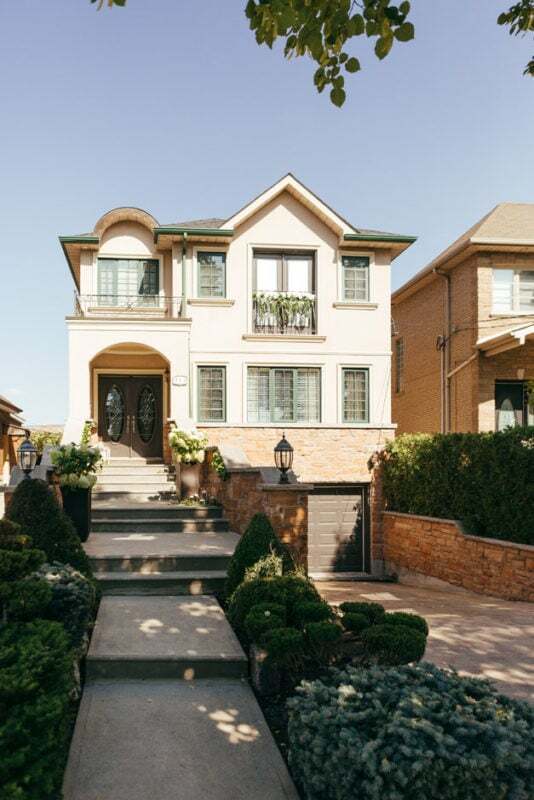 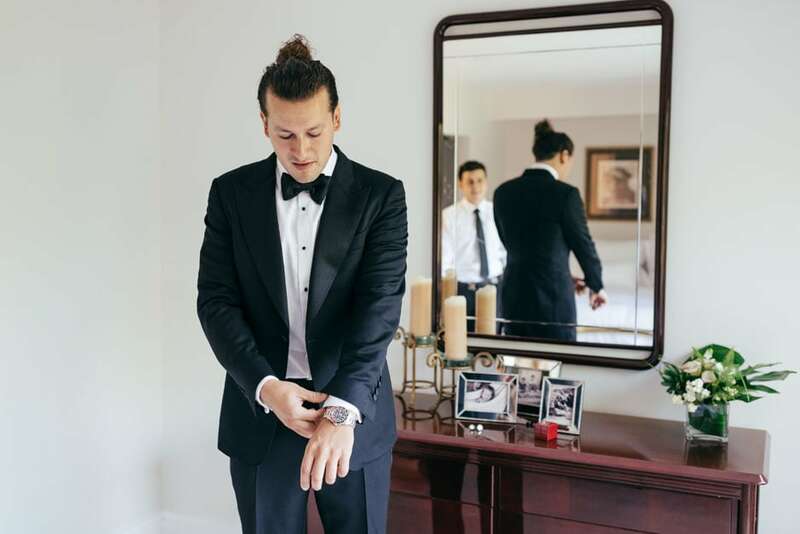 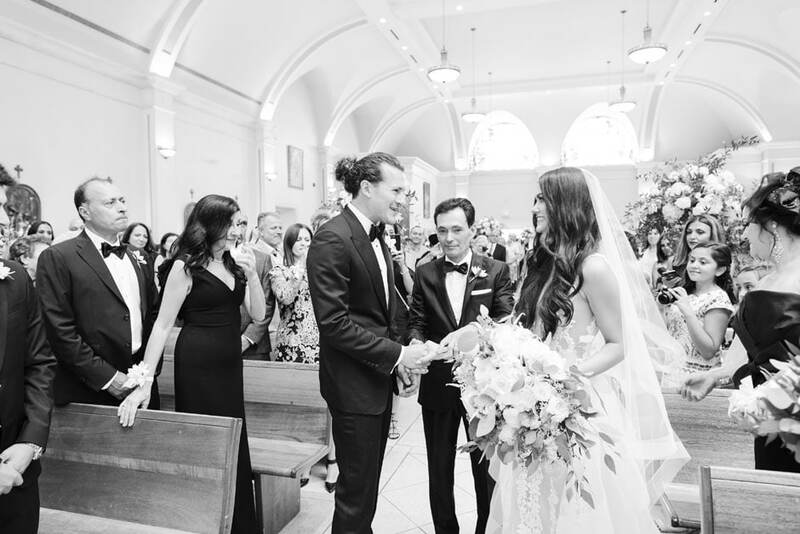 Starting on a beautiful September morning, the wedding parties gathered at their respective homes to prepare for the big day, as well as enjoy hors d’oeuvres and Armand de Brignac champagne. 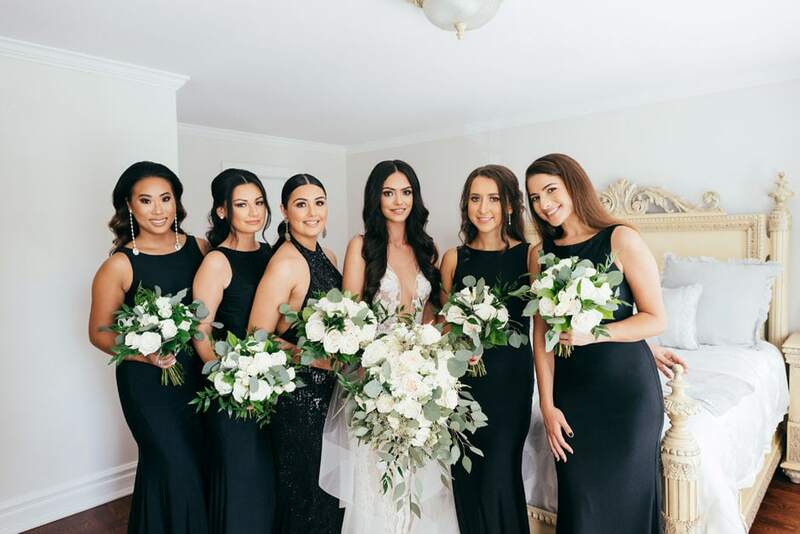 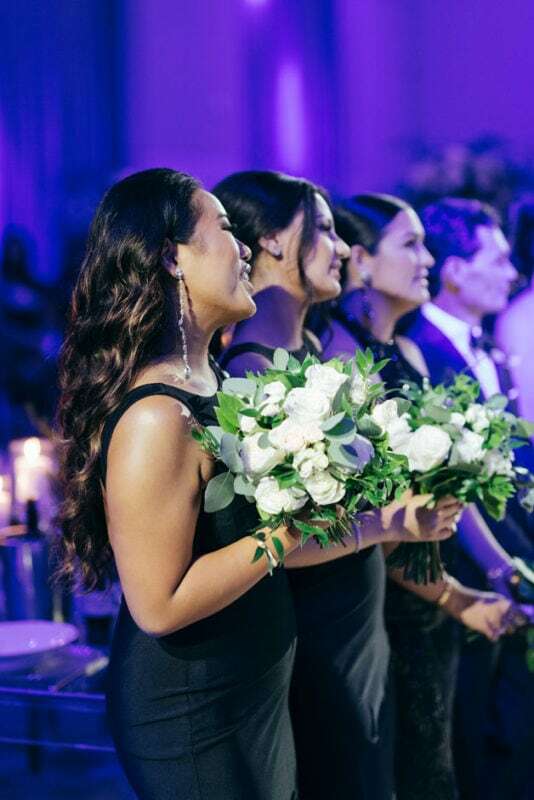 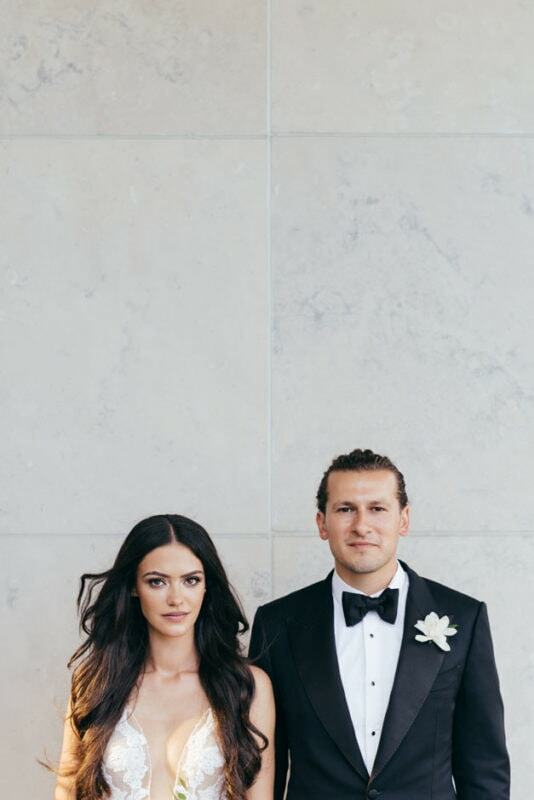 The bridesmaids dressed in elegant floor length mermaid gowns of black satin, while the maid of honour shone in a halter neck mermaid gown of black sequins. 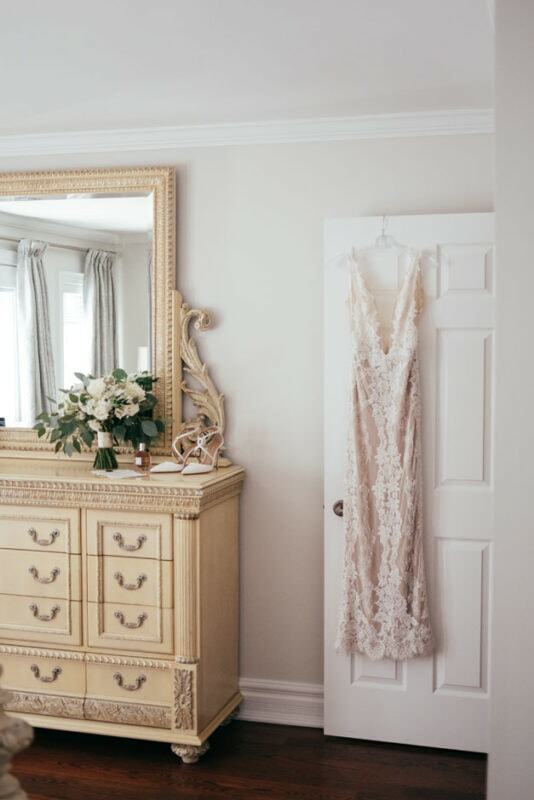 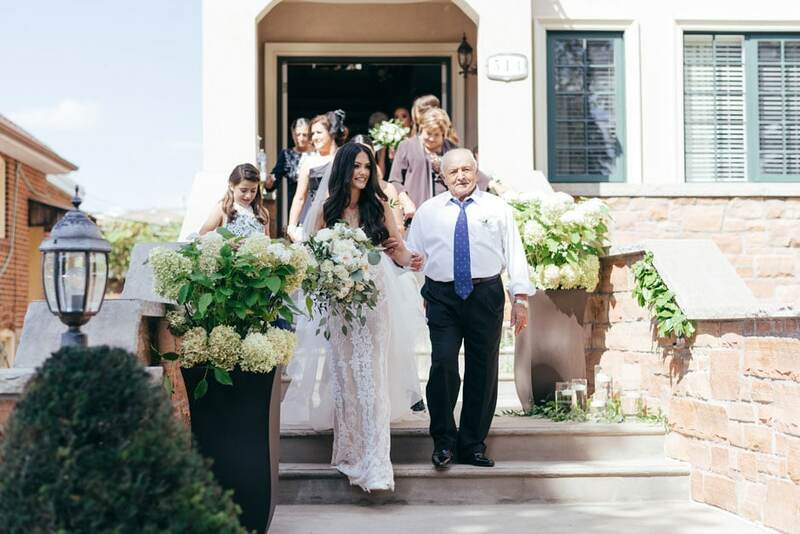 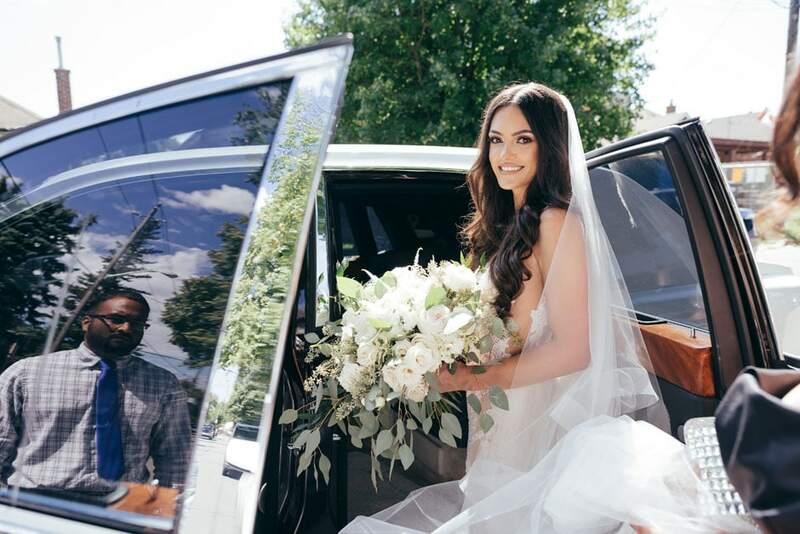 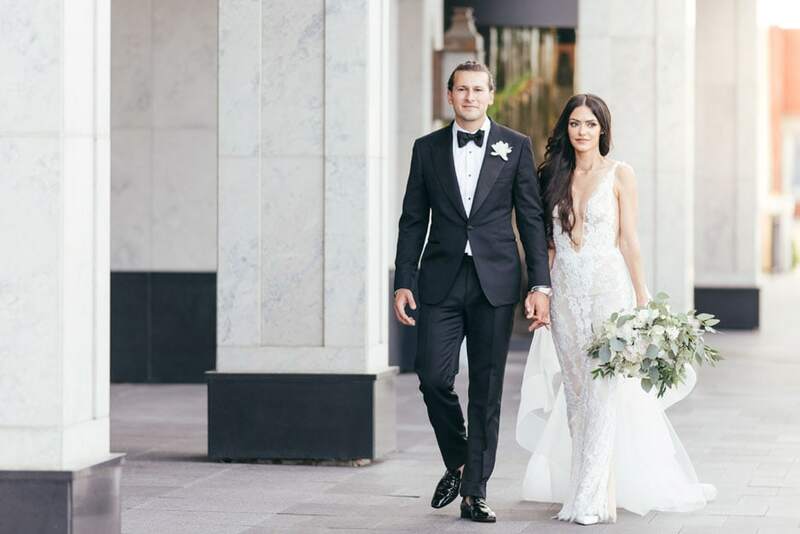 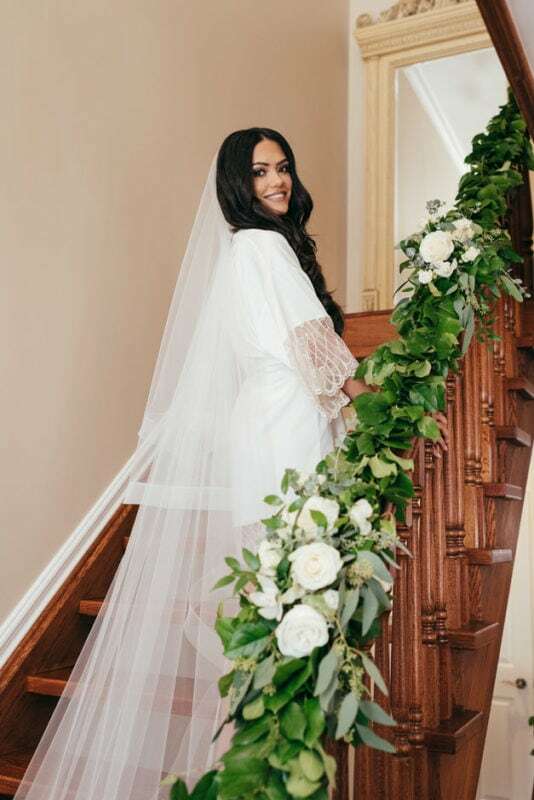 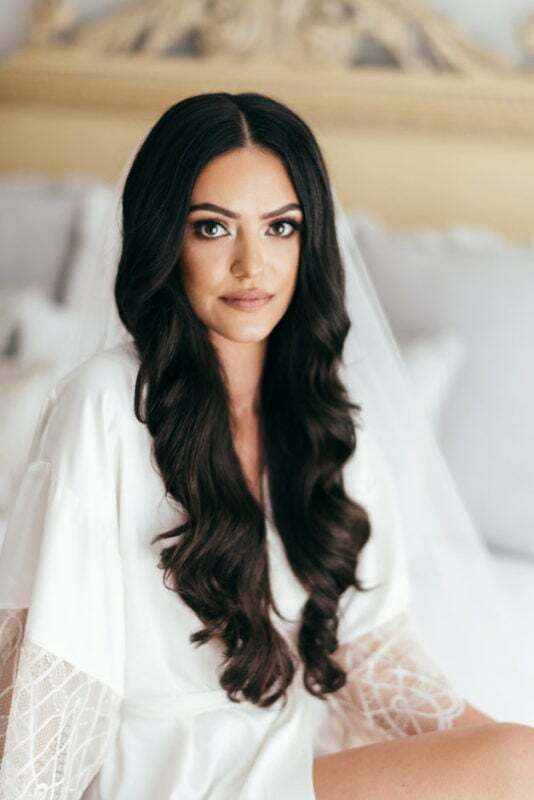 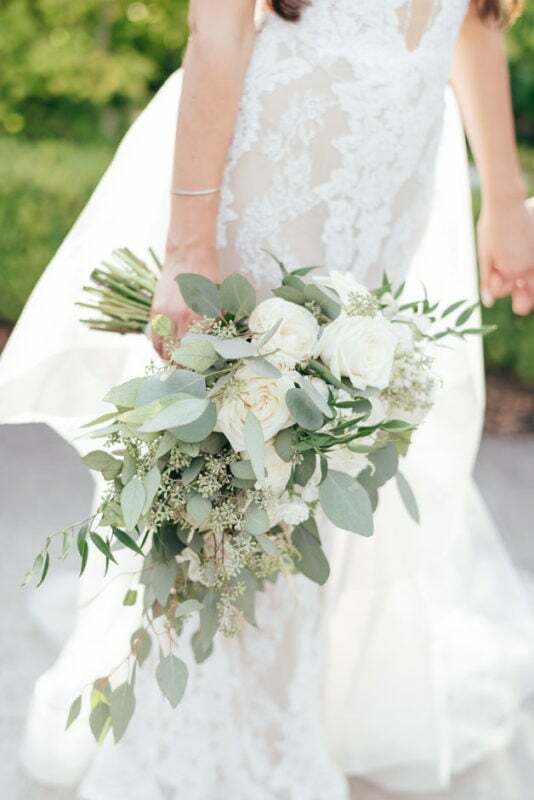 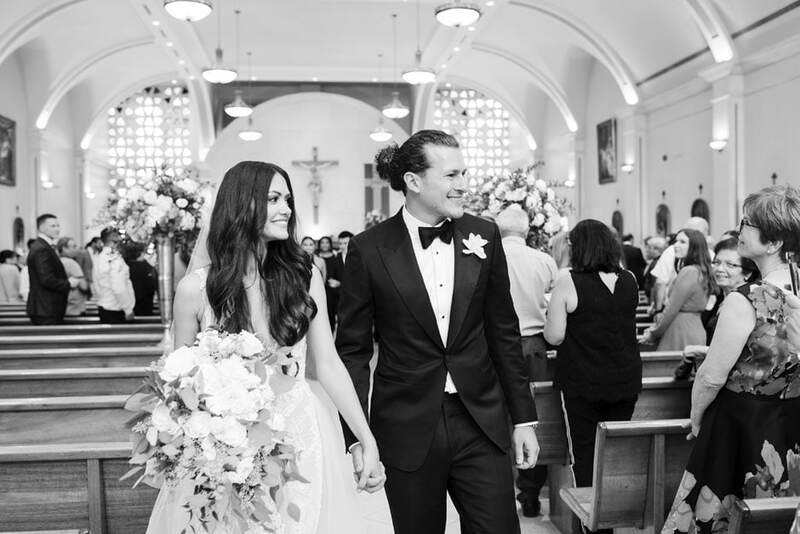 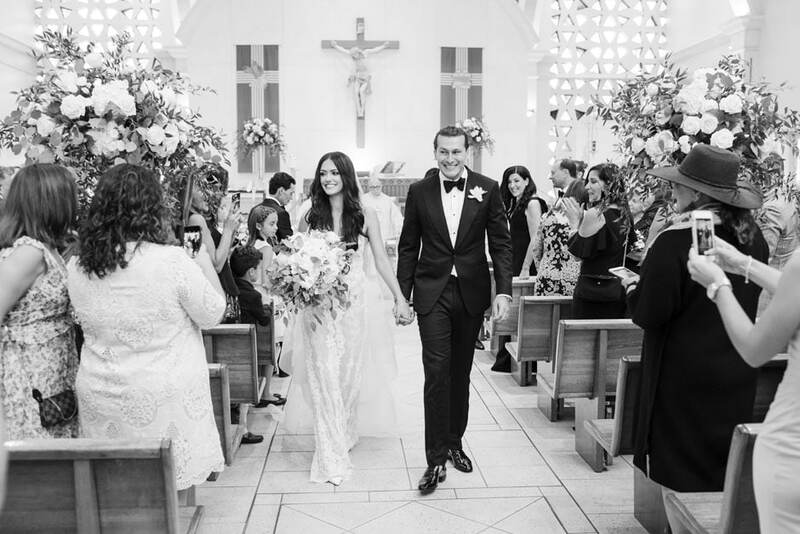 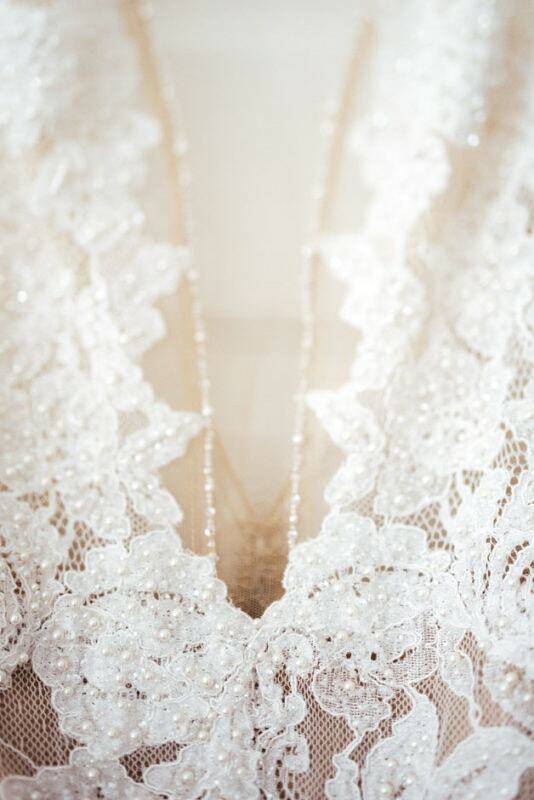 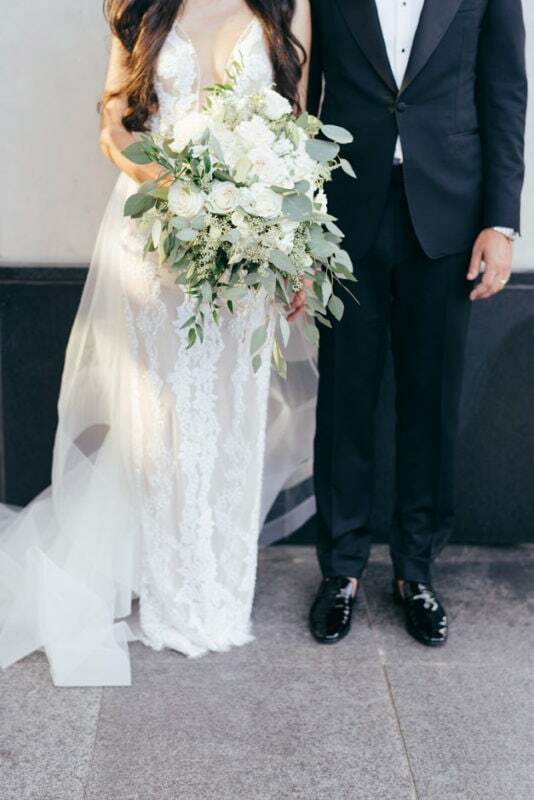 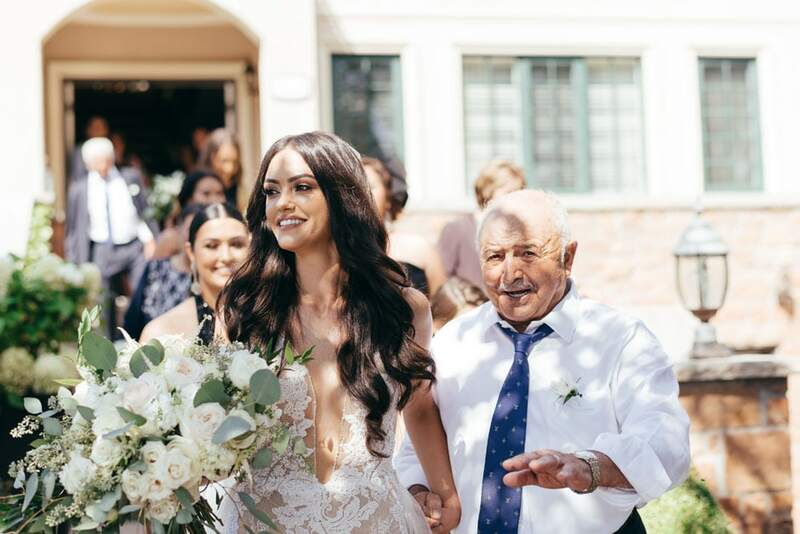 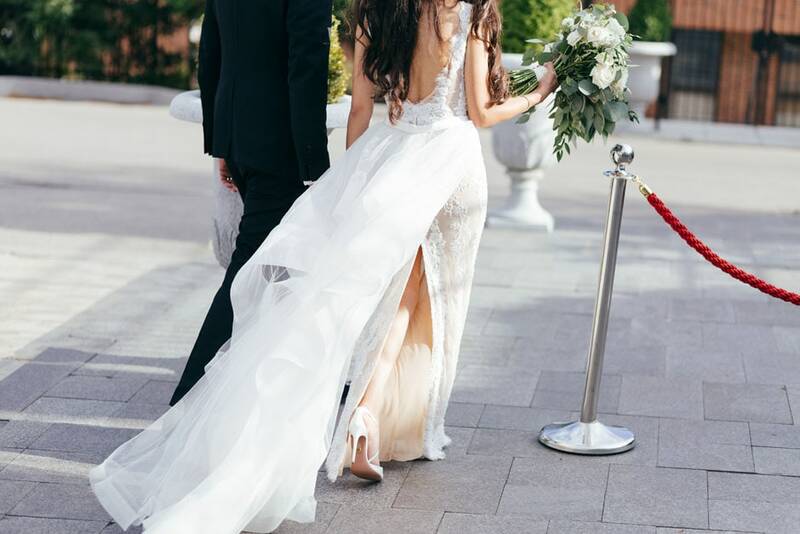 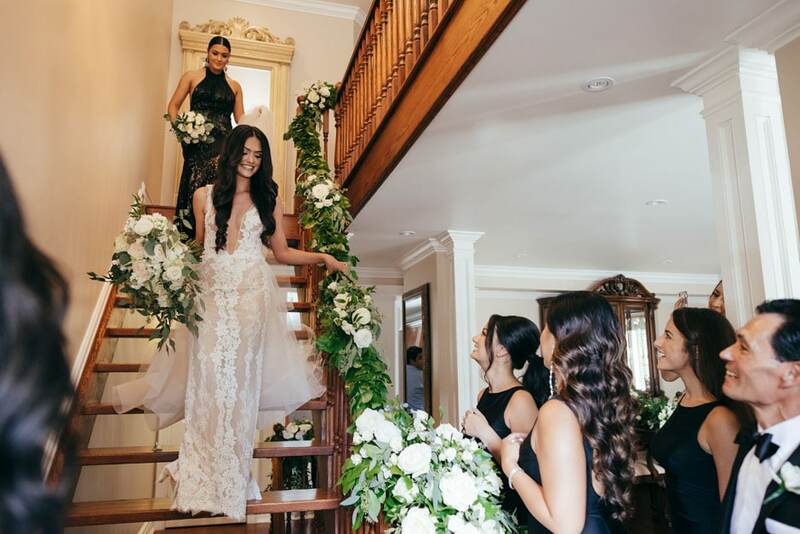 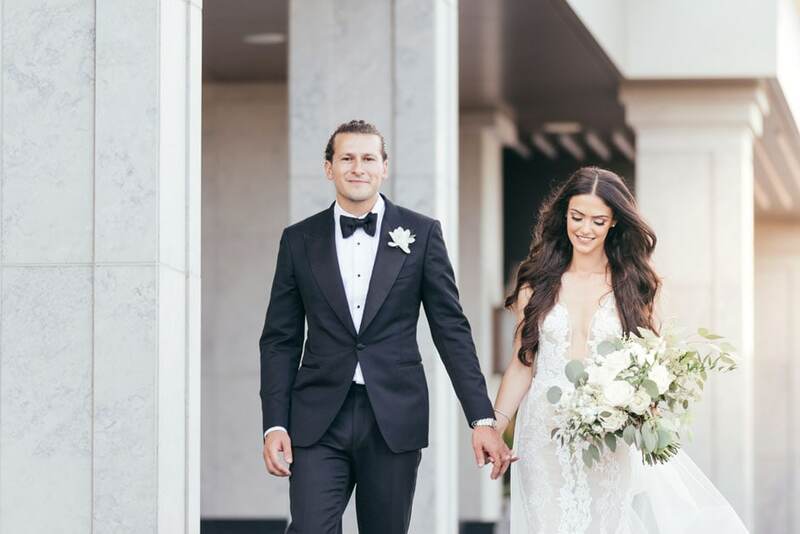 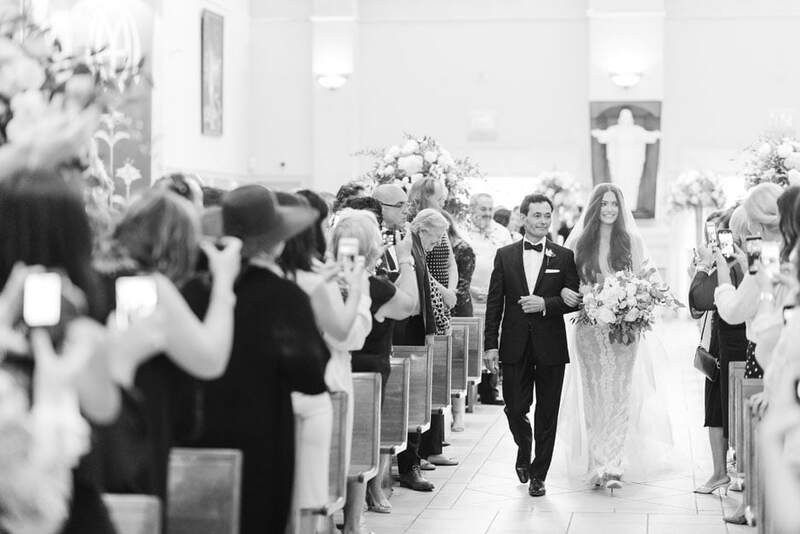 Making her way down a white rose garland-lined staircase, the bride was stunning in a lace illusion sheath gown, with a plunging neckline and pearl beading, accompanied by a sheer drop veil and cathedral length train, and a cascading white rose bouquet in hand. 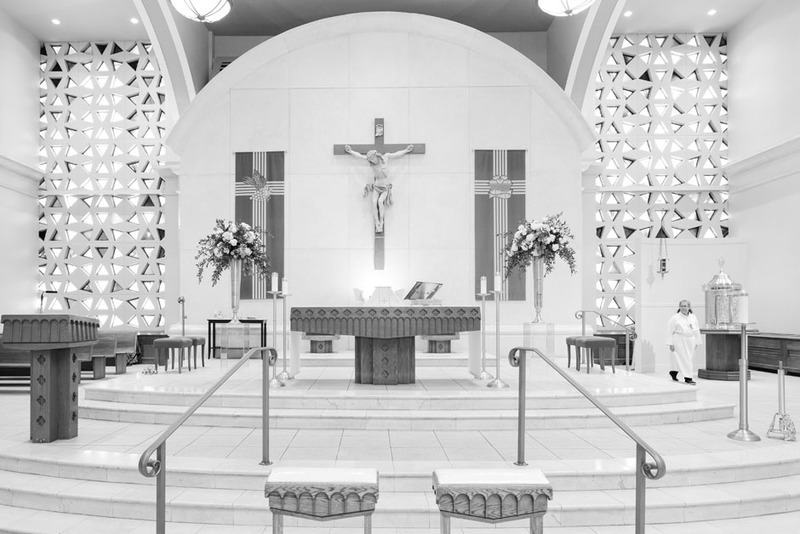 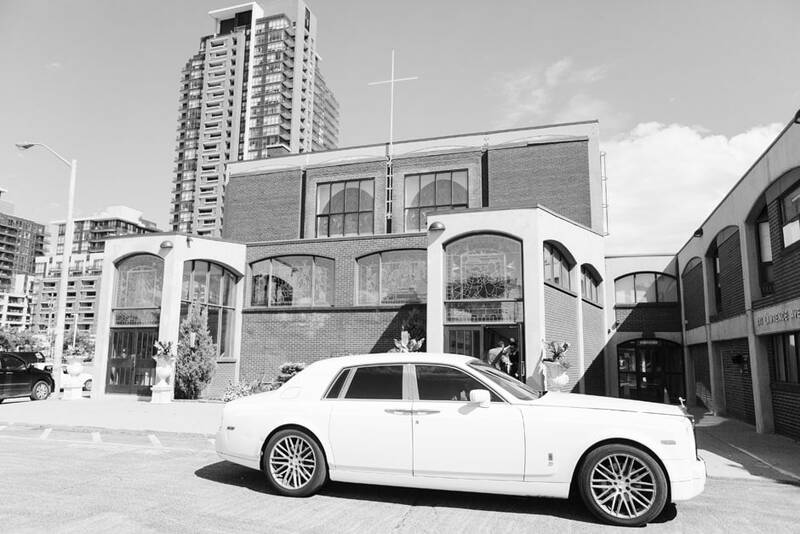 The bride was then whisked off in a white Rolls Royce to the St. Charles Borromeo Church, in North York, Ontario for the ceremony. 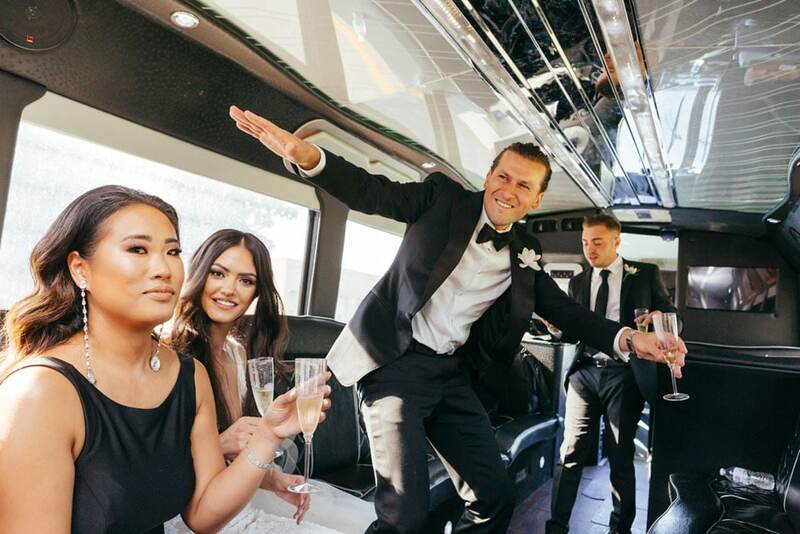 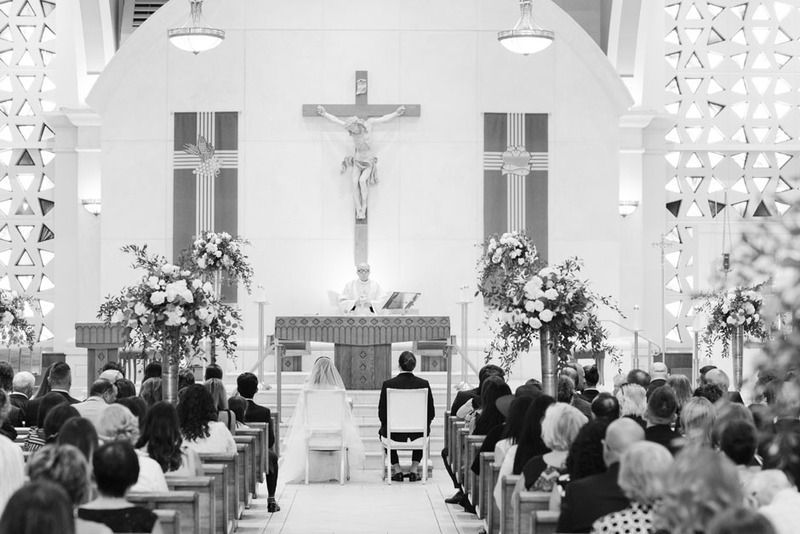 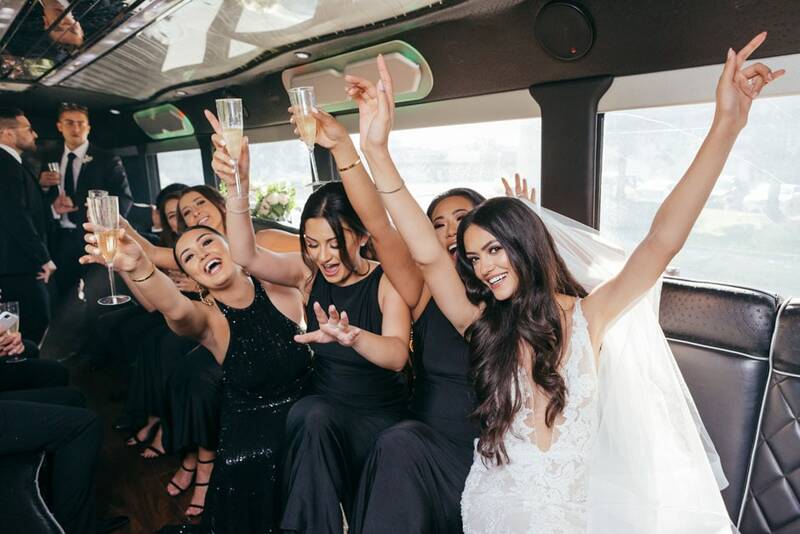 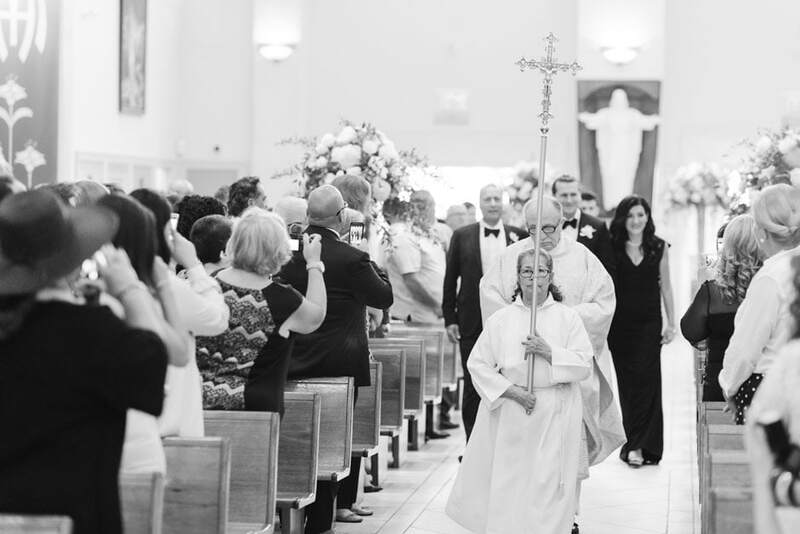 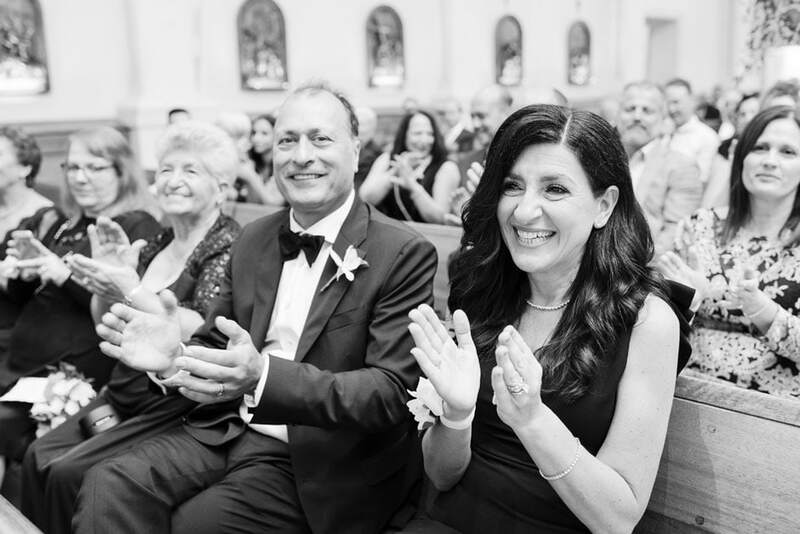 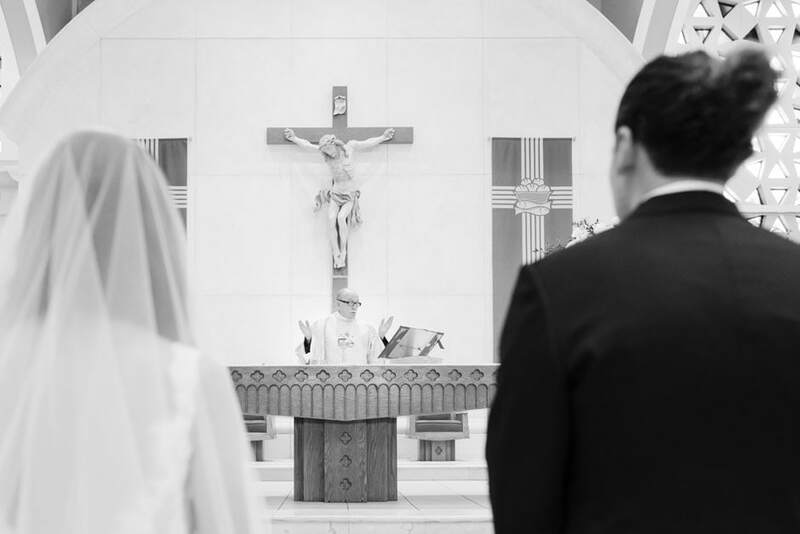 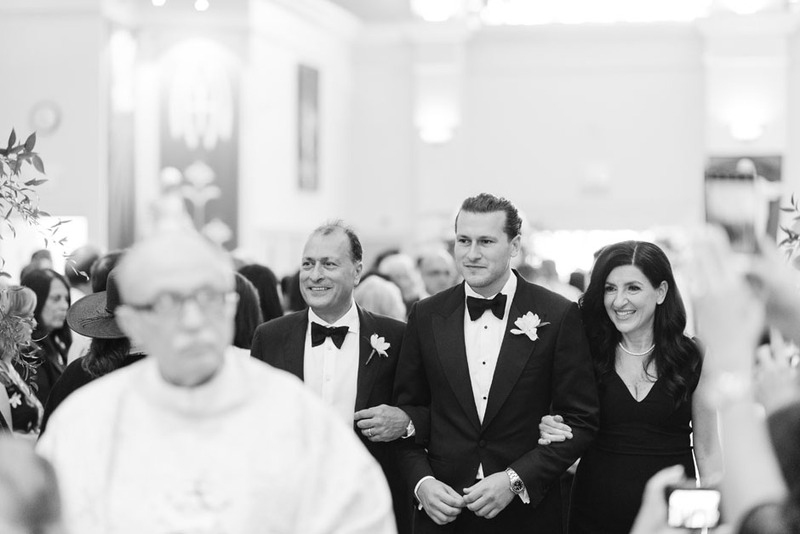 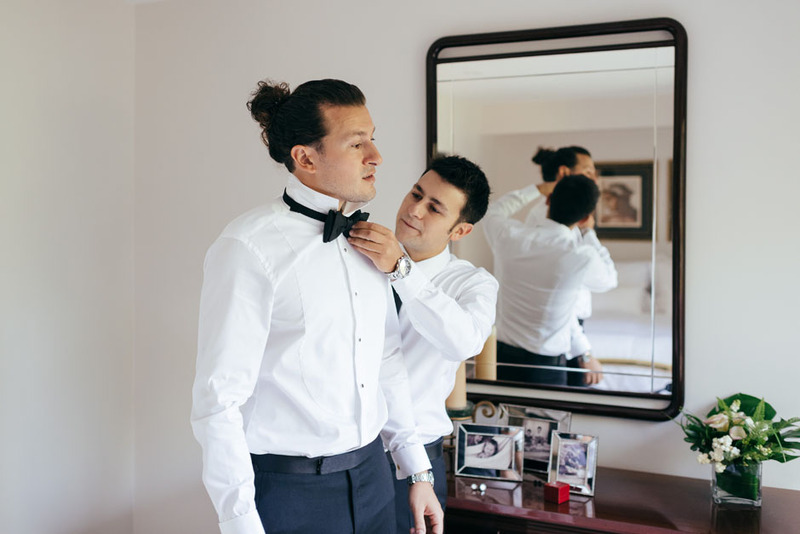 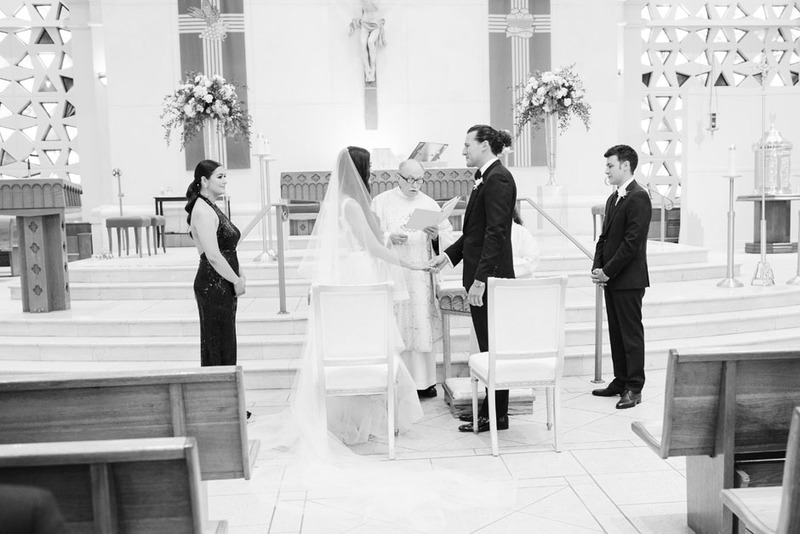 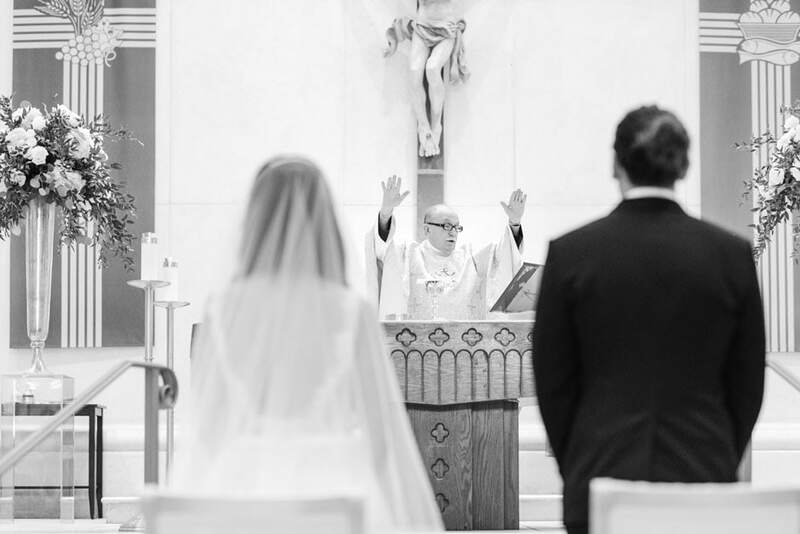 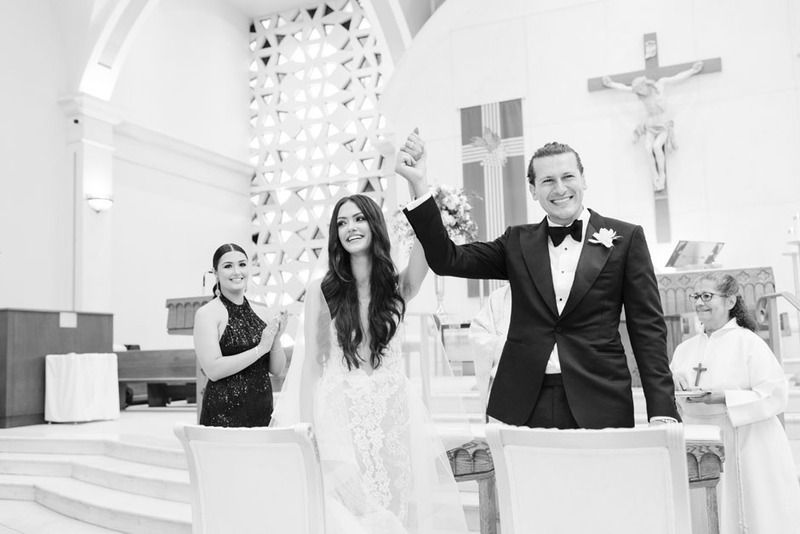 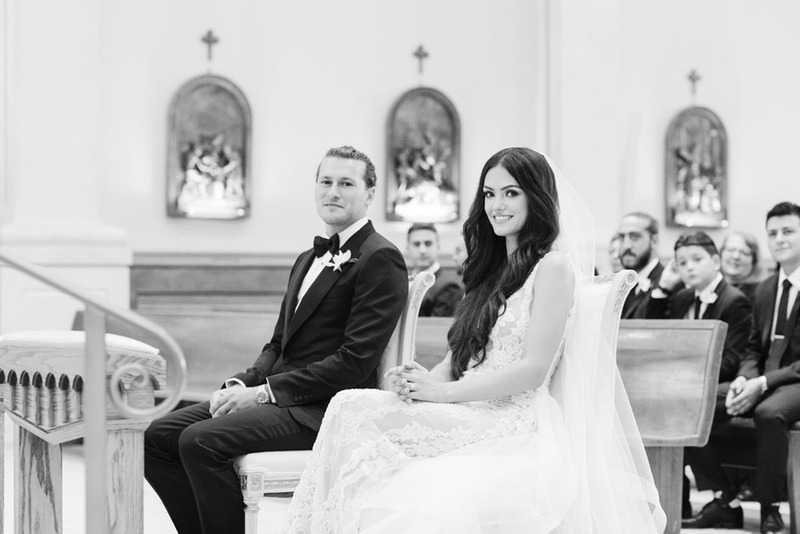 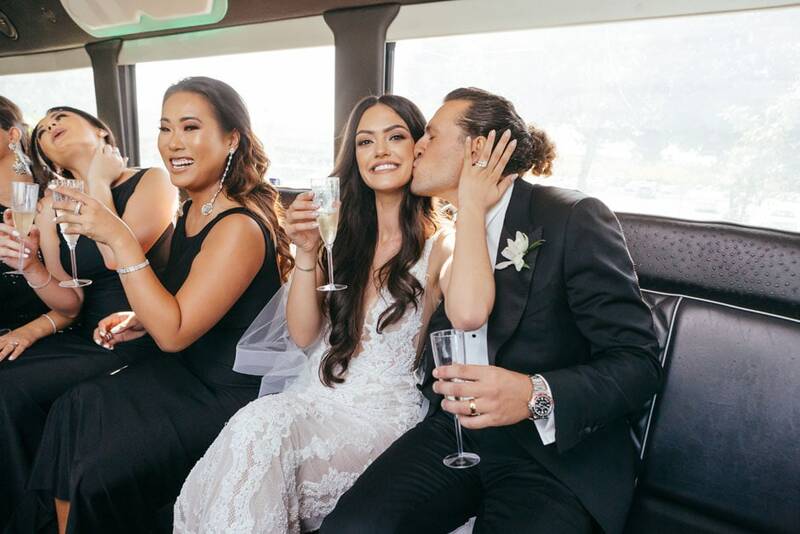 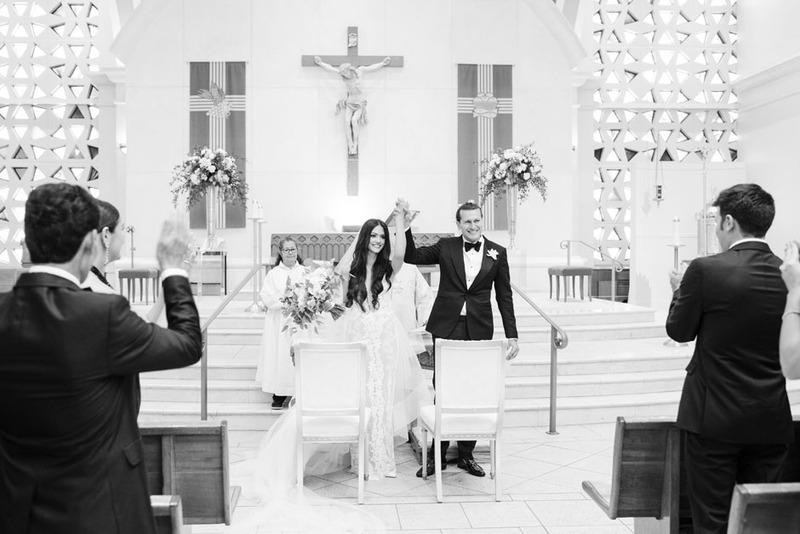 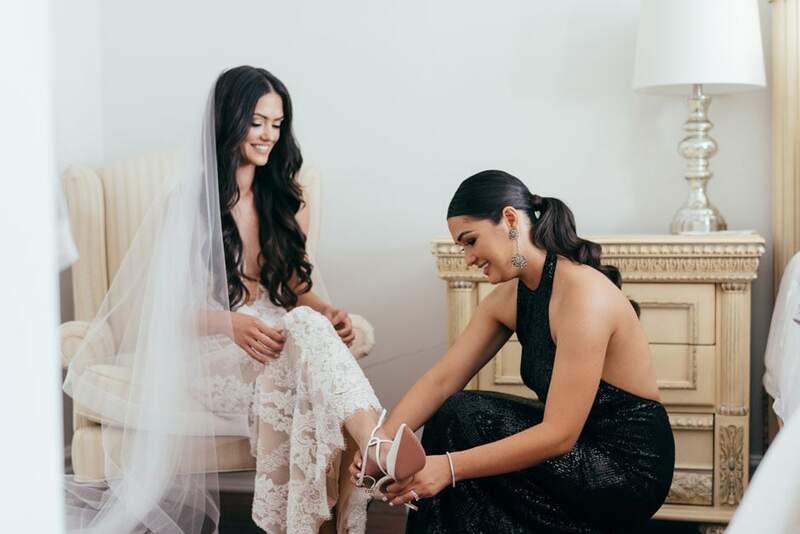 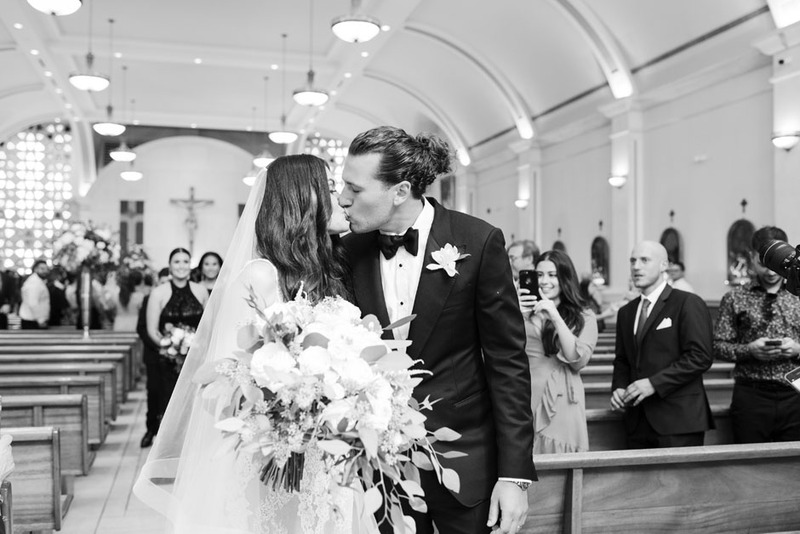 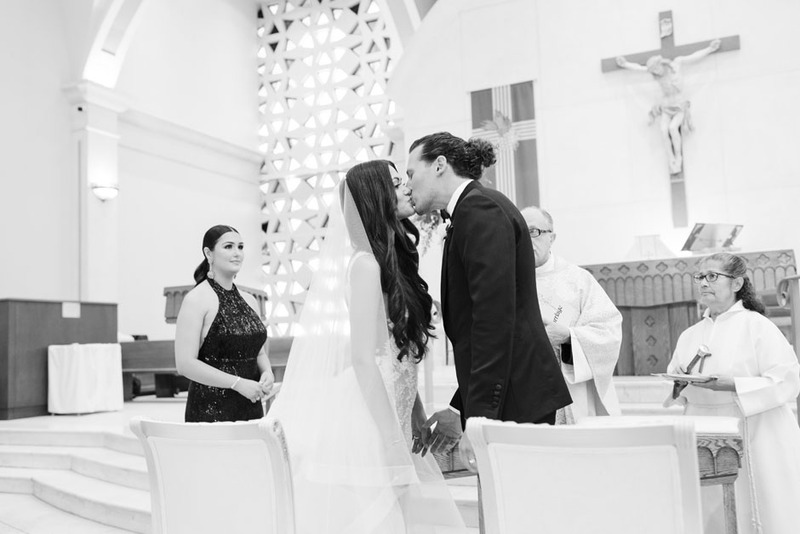 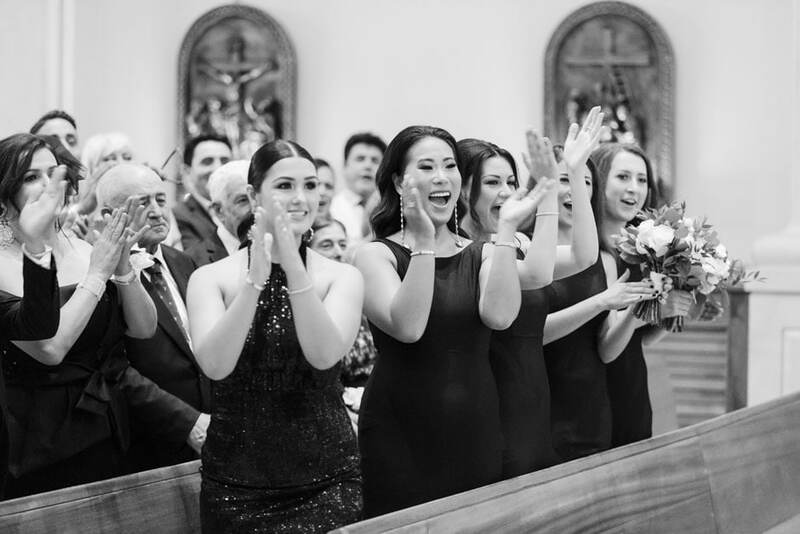 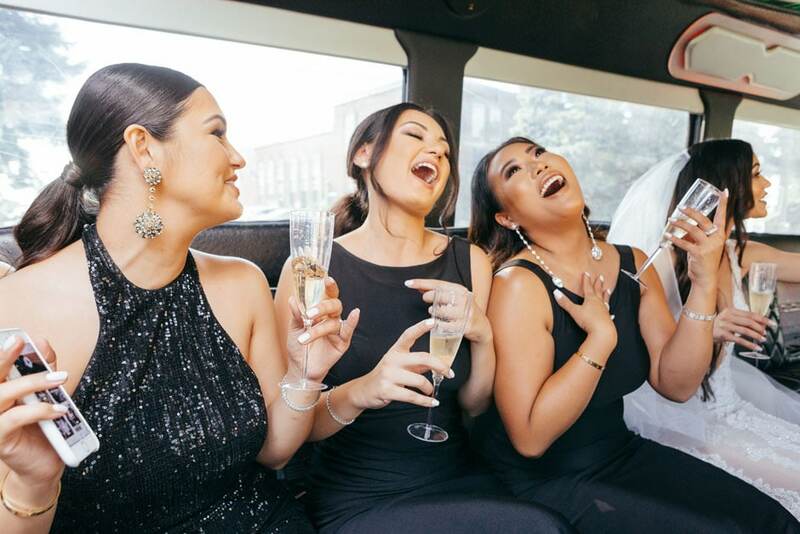 Surrounded by family and friends, the couple wed in a traditional Catholic ceremony, before getting the party started with pals in their limo bus en route to the photo shoot and reception. 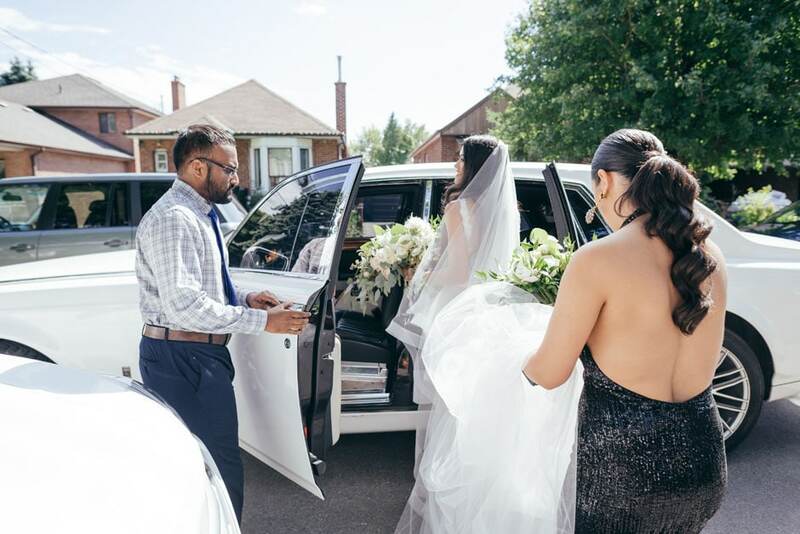 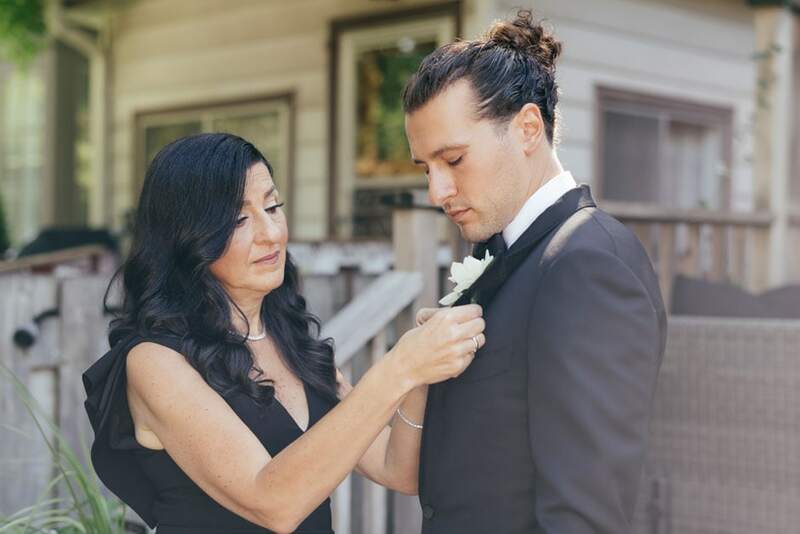 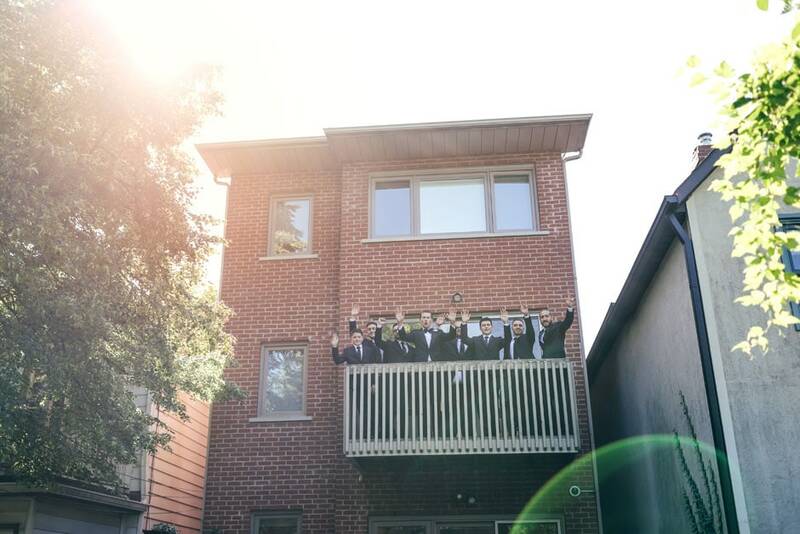 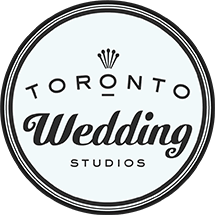 The bride and groom chose to not have a separate location for their wedding photos and instead opted to do the photo shoot at the Chateau Le Parc Vaughan wedding venue instead. 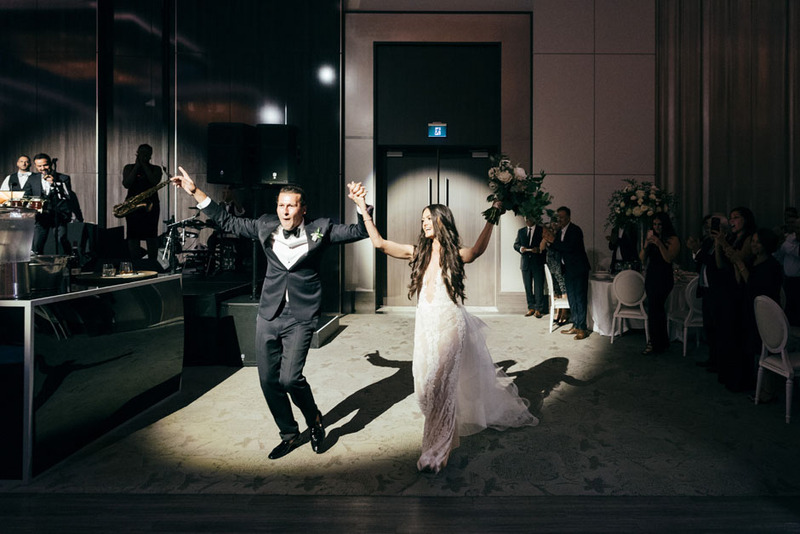 That way, the couple could spend as much time enjoying the festivities with their 350 guests. 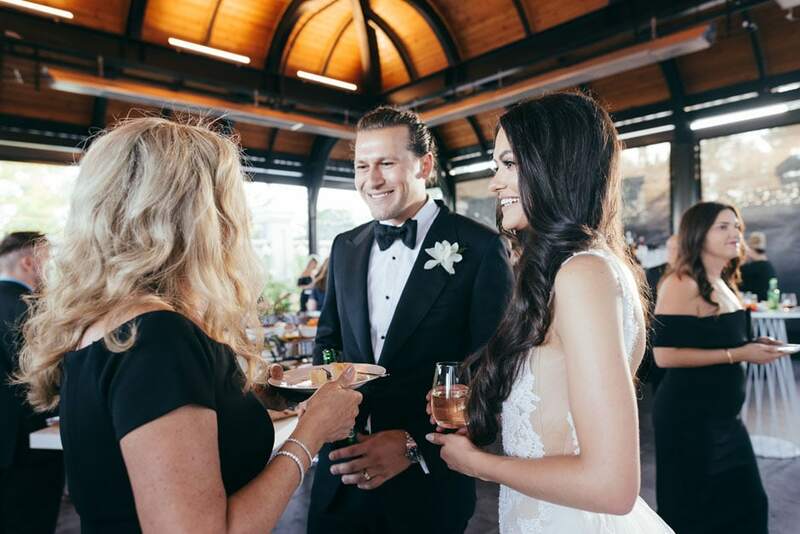 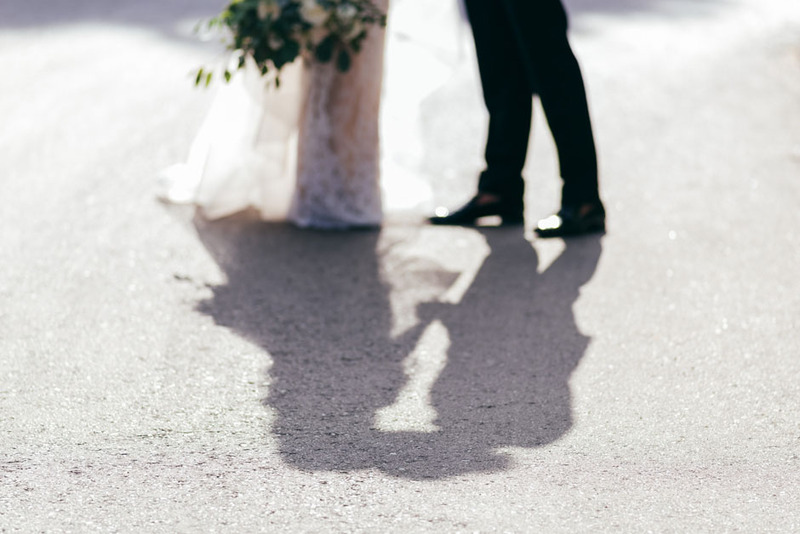 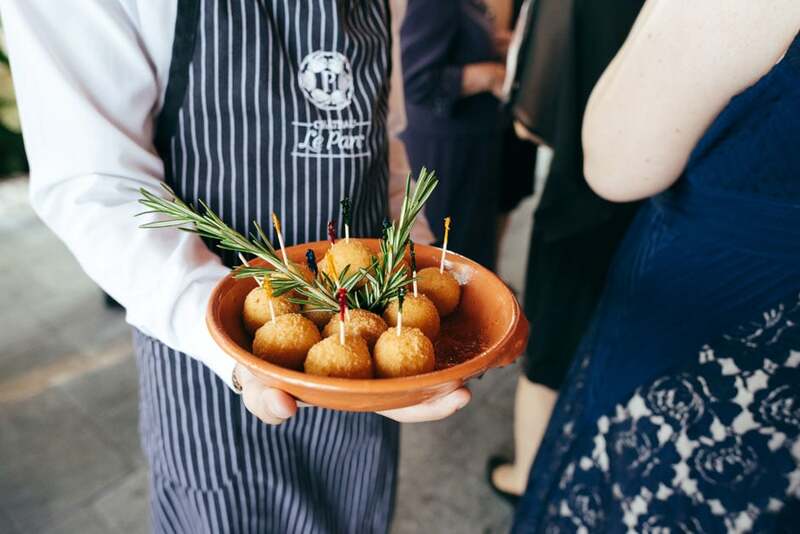 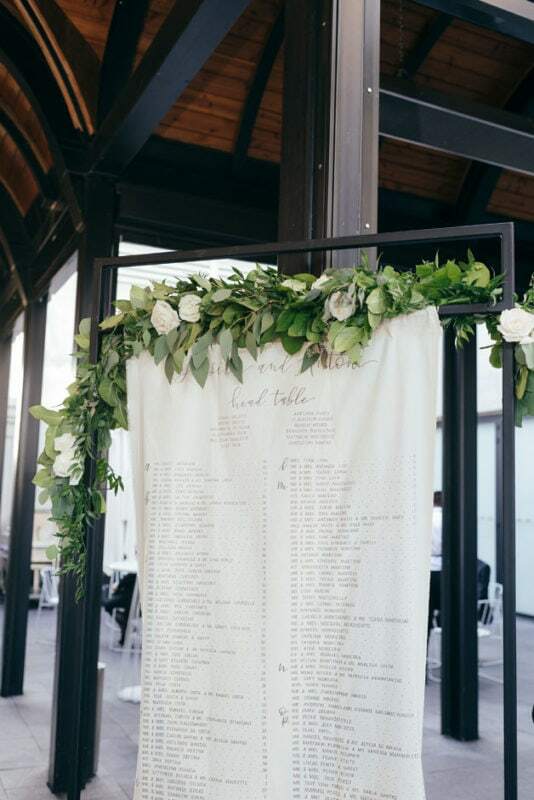 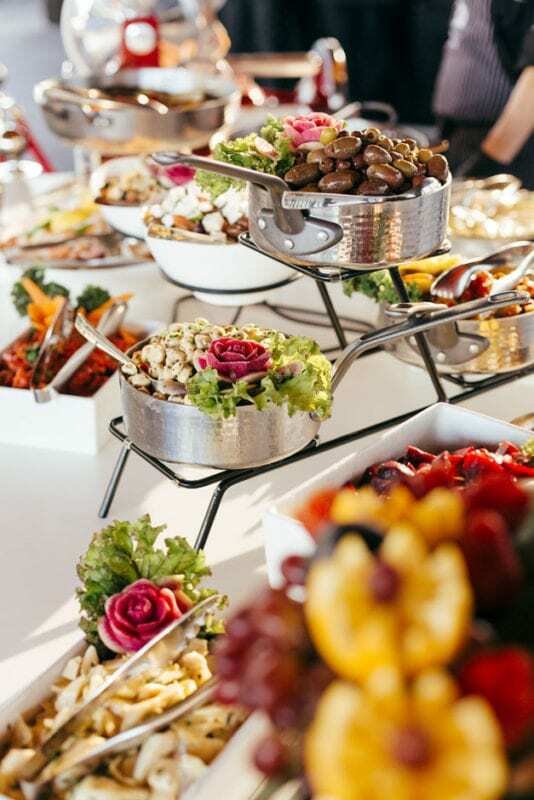 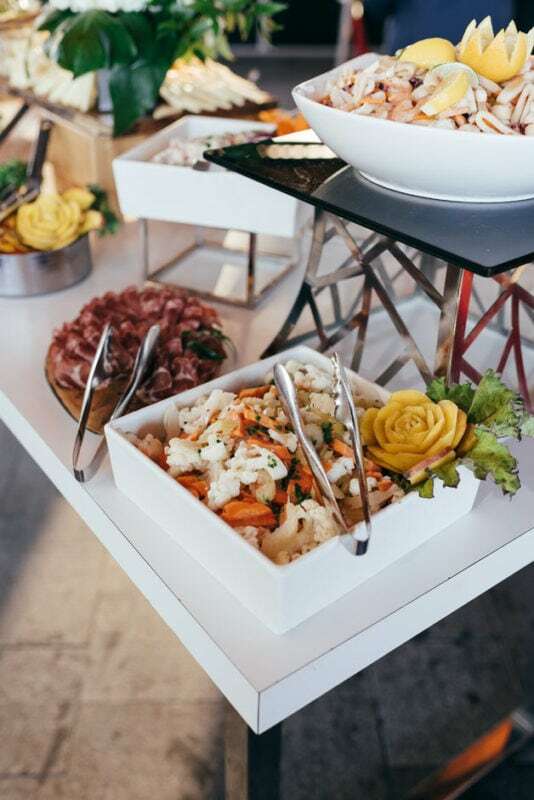 Following the bride and groom photo shoot, guests were invited to enjoy fabulous antipasto and drinks in the courtyard, whilst listening to live music and watching the sun go down. 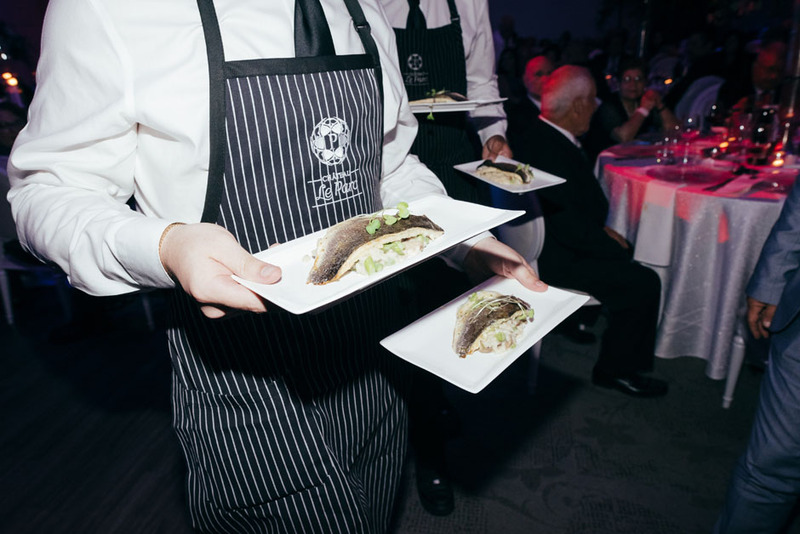 For dinner, to keep the appetite going, dinner courses were split up with speeches and dancing in between; this kept the atmosphere fun and interesting. 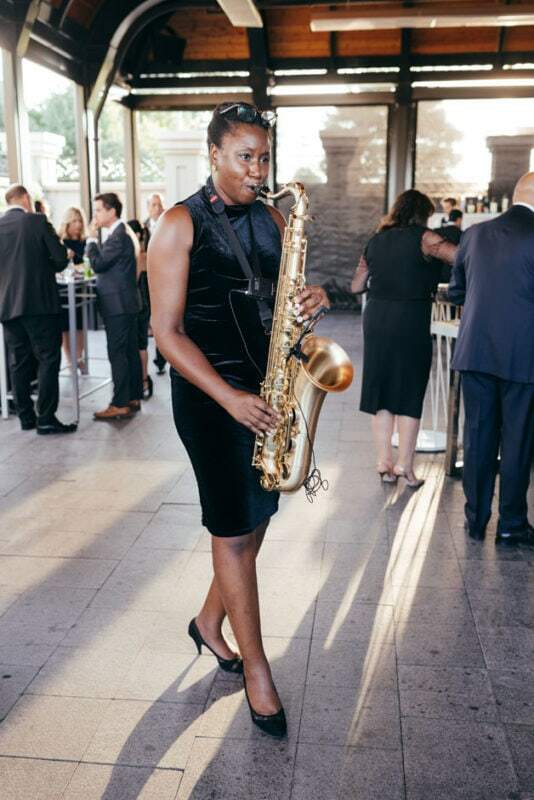 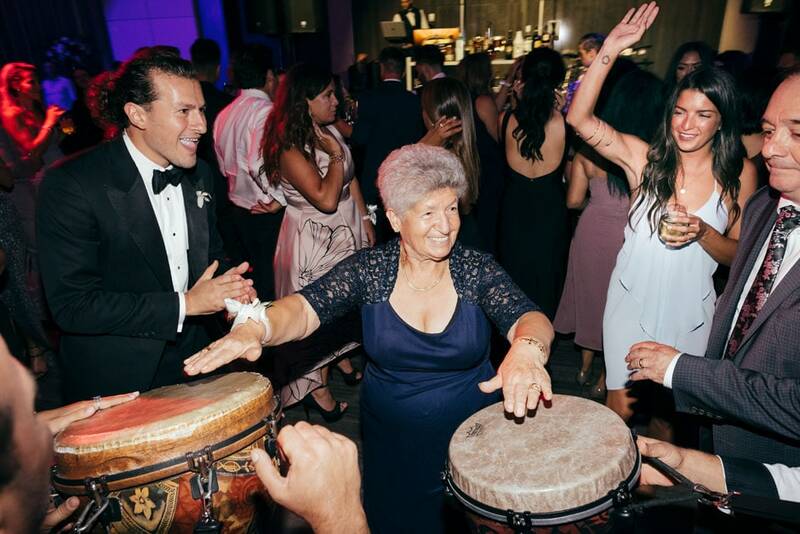 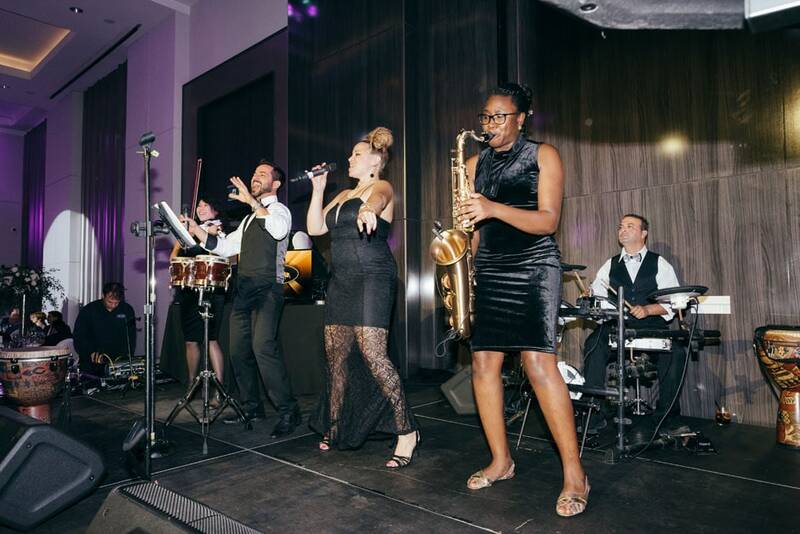 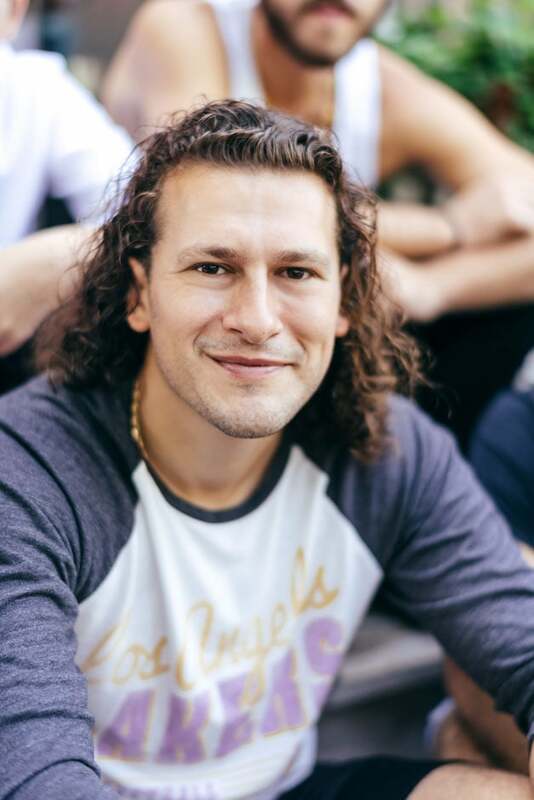 To top things off, a dance party ensued until the early hours of the morning, thanks in part to the amazing live musicians including a saxophonist, a violinist, and bongo drummers. 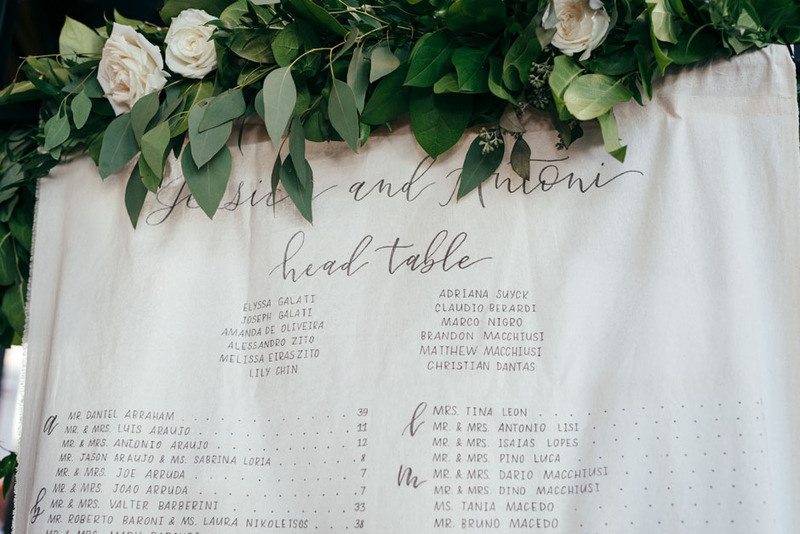 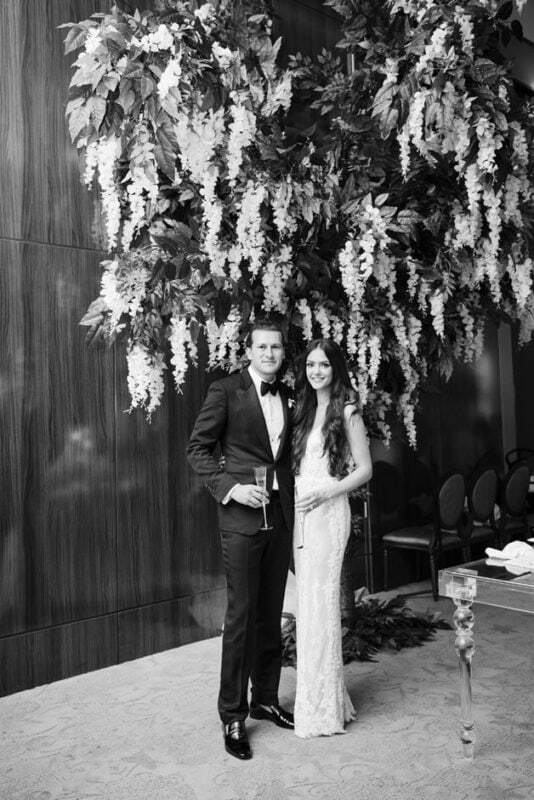 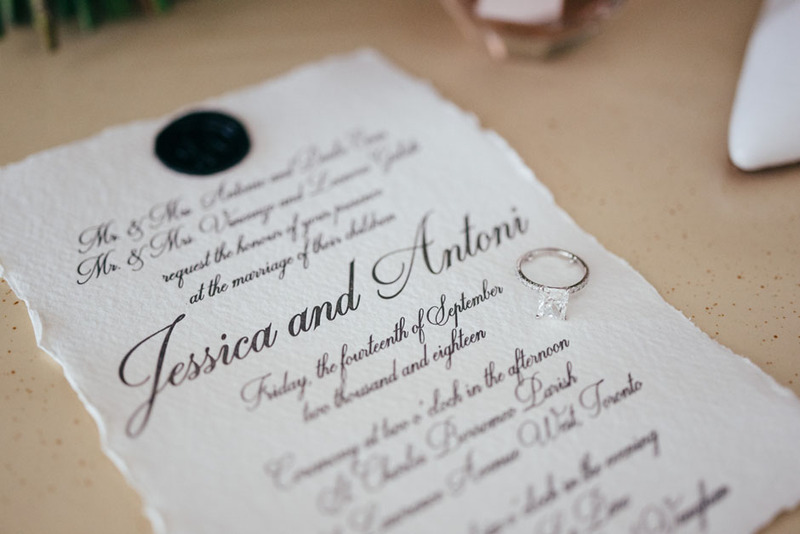 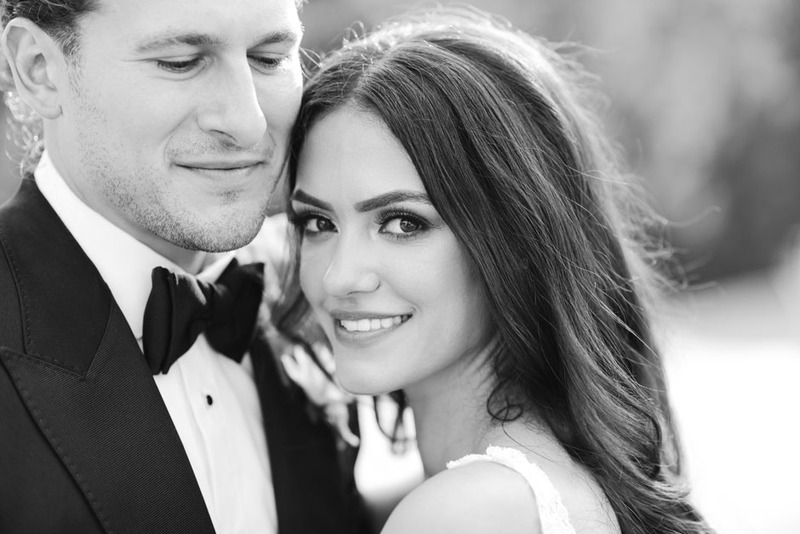 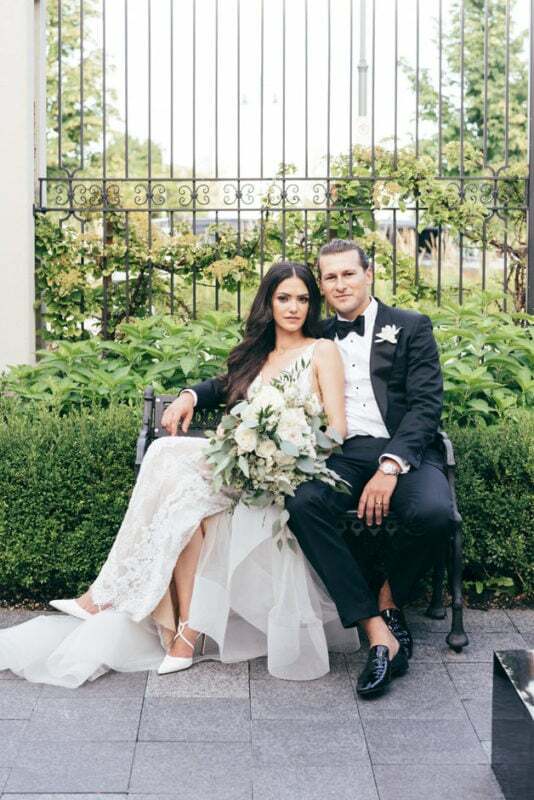 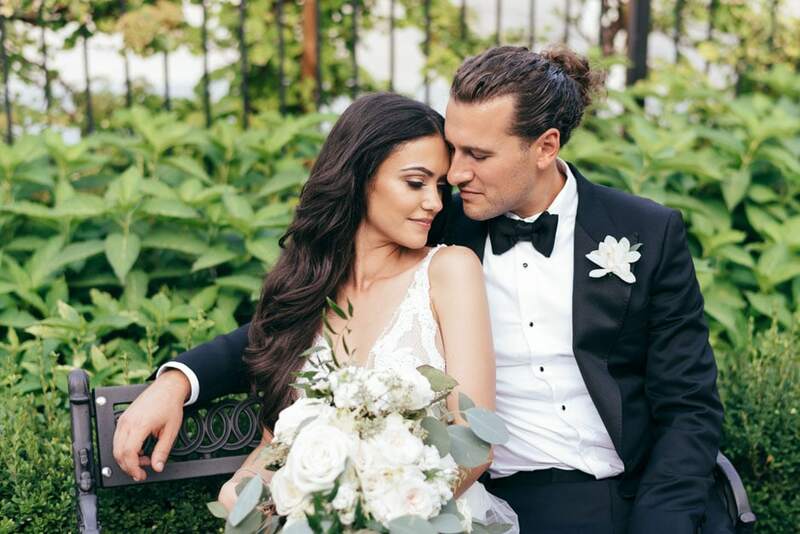 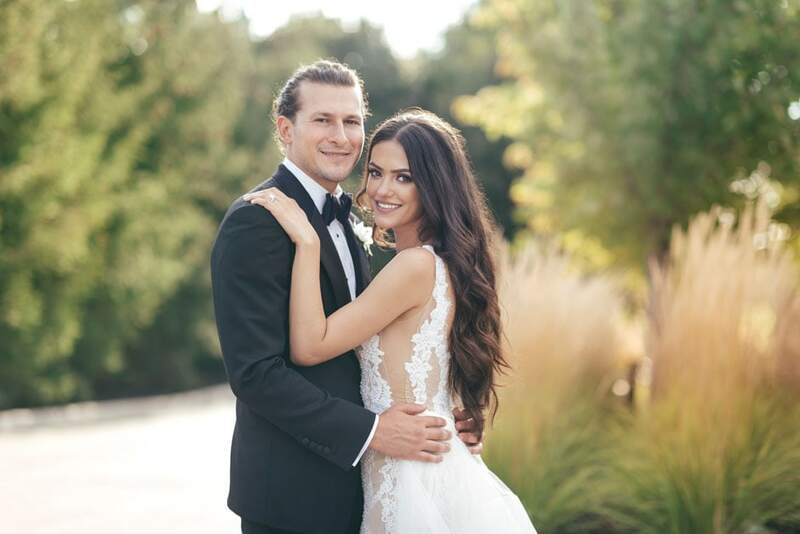 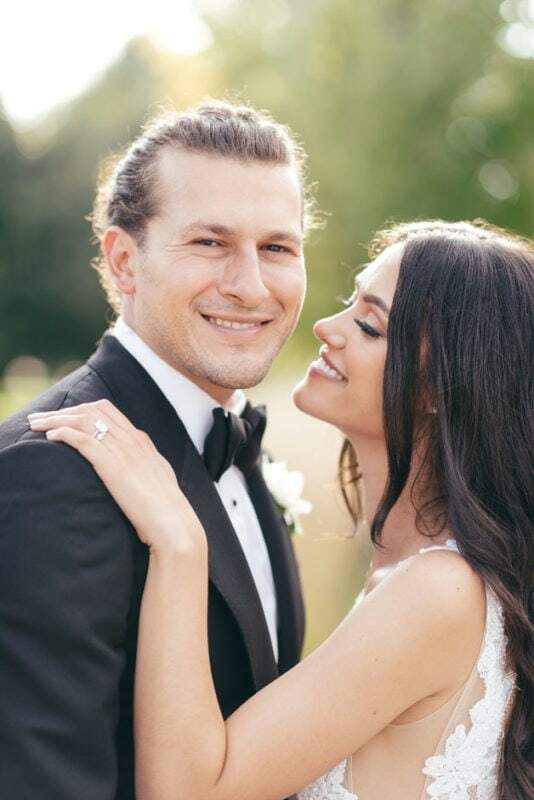 Congratulations Jessica and Antoni!